SIAC, which commenced operations in 1991 as an independent, not-for-profit organisation, has a proven track record in providing quality, neutral arbitration services to the global business community. The Singapore International Arbitration Centre (SIAC) is pleased to announce the official release of its 2018 Annual Report. SIAC's latest case statistics reaffirm its position as a premier global arbitral institution with one of the world’s largest administered caseloads. For the second year running, SIAC received over 400 cases, with total sums in dispute increasing. In 2018, SIAC received 402 new cases from parties in 65 jurisdictions. SIAC administered 375 (93%) of these new cases, with the remaining 27 (7%) being ad hoc appointments. SIAC has received over 400 cases in each of the last two years, and over the last decade, new case filings at SIAC have increased by more than 4 times. 2018 saw an increase, as compared with 2017, in SIAC’s total sum in dispute for all new case filings to USD 7.06 billion (SGD 9.65 billion). In 2018, SIAC was ranked the 3rd most preferred arbitral institution in the world by the prestigious Queen Mary University of London and White & Case International Arbitration Survey. The survey findings show that SIAC is the most preferred arbitral institution based in Asia. The United States topped the foreign user rankings in 2018 for the first time, while India and China both remained strong contributors of cases to SIAC. SIAC’s other top 10 foreign users were from a mix of common and civil law jurisdictions, namely, Cayman Islands, Hong Kong SAR, Indonesia, Japan, Malaysia, South Korea and the United Arab Emirates, attesting to SIAC's popularity among users all over the world. SIAC was the first major commercial arbitration centre to introduce the Early Dismissal (ED) procedure for the early dismissal of claims and defences in the SIAC Rules 2016. ED has since become an increasingly popular and effective tool for parties to save time and costs. In 2018, SIAC received 17 ED applications, bringing the total number of ED applications received to 22 as at the end of 2018, since this procedure was first introduced in 2016. On Thursday 21 February 2019, the seminar on “How international should international arbitration be? International standards v. domestic law in international commercial arbitration”, hosted by Norton Rose Fulbright in its new offices at Marina One, and jointly organised by SIAC and NYU’s Centre for Transnational Litigation, Arbitration and Commercial Law, attracted more than 100 attendees comprising a number of arbitration and litigation practitioners. Mr KC Lye (Partner, Norton Rose Fulbright) opened the evening by embarking on a short historical discourse and explaining how the concept of the nation state which first came about some five hundred years ago is a relatively young one when considered against the lineage of ancient civilisations. He explained how globalisation brought about pressures to conform to international standards and trends, resulting in an increasing tendency for nation states to insist on retreating into their respective microcosms. How would the pressures of greater internationalisation play out on the legal plane, specifically in the context of international arbitration? The stage for the ensuing discussions was set. The panellists included: Prof Lawrence Boo (Member, SIAC Court of Arbitration; Independent Arbitrator, The Arbitration Chambers), Ms Elodie Dulac (Partner, King & Spalding), Prof Franco Ferrari (Professor of Law, NYU; Director, Center for Transnational Litigation, Arbitration and Commercial Law, NYU), Dr Michael Hwang, SC (Chartered Arbitrator, Michael Hwang Chambers LLC) and Dr Friedrich Rosenfeld (Partner, Hanefeld Rechtsanwälte). The seminar took the form of a panel discussion moderated by Mr Kevin Nash (Deputy Registrar & Centre Director, SIAC). After a short introduction of the profile of speakers by Mr Nash, Professor Ferrari started by putting forward his proposition that while international arbitration processes should aspire to be as international as possible, they are fundamentally subject to the confines and limits of domestic rules (which in turn may themselves be subject to international instruments). He brought the house on a brief tour of how certain international arbitration instruments could be interpreted from this perspective, and cited a number of examples to buttress his point. The next speaker Ms Dulac sought to address the debate through a special lens: the practice of nation states using national laws (in domestic litigation proceedings) to either support anti-arbitration injunctions or grant orders which would have the effect of frustrating arbitration proceedings. Drawing from her own experience, Ms Dulac queried the effect of such attempts on the practice of international arbitration, and whether they eroded the "international" in "international arbitration". Taking over from Ms Dulac, Dr Rosenfeld shifted the discussion to the law and practice of legal privilege in international arbitrations and considered the debate from the point of view of what substantive law applies to privilege issues. He explained that there were at present two dominant approaches to legal privilege: the law of the seat of the arbitration, or the law of one the parties’ ‘home’ jurisdictions (e.g. nationality of that party). Dr Rosenfeld set out briefly his arguments in favour of an approach where amongst these possible contenders, it would be the law which is most in favour of protecting communications between a party and its lawyers from being disclosed. He also demonstrated how the divergence between common law and civilian law approaches on the law of legal privilege made this issue a complex and multi-faceted one. As the subsequent question and answer session would demonstrate, this was an issue which piqued the interest of a number of attendees. This was followed by Dr Hwang, who sought to approach the debate from a unique vantage point: that of an emergency arbitrator. More specifically, he focussed on the granting of interim relief by arbitrators in emergency arbitrations and drew upon his experience in an emergency arbitrator application filed about two months ago. This writer suspects it was probably not an experience many of the attendees could directly relate to. To the amusement of the audience, Dr Hwang recounted the somewhat exasperating experience of having to look up decisions cited in the footnotes in a leading arbitration text (a certain "Chapter 17") and questioning the progeny of some of the decisions cited. Dr Hwang advocated a view where these issues should be determined largely by reference to the law of the seat of the arbitration, and gave reasons in support of this view. Coming up as last speaker, Professor Boo advanced the view that arbitral tribunals could afford to take more guidance from international instruments and norms on issues where the relevant national rules were either silent on or stopped short of providing an adequate answer. For example, he queried whether emergency awards could comfortably fit within the regime of the UNCITRAL Model Law bearing in mind that the concept of emergency awards may not conceivably have been in the mind of the drafters of that instrument at the material time. In the process of his presentation, Professor Boo also responded to some of the views Professor Ferrari and Dr Hwang propounded earlier in their presentations. From this writer's viewpoint, an eight minute discussion frankly could not have done justice to the complexity of those issues. Perhaps a follow-up seminar would be in order, SIAC? As with every well-executed seminar, the "Question & Answer" segment came up last. Questions were posed to all of the speakers, including questions on how issues of limitations and legal privilege might be considered against this international / national divergence. The topic of legal privilege, in particular, proved to be a lightning rod for questions and Dr Rosenfeld was asked for his views on how he thought tribunals should respond when faced with two different standards of legal privilege. Which standard should trump? Needless to say, there were forceful submissions which could be advocated for either side. This writer suspects many attendees walked away from the seminar that night with more questions than answers (some with much redder faces than when they showed up). If anything, that evening suggested that the issues canvassed were far from straightforward and are likely to remain ripe for future debate and discussions. The Singapore International Arbitration Centre (SIAC) is pleased to announce that Ms Shwetha Bidhuri has been appointed to the position of Head (South Asia). Shwetha succeeds Mr Pranav Mago who has left SIAC to pursue other career opportunities. As Head (South Asia), Shwetha will be based in Mumbai, India, and will oversee SIAC’s liaison offices in Mumbai and GIFT City, Gujarat. Prior to joining SIAC, Shwetha worked in the dispute resolution practice of a leading law firm in New Delhi for 9 years, with a focus on investment treaty arbitration as well as commercial litigation cases. Happy New Year from all of us at SIAC and best wishes for a happy, healthy and successful 2019. As we welcome the new year, we look back fondly at some of the key highlights of 2018. In May 2018, the prestigious Queen Mary University of London and White & Case International Arbitration Survey (QMUL Survey) ranked SIAC as the 3rd most preferred arbitral institution in the world, making SIAC the most preferred arbitral institution based in Asia. Singapore has also been ranked as the 3rd most preferred seat worldwide, after London and Paris, making Singapore the most preferred seat in Asia. In its eighth edition, this year’s QMUL Survey is reported to be the most “comprehensive empirical study” ever conducted by the university. The findings in the QMUL Survey confirm SIAC’s standing as a leading, world-class arbitral institution, and Singapore’s position as a popular arbitral seat. In June 2018, Prof Lucy Reed was appointed as Vice President of the SIAC Court of Arbitration. Prof Reed is the Director of the Centre for International Law and Professor on the Law Faculty of the National University of Singapore. She previously led the global international arbitration group in Freshfields Bruckhaus Deringer, and has represented private and public clients in investment treaty and commercial arbitrations for more than 35 years. 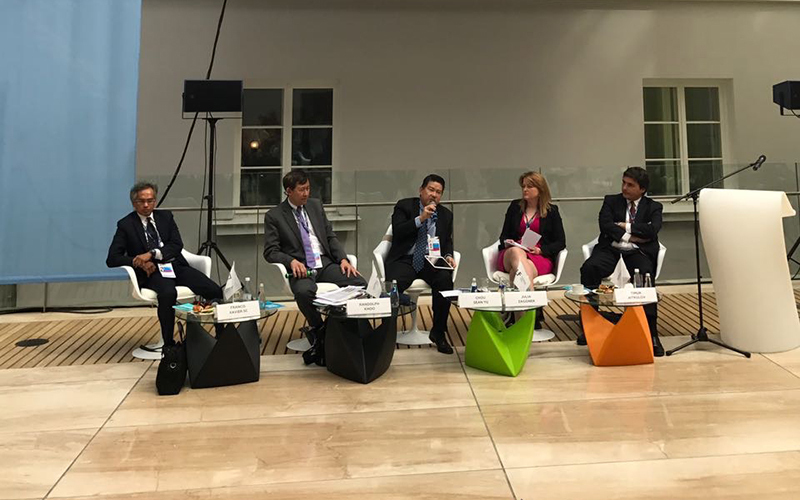 SIAC’s flagship biennial event, the SIAC Congress, was held in May 2018 as part of the SIAC Congress Week (14 – 18 May 2018), and brought together distinguished members of the judiciary, the SIAC Board of Directors, the SIAC Court of Arbitration, and other leading international arbitration experts. The SIAC Congress 2018 attracted 297 delegates from 16 jurisdictions. Special highlights of the Congress programme included a Keynote Speech by the Honourable Chief Justice of Singapore, Mr Sundaresh Menon, on the special role and responsibility of arbitral institutions in charting the future of international arbitration, and an Opening Address by Mr Heng Swee Keat, Minister of Finance, Singapore. 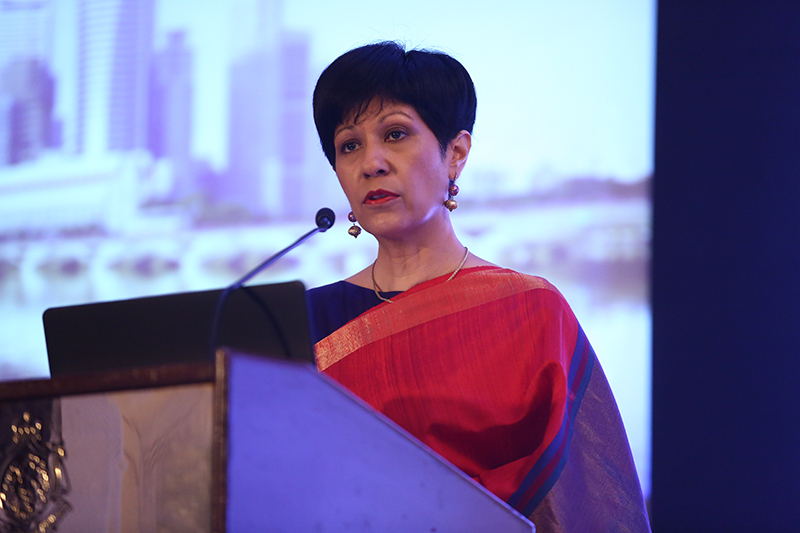 Ms Indranee Rajah, SC, Minister in the Prime Minister’s Office and Second Minister for Finance and Education, Singapore, delivered the Opening Address for the Gala Dinner. 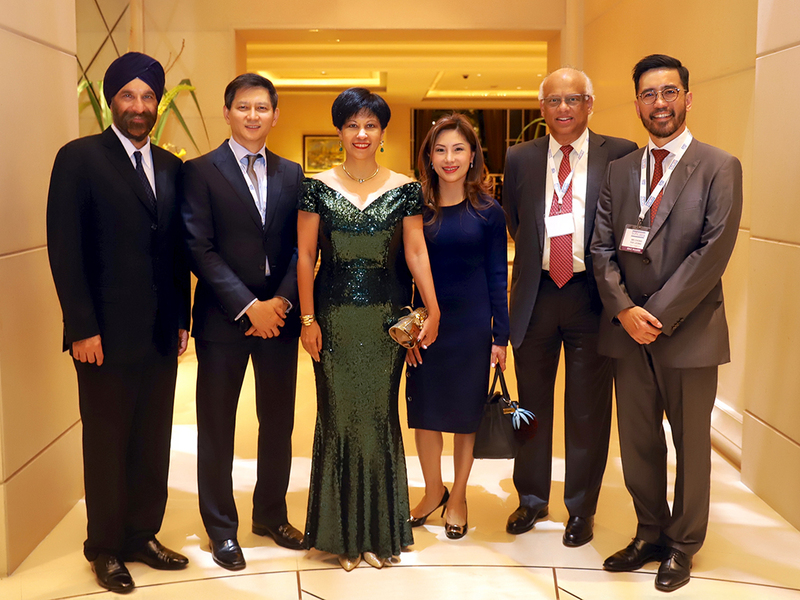 The Gala Dinner was graced by Justice Vinodh Coomaraswamy, Justice Kannan Ramesh, Justice Tan Siong Thye, and Justice Valerie Thean of the Supreme Court of Singapore, as well as Mr Shakil ur Rehman Khan, Advocate General for the Province of Punjab, and Mr Naseer Ahmed Bhutta, Special Assistant to the Prime Minister of Pakistan. The other events held during the SIAC Congress Week included the “Multiplicity-Managing Parallel Proceedings under Multiple Instruments” seminar, the SIAC-CIL Academic-Practitioner Colloquium, the SIAC-CIArb Debate, the SIAC-YSIAC Workshop: IBA Arb40 Toolkit for Award Writing, and the “Twilight Issues in International Arbitration” seminar. 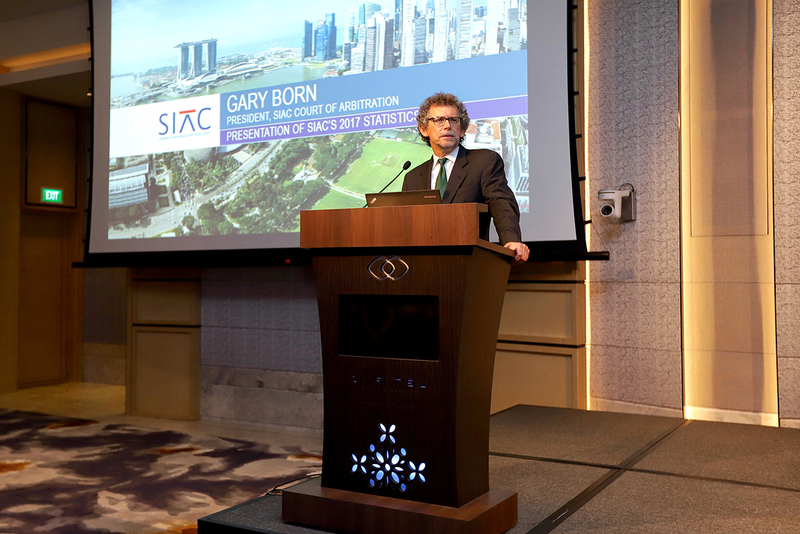 The inaugural SIAC Academy titled “Time and Cost Savers at SIAC: Emergency Arbitration, Expedited Procedure and Early Dismissal”, was held in Singapore in November 2017. 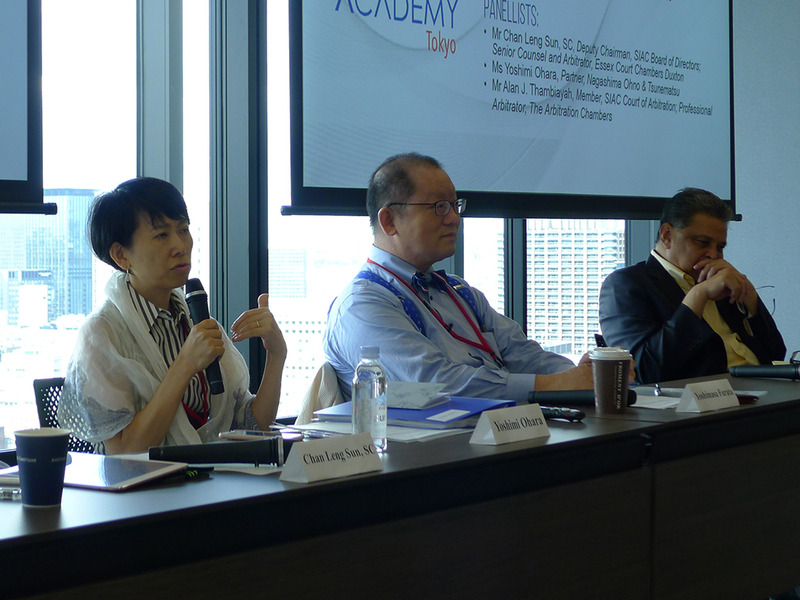 Following the success of the Singapore edition, overseas editions of the SIAC Academy were conducted in the course of 2018 in Beijing, Mumbai, Seoul and Tokyo. Chaired by Mr Gary Born, SIAC Court President, the teaching faculty of the overseas SIAC Academy included Mr Chan Leng Sun, SC, Deputy Chairman of SIAC, Prof Lucy Reed, SIAC Court Vice President, and members of the SIAC Court of Arbitration, including Mr Cao Lijun, Prof Lawrence Boo, Dr Eun Young Park, Mr Darius J. Khambata, SA, Mr Hiroyuki Tezuka, Mr Alan J. Thambiayah and Mr Alvin Yeo, SC. 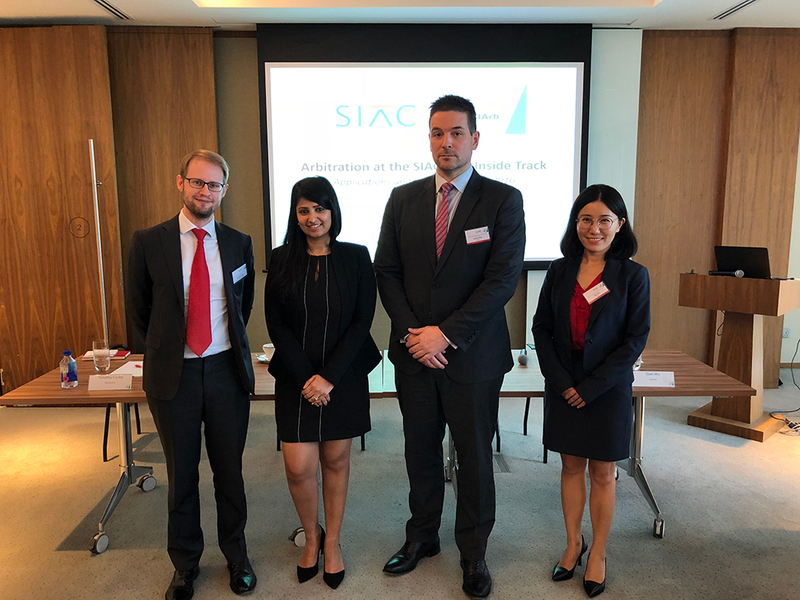 In collaboration with the National University of Singapore (NUS) Law Faculty, SIAC conducted the inaugural SIAC module titled “SIAC and Institutional Arbitration” in September 2018. The SIAC module introduced to participants the role and function of arbitral institutions in the practice of international arbitration, and the complex issues that arbitral institutions face in the administration of arbitrations, including, amongst others, appointment of arbitrators, issuance of arbitral rules and practice notes, and guiding and shaping the development of international arbitration. 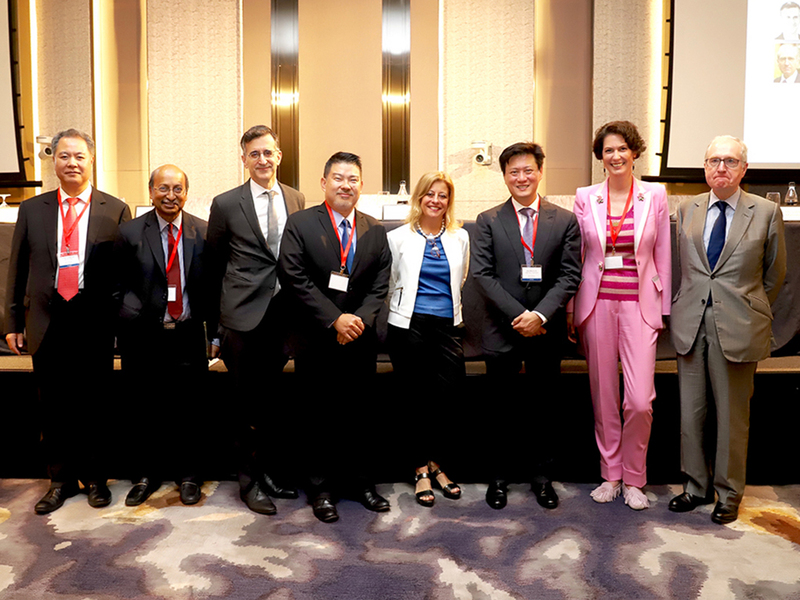 The course convenor for the SIAC module was Mr Gary Born, SIAC Court President, and the lecturers included Mr Davinder Singh, SC, Chairman of SIAC, Mr Chan Leng Sun, SC, Deputy Chairman of SIAC, members of the SIAC Court of Arbitration, Dr Claudia Annacker, Prof Lawrence Boo and Mr Alvin Yeo, SC, and the SIAC Secretariat. 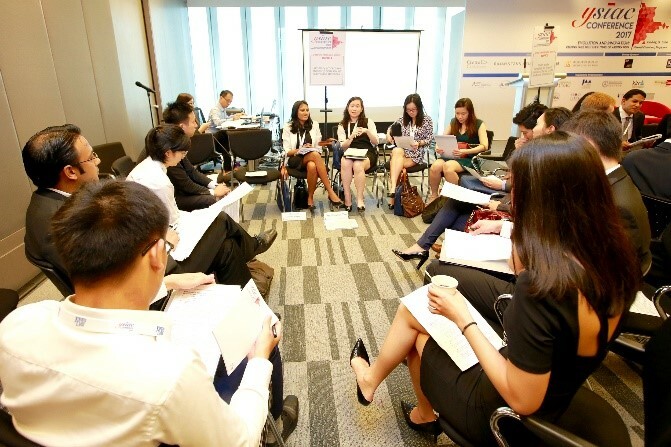 The SIAC module was fully subscribed by NUS Law students and practitioners from Singapore and abroad. Feedback from participants was extremely positive. 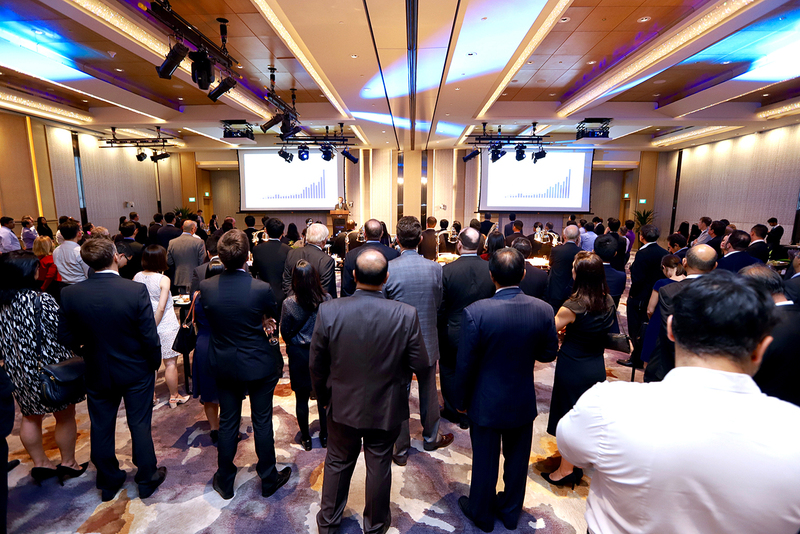 In 2018, SIAC held its annual overseas conferences in Beijing, Mumbai, Seoul and Tokyo. 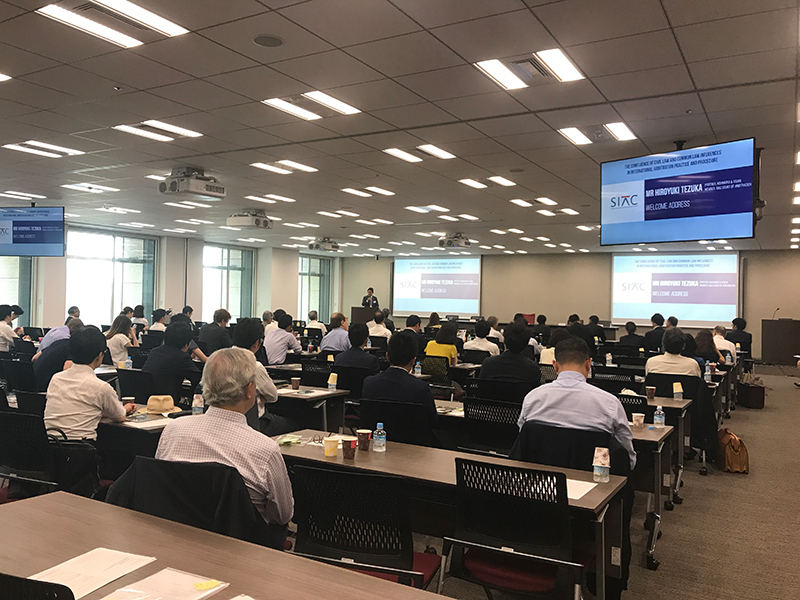 SIAC partnered with the China International Economic and Trade Arbitration Commission (CIETAC) and the Japan Association of Arbitrators (JAA) to jointly organise the annual overseas conferences in Beijing and Tokyo respectively. 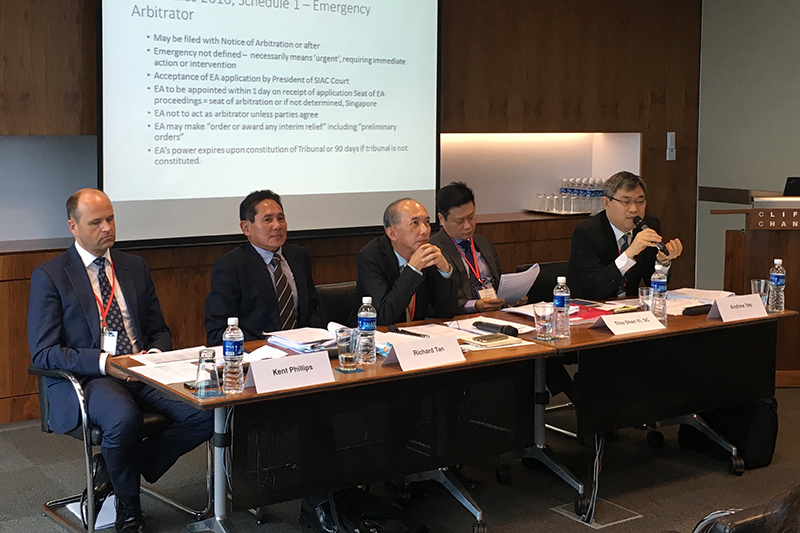 SIAC also held joint seminars with the Korean Arbitrators Association (KAA) in Seoul, and with the Singapore International Mediation Centre (SIMC) and the Vienna International Arbitral Centre (VIAC) in Singapore. 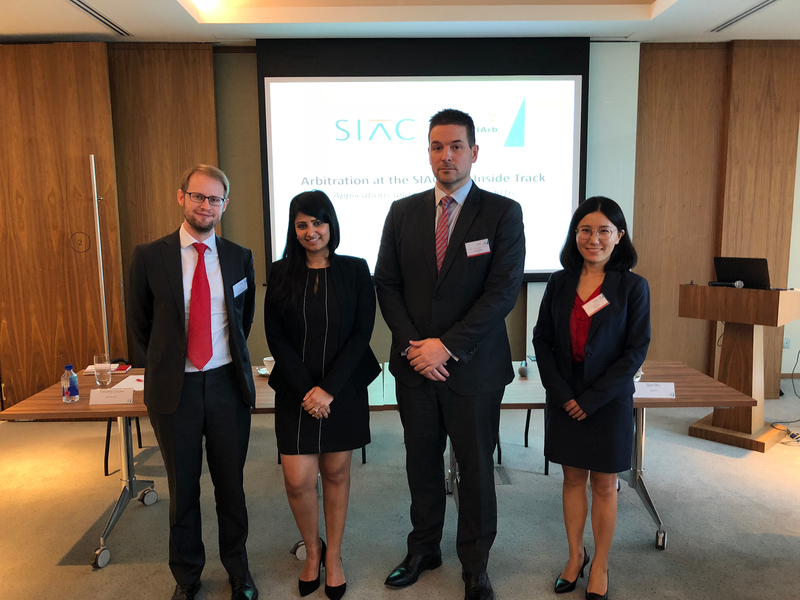 In collaboration with the Chartered Institute of Arbitrators, Singapore branch, SIAC held a Three-Part Workshop titled “Arbitration at the SIAC: The Inside Track” in Singapore. 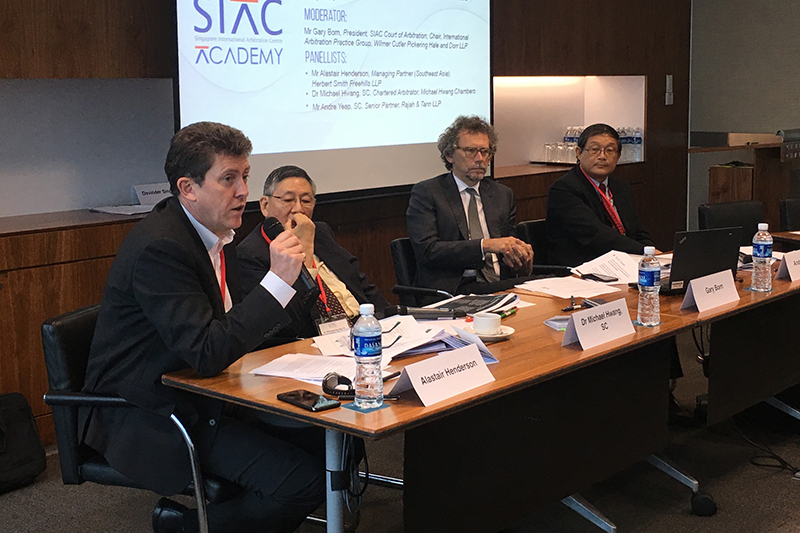 Speakers for the workshop series included Mr Gary Born, SIAC Court President, and members of the SIAC Secretariat who provided an insider’s perspective to SIAC arbitration. In 2018, SIAC signed various Memoranda of Understanding (MOU) with CIETAC, Shenzhen Court of International Arbitration (SCIA) and the Xi’an Arbitration Commission (XAAC). The MOUs underscore SIAC’s commitment to promote international arbitration as the preferred mode of dispute resolution for cross-border commercial and investment disputes, particularly in the context of the Belt and Road initiative. A host of exciting YSIAC workshops and events took place in 2018. 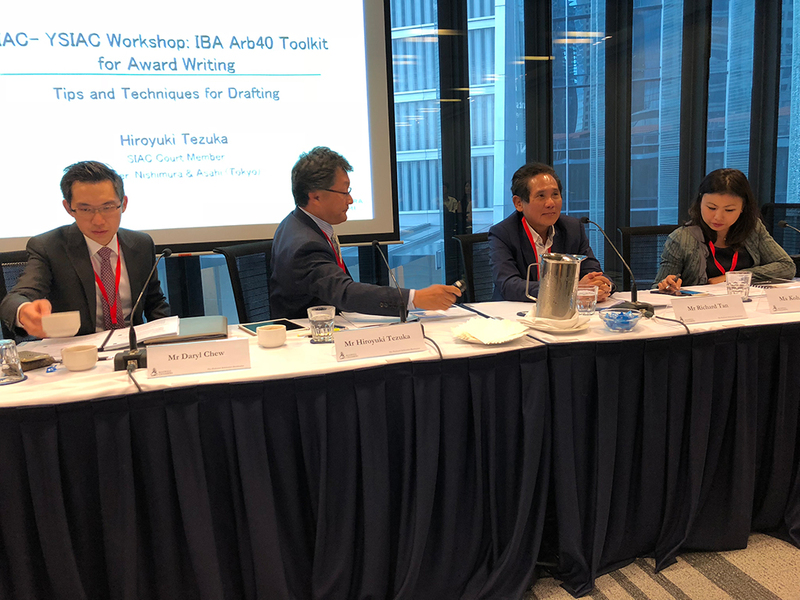 Apart from the SIAC-YSIAC Workshop: IBA Arb40 Toolkit for Award Writing held during the SIAC Congress Week, YSIAC workshops on “Disclosure and Document Production in International Arbitration” were organised in Beijing, Mumbai, Seoul and Tokyo. 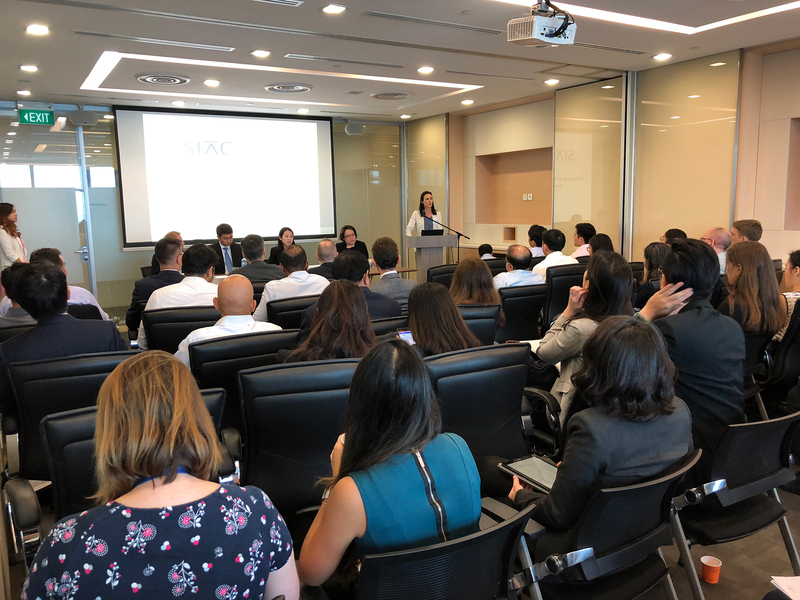 These workshops featured a panel discussion and a mock hearing for a discovery application, providing younger practitioners with the opportunity to test their advocacy skills in a real world arbitration scenario before leading arbitration experts. 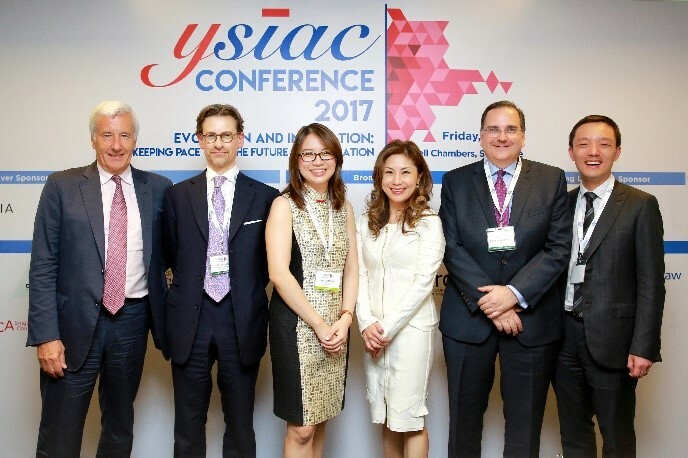 Other YSIAC events organised in 2018 included the YSIAC debate on the motion “Tribunals with Women Arbitrators make Better Decisions”, lunchtime talks with Mr Gary Born and Mr Toby Landau QC, as well as the YSIAC Club event titled “The Role of Public Policy in Enforcement of Arbitral Awards”. The fourth YSIAC Essay Competition held in March 2018 received a record 116 entries from 29 jurisdictions. The winner was Mr Tan Jun Hong of the Supreme Court of Singapore. The 1st Runner Up was Mr Koh Will Sheng Wilson of Drew & Napier LLC and the 2nd Runner up was Mr Parth Jain of George Washington University Law School. 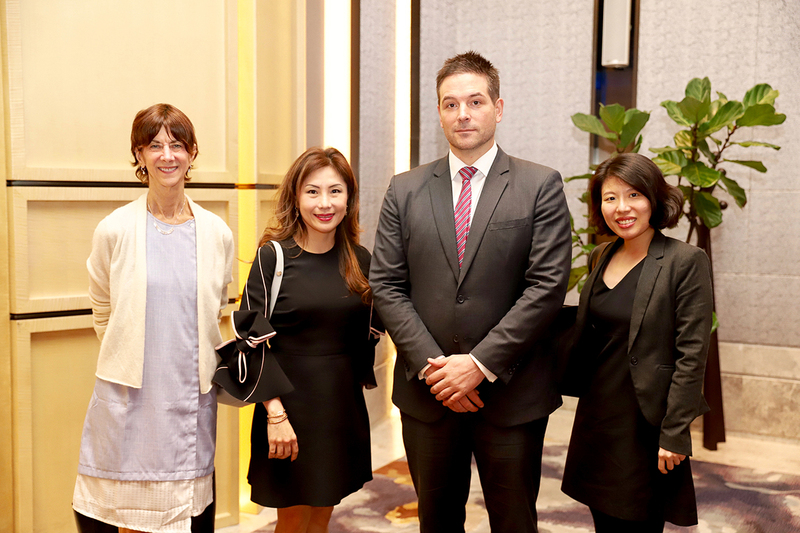 The Asian International Arbitration Journal (AIAJ), which commenced publication in 2005, has been relaunched with Wolters Kluwer as publisher for the online and print editions of the AIAJ. 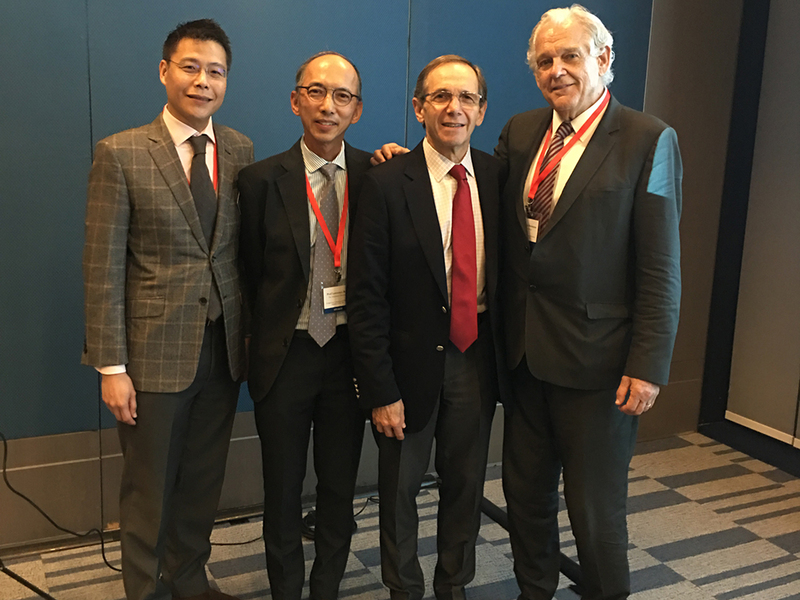 Mr Gary Born, SIAC Court President, joins Professor Lawrence Boo, SIAC Court member, as General Editors of the journal. 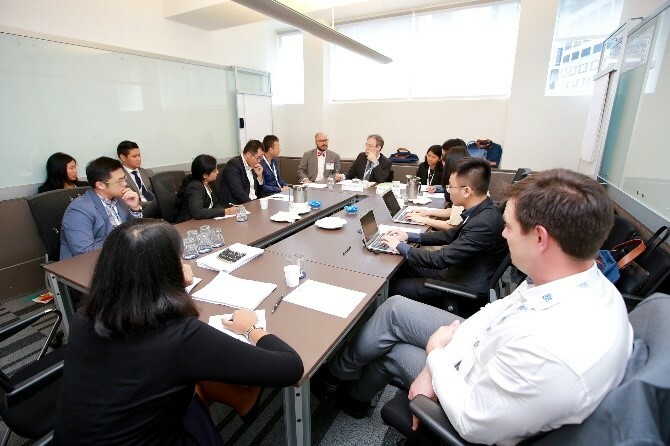 The AIAJ seeks to be the thought leader on issues in international arbitration in the Asia-Pacific region by providing a forum for original thinking and incisive analysis. The journal carries articles, notes on awards, legislation updates and book reviews. We would like to express our sincere thanks and appreciation to members of the SIAC Board, Court and the YSIAC Committee as well as all of our partners and friends in the local and international legal and business communities for their valuable contributions and consistent support. 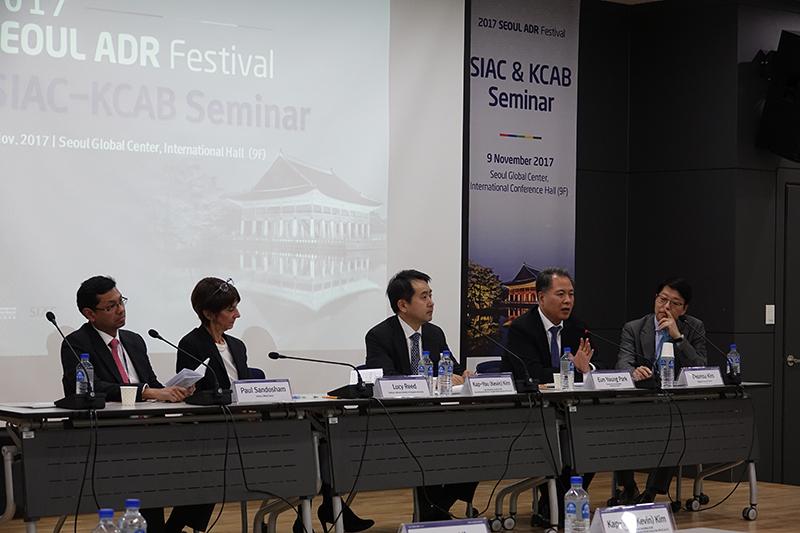 The Seoul ADR Festival Seminar, hosted by SIAC and the Korean Arbitrators Association (KAA) on 7 November 2018, was an opportunity for practitioners to join "A Conversation with International Arbitral Institutions". 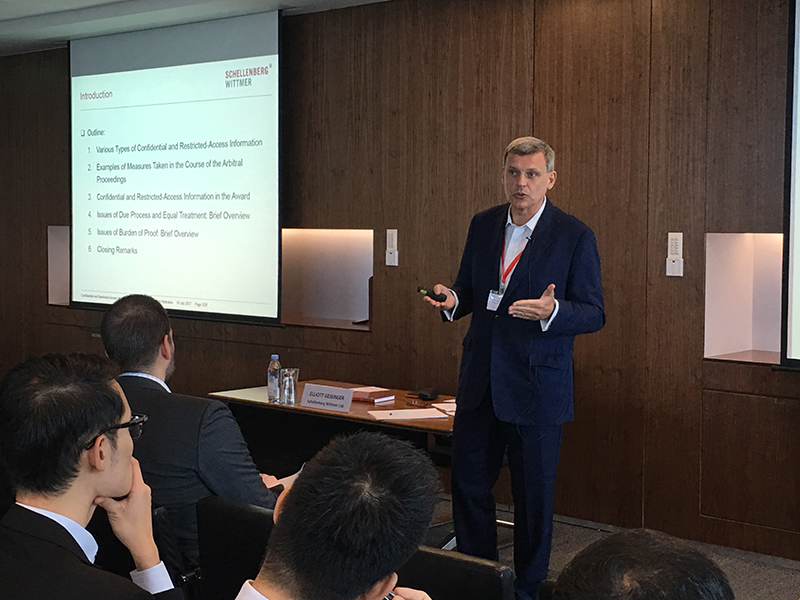 Insights were shared on a range of topics including the appointment of arbitrators and the inner workings of international arbitral institutions. A consistent theme was the importance of cooperation between institutions, to create a larger "mooncake" that all those in the international arbitration field can share. 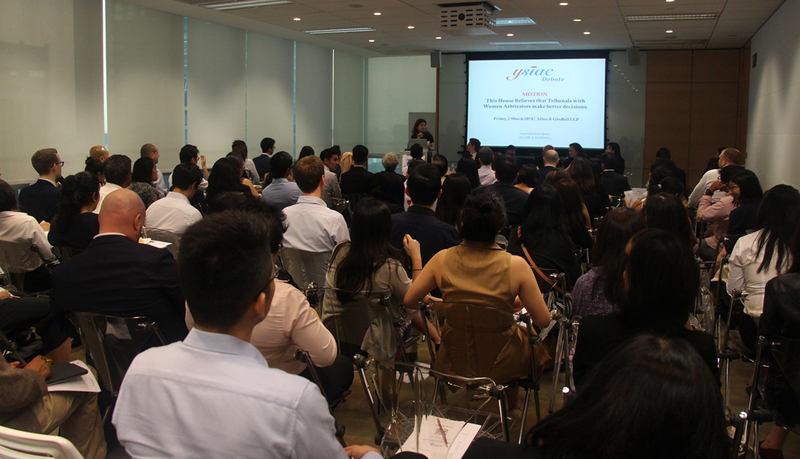 The seminar was well-attended by practitioners, in-house counsel and academics. The opening address was delivered by Mr Ki-Su Lee (Chairman and CEO, KAA), where he welcomed practitioners, academics, a former judge and former presidents of the KAA to the conference. In the first session, Mr Michael Lee (Vice President, International Centre for Dispute Resolution (ICDR), American Arbitration Association (AAA)) shared his insights on how to build a career as an international arbitrator. 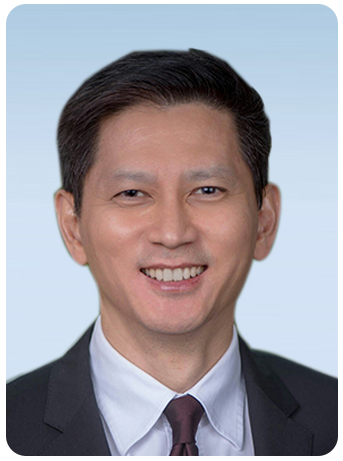 Mr Lee noted the lack of a requisite exam or qualification to "become" an arbitrator, and that an arbitrator’s career often begins by being a party-appointed arbitrator before joining the panel of an arbitral institution. Mr Lee emphasised the central importance of building one’s reputation and credibility as an arbitrator. Mr Xu Wei (Deputy Secretary General, China International Economic and Trade Arbitration Commission (CIETAC)) then gave his observations on the growth of arbitration in China. In 2017, for example, CIETAC accepted 2,298 arbitration cases and also launched the Public-Private Partnership Arbitration Centre. Mr Xu also expressed a desire for more collaboration between CIETAC and Korean arbitral institutions. In the next session, Mr Chan Leng Sun, SC (Deputy Chairman, Singapore International Arbitration Centre (SIAC); Senior Counsel and Arbitrator, Essex Court Chambers Duxton) considered the special features of maritime arbitration in Singapore and London, highlighting the different practices, rules and culture of the arbitral institutions that specialise in maritime disputes. For example, the use of "umpires" is a unique feature of maritime arbitration, and the London Maritime Arbitration Association does not administer the arbitration and instead adopts a very "light touch" approach. In addition to providing a practitioner's insight into maritime arbitration, Mr Chan's presentation pointed to the potential of maritime arbitration as a source of inspiration for improvement of procedures in commercial arbitrations. It will be interesting to see if cross fertilisation of ideas for improvement would lead to the adoption of "umpires" and other unique features of maritime arbitration in general commercial arbitration. The final session was a lively discussion moderated by Dr Hongseok Aaron Kim (Vice Chairman, KAA) with the panel comprising Mr Chan, Mr Chen Zhao Hui (Deputy Secretary General, CIETAC Fujian Sub-Commission), Mr Kevin Nash (Deputy Registrar and Centre Director, SIAC), Mr Lee and Mr Xu. 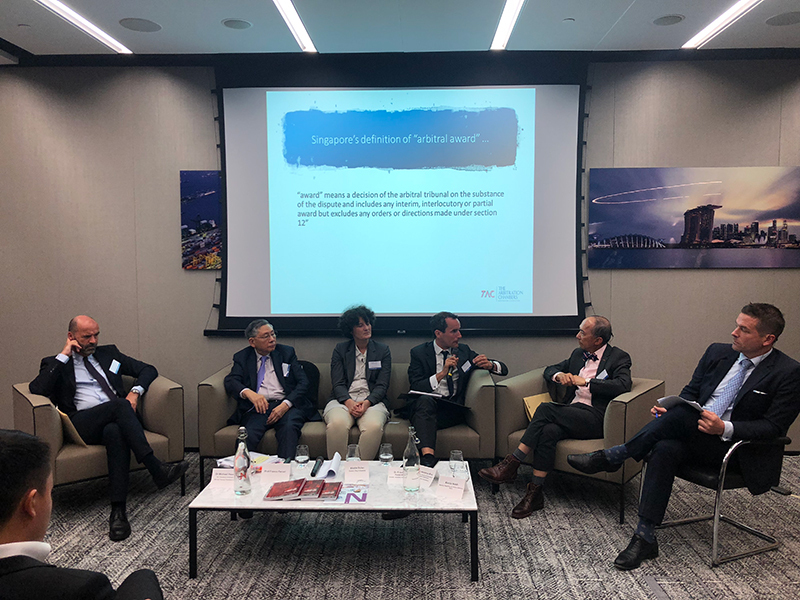 The panel first delved into the question of how to be appointed as an arbitrator and the essential qualities, experience or skills that an arbitrator requires. Mr Lee and Mr Chen emphasised the distinction between being listed on an institutional panel and actually being appointed in a particular case. A particular focus was on the need to gain experience as an arbitrator, which Mr Nash described as a 'chicken and egg' situation that faces younger arbitrators seeking out their first appointment. 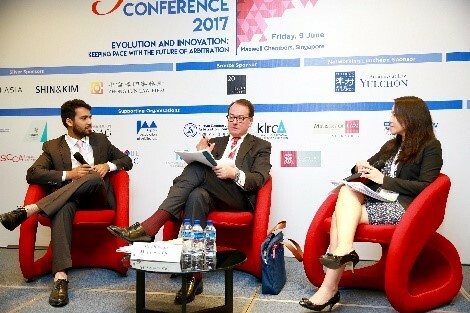 The panellists then shared their perspectives on the issue of arbitrator fees, which are often calculated either on the basis of an hourly rate or a percentage of the sum in dispute. Mr Lee acknowledged the difficulties here with his answer that "it depends". 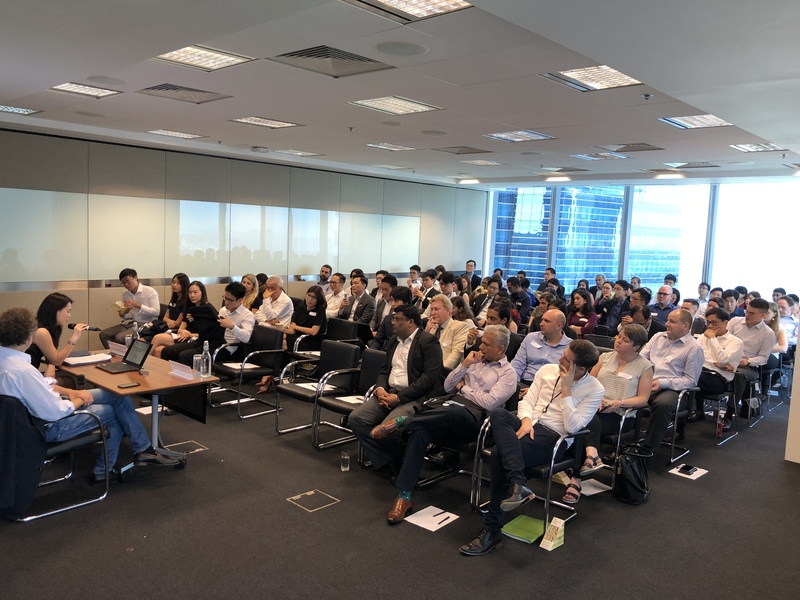 Mr Chan emphasised the connection with the complexity of the case as well as the skills and experience of the arbitrator – but noted that typically younger arbitrators would be willing to take on smaller value cases to gain the necessary experience. 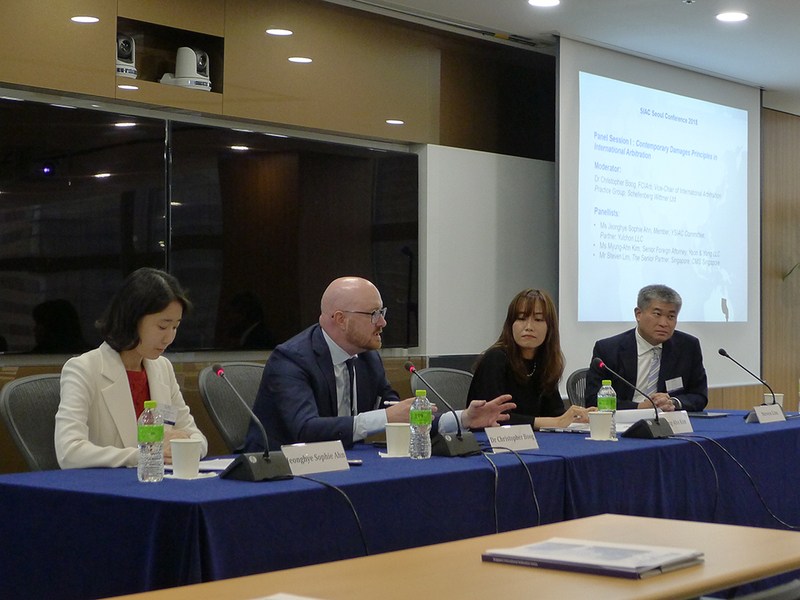 Mr Nash discussed the ICC Commission report indicating the usual spread of fees in a typical arbitration being 83% in counsel fees, 15% in arbitrator fees and 2% in the institution's administrative fees – and that generally counsel and the arbitrator are happy where the ratio is approximately 5:1. 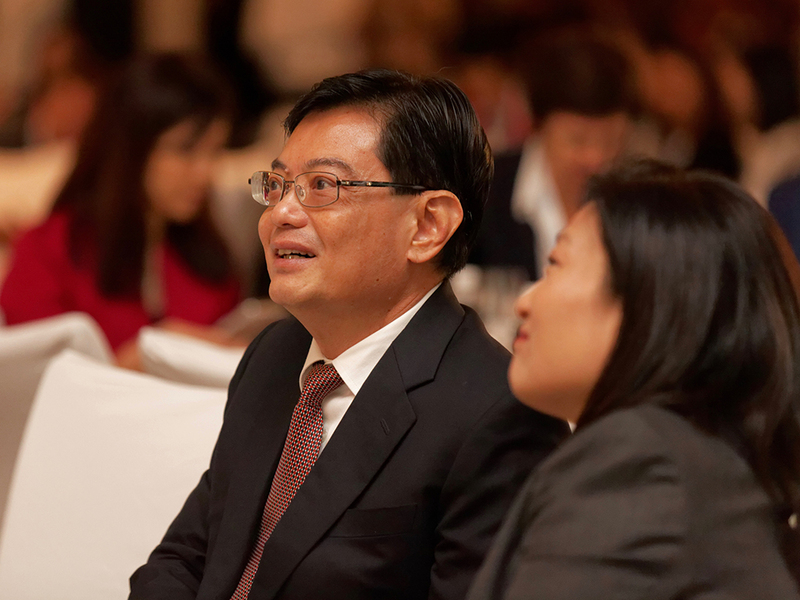 In discussing the scenario where a party refuses to pay its share of the arbitrator fees (particularly in the context where there is increasing use of contingency fees and third party funding), the panel agreed with Mr Chen's comments about the importance of obtaining appropriate and timely deposits from the parties. 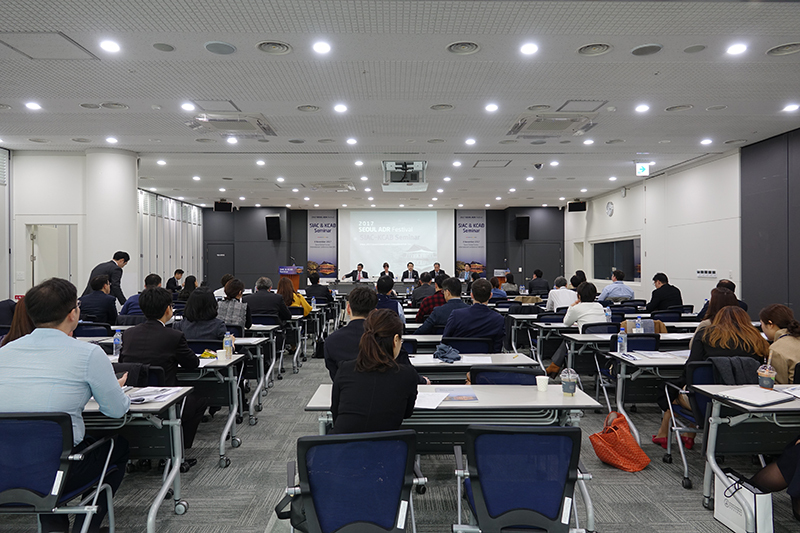 The discussion then turned to what each arbitral institution was doing to support the Korean community in the field of international arbitration. 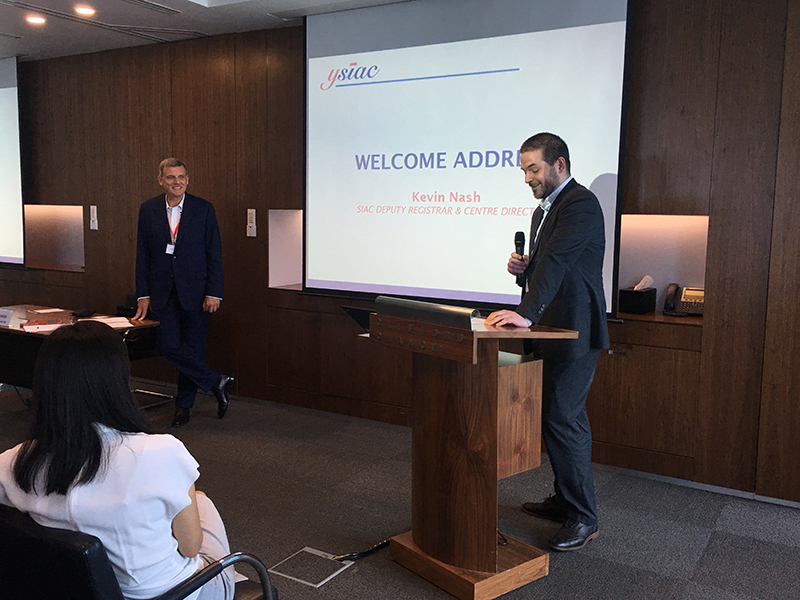 Mr Nash noted the growth of SIAC in Korea, and that Korean parties have constantly been within the top ten foreign users of SIAC, with Korean arbitrators being the seventh most frequently appointed at SIAC. Mr Nash also mentioned the efforts of Ms Seah Lee (Head (North East Asia), SIAC) and the importance of her role in the Korean market. Mr Chen added that there are many similarities between China and Korea, and asked whether Koreans are familiar with Chinese mooncakes. He used the analogy that all those working in arbitration are dividing up a mooncake to share – and that we should be trying to make a bigger mooncake through cooperation among arbitral institutions. In doing so, everyone can get a bigger share. What was implied in these discussions was that this cooperation would lead to better procedures that are more just and efficient, thereby making international arbitration more attractive for its users, compared to other forms of dispute resolution. The closing remarks of Mr Chan returned to this theme of cooperation and collaboration between arbitral institutions in order to improve the arbitral process and serve the business community. This echoed his earlier remarks about the fact there is a real dialogue occurring between arbitral institutions which has led to some harmonisation of practices and the creation of consistent experiences for end users. The final message was that arbitral institutions should work together to make a "better, bigger and more delicious mooncake". The Singapore International Arbitration Centre (SIAC) is pleased to announce that it has entered into a Memorandum of Understanding (MOU) with the Peking University Law School (PKU LAW). Under the MOU, SIAC and PKU LAW will work together to place law students from PKU in internships at SIAC. In addition, SIAC and PKU LAW will collaborate to incorporate a module on "SIAC and Institutional Arbitration" into the PKU law programme. Upon request by SIAC or PKU LAW, both parties will also conduct joint training programmes, seminars, workshops or other events in China to promote the development and practice of international arbitration. The MOU was signed on 13 October 2018, at the SIAC Academy training course held in Beijing at PKU, by Ms Lim Seok Hui, Chief Executive Officer of SIAC, and Mr Guo Li, Vice Dean of PKU LAW. The signing was witnessed by Mr Han Kok Juan, Deputy Secretary, Singapore Ministry of Law, Mr Pan Jianfeng, Dean of PKU LAW, Mr Gary Born, President of the SIAC Court of Arbitration, Ms Fu Yulin, Professor of PKU LAW, Mr Kevin Nash, Deputy Registrar & Centre Director of SIAC and Ms Gao Wei, Associate Professor of PKU LAW. 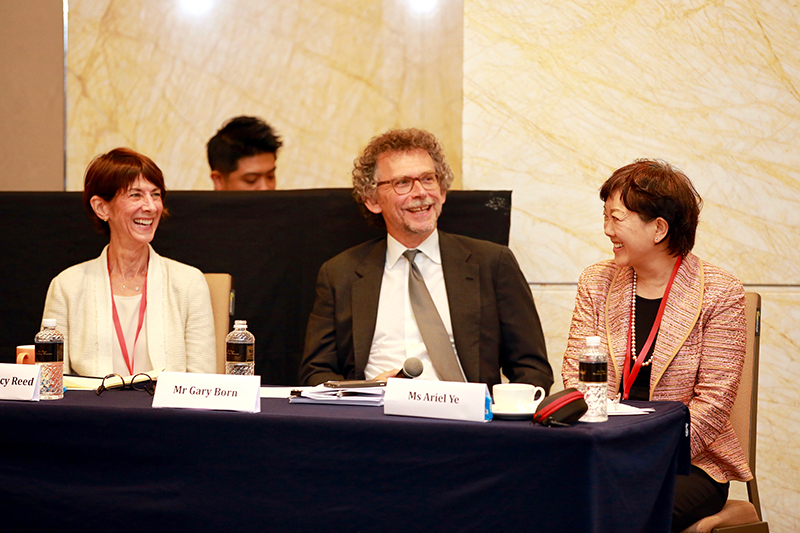 Mr Gary Born, a pre-eminent authority in international arbitration, was the Chair of the teaching faculty for the SIAC Academy training course in Beijing, which included SIAC Court and Board members, other leading international arbitration practitioners and arbitrators, PKU LAW professors as well as the SIAC Secretariat. 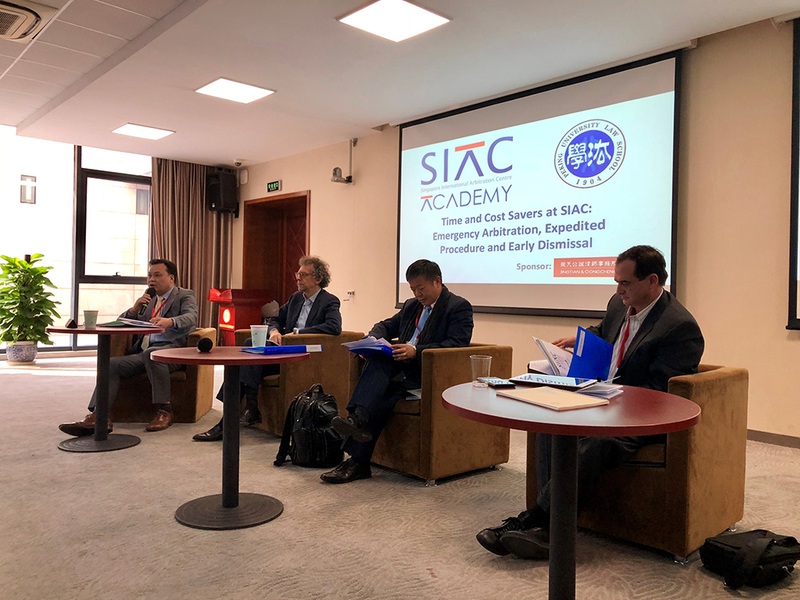 Mr Guo Li, Vice Dean of PKU LAW, said, "We hope the SIAC Academy, which was jointly conducted by SIAC and PKU LAW over the course of the last two days, will be the first of a series of collaborations under the MOU, which will bring together academics and practitioners to share their unique insights and perspectives on international arbitration." Ms Lim Seok Hui, CEO of SIAC, said, "It is a great honour and privilege to be given the opportunity to work closely with PKU LAW, one of the world's leading academic institutions. We firmly believe that this partnership will enable us to jointly promote the benefits of institutional arbitration to future generations of China's international arbitration experts." The Singapore International Arbitration Centre (SIAC) is pleased to announce that it has entered into a Memorandum of Understanding (MOU) with the China International Economic and Trade Arbitration Commission (CIETAC) to promote international arbitration as a preferred method of dispute resolution for resolving international disputes. The MOU was signed on 12 October 2018 at the inaugural SIAC-CIETAC Beijing Conference on "Effective Resolution of Belt & Road Disputes", by Ms Lim Seok Hui, Chief Executive Officer of SIAC, and Mr Wang Chengjie, Vice Chairman and Secretary-General of CIETAC. The signing was witnessed by Mr Han Kok Juan, Deputy Secretary, Singapore Ministry of Law; Mr Lu Pengqi, Vice Chairman, China Council for the Promotion of International Trade; Mr Gary Born, President, SIAC Court of Arbitration; Mr Liu Jingdong, Director of International Economic Law Department, Institute for International Law Studies, Chinese Academy of Social Sciences; Mr Chan Leng Sun, SC, Deputy Chairman, SIAC Board of Directors; and Mr Zhao Jian, Vice President, Arbitration Court of CIETAC. Under the MOU, SIAC and CIETAC will set up a joint working group to discuss SIAC's proposed Cross-Institution Consolidation Protocol. SIAC and CIETAC will also work together to jointly promote international arbitration to serve the needs of businesses. 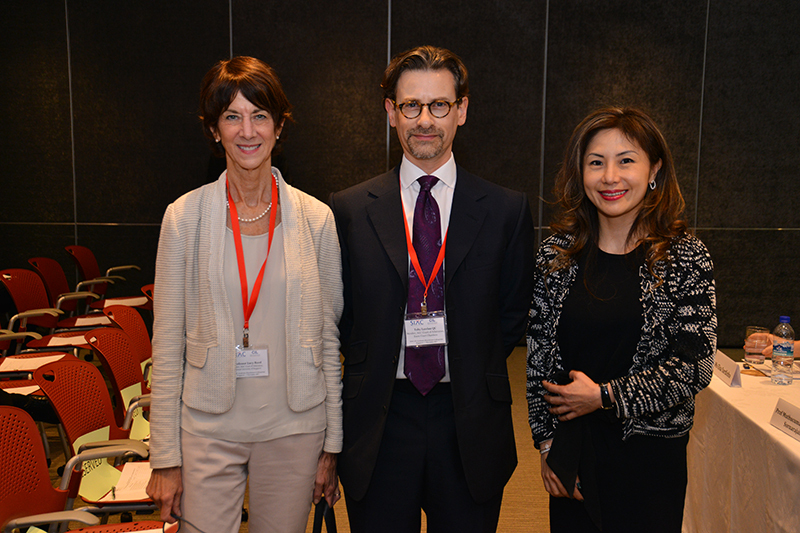 SIAC and CIETAC will hold an annual joint signature event on international arbitration in either China or Singapore. In addition, the institutions will co-organise conferences, seminars and workshops on international arbitration in China and Singapore. Both institutions will, upon request and where appropriate, provide recommendations of arbitrators to each other, and will, upon request, conduct training programmes for each other's staff. Pursuant to the MOU, CIETAC will also extend the use of its hearing facilities at preferential rates for SIAC arbitrations that are held in China. Mr Wang Chengjie, Vice Chairman and Secretary-General of CIETAC, said, "We look forward to working closely together with SIAC to extend our outreach efforts to existing and potential users of international arbitration in China and Belt and Road economies." 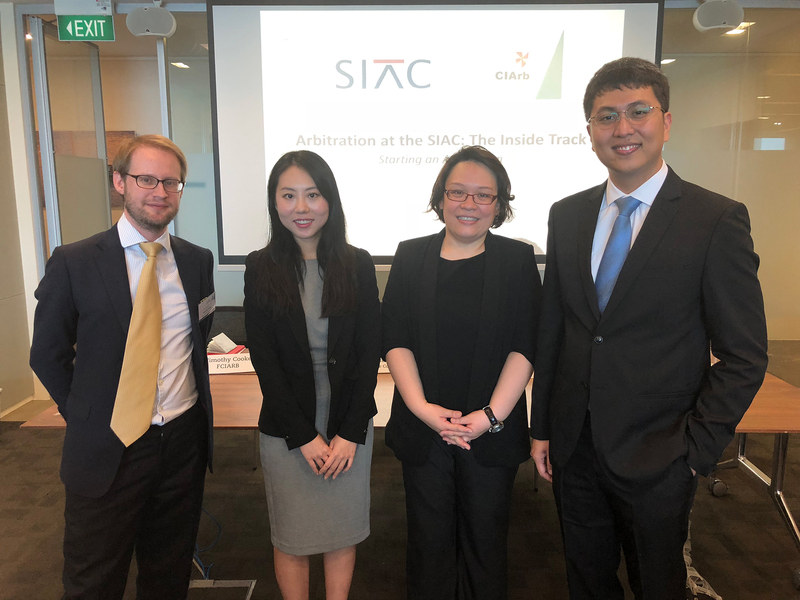 Ms Lim Seok Hui, CEO of SIAC, said, "We are delighted to be entering into this collaboration with CIETAC, and to be holding our inaugural annual joint arbitration event in Beijing to commemorate this special milestone." 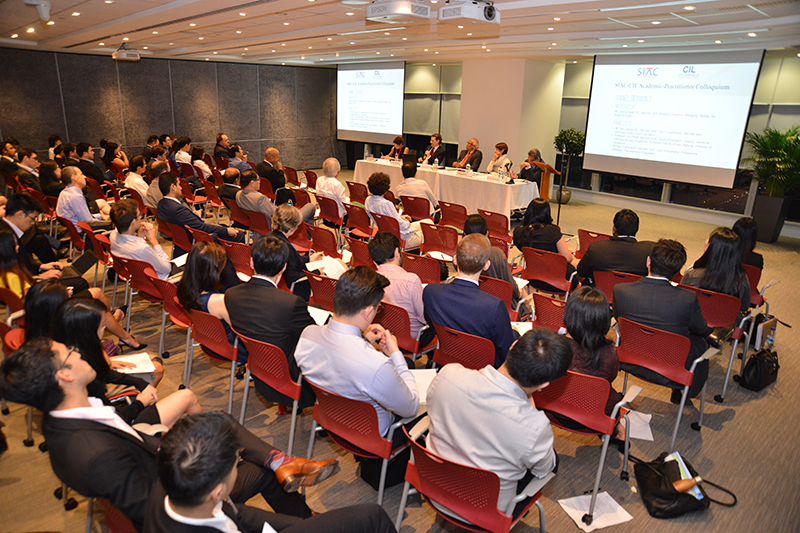 On 27 September 2018, YSIAC held a lunchtime fireside chat with Mr Gary Born (President, SIAC Court of Arbitration; Chair, International Arbitration Practice Group, Wilmer Cutler Pickering Hale and Dorr LLP) on a wide range of topics including guerrilla tactics, arbitrator challenges, and the management of non-responsive respondents. Mr Harpreet Singh, SC (Partner, Clifford Chance) delivered the opening remarks and Ms Lijun Chui (Counsel, Clifford Chance) moderated the session. 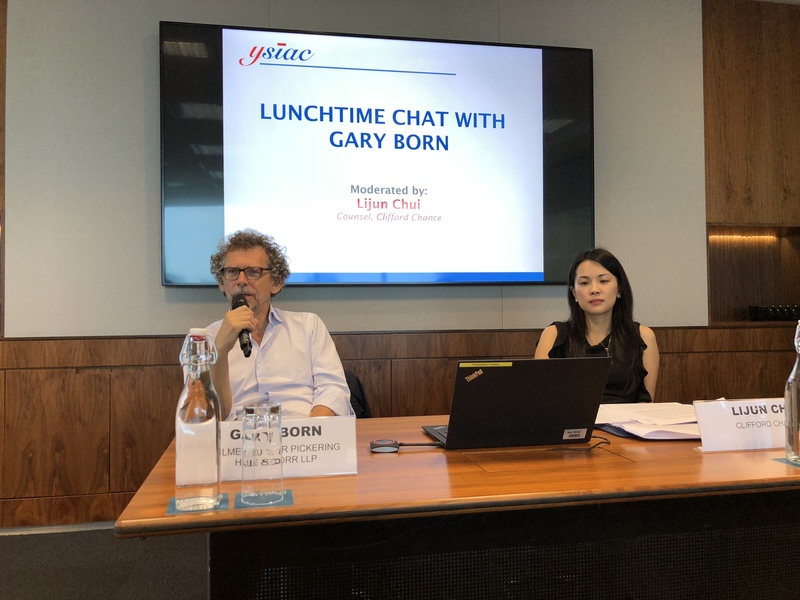 Ms Chui began by inviting Mr Born to comment on a speech by Justice Steven Chong, wherein he observed that the flexibility and informality of arbitration have led to an increase in the use of guerrilla tactics to derail arbitration proceedings. Mr Born downplayed this, noting that guerrilla tactics are employed only in the minority of cases. Furthermore, an experienced tribunal would be able to turn the guerrilla tactics against the counsel that employed them. Mr Born also addressed the concern that arbitrators give parties too much leeway (for example, by allowing them to file submissions out of time, or to make amendments at a late stage) out of fear that the award would be set aside subsequently for the denial of the parties’ right to be heard. While there is some truth to this concern, Mr Born noted that arbitral tribunals not infrequently deny such requests or allow such requests only in part. Arbitrators are also mindful of the parties’ desire to have their dispute resolved efficiently and expeditiously. They do not want the reputation of being afraid of due process and natural justice challenges. Increasingly, arbitrators are being assessed on how quickly they can resolve disputes. On a separate note, one’s freedom fighter is another person’s guerrilla. There may be a legitimate need to employ what the other side may regard as guerrilla tactics (for instance, when there is newly-emerged evidence). Hence, a decision to accede to an application does not necessarily mean that the arbitrator is caving in. Mr Born gave the following advice to counsel and arbitrators dealing with a party that has employed guerrilla tactics. First, it would be best for counsel to simply ignore or even dismiss such tactics (if possible) to avoid being drawn into satellite disputes over procedural matters that distract from the main substantive dispute. Second, arbitrators should try to defuse any conflict and create a collegial atmosphere as this might help dissuade parties and counsel from employing guerrilla tactics. Mr Born expressed the view that non-participation in general is a bad idea as it exposes a party to a default award and the full measure of damages. If the motivation for non-participation is related to jurisdiction reasons, a better option would be to participate and to maintain jurisdictional objections. From the perspective of the claimant and tribunal, it would be good practice to make every effort to obtain the participation of the respondent. For claimants, making sure that they can subsequently demonstrate that notice of the various stages of the proceedings was given to the respondent is important in order for the arbitral award to be recognised and enforced. Tribunals on the other hand have an obligation to afford the parties an opportunity to present their case. Unless a tribunal is convinced that the defendant has had notice, the obligation would not have been fulfilled. The tribunal should also put the claimant to proof. The tribunal should not make default awards simply based on what the claimant has asked for; instead it must examine the case presented by the claimant and issue a default award based on that. Mr Born advised challenged arbitrators to remain objective and to keep a cool head even though he acknowledged that such challenges can be quite personal as the allegation is that the arbitrator lacks the essential moral qualities of independence and impartiality, and has therefore violated his or her mandate. In an appropriate case, if the arbitrator realises he or she is personally engaged, he or she should resign. 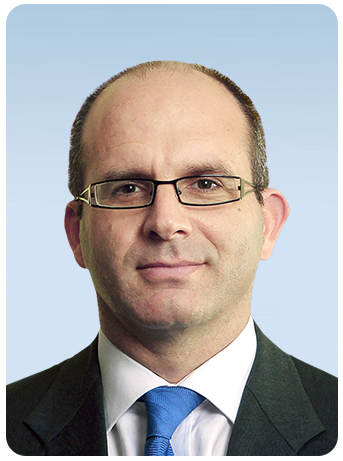 Mr Born’s advice for parties who have unsuccessfully challenged an arbitrator is to treat such challenges as water under the bridge and to focus on the substance of the dispute. The usual reaction of the arbitrator to a failed challenge is also to forget about the challenge, especially if it was mounted at an early stage of the proceedings. In any case, even if the arbitrator continues to hold a grudge, there is little that can be done. Mr Born likened the current world of ethics in international arbitration to a teenager’s bedroom. In an arbitration, there may be competing sets of rules: counsel may be qualified in different jurisdictions, the arbitration may be seated in yet another jurisdiction, and the arbitration may be administered in accordance with an arbitral institution’s rules. By default, everybody’s home ethical rules would apply. Different counsel in the same proceedings may therefore be bound by different ethical rules. This can potentially lead to an unequal playing field as different approaches may be adopted as regards areas such as witness preparation and disclosure. How then should this problem be addressed? Ms Chui raised Chief Justice Sundaresh Menon’s proposal for a code of conduct to guide international arbitrators and counsel. But Mr Born noted that the difficulty with such a regulatory framework is that any guidelines issued would sit on top of national ethical standards that are applicable to the parties. It is therefore unclear whether another set of guidelines would clean up the teenager’s bedroom or whether it would simply add noise to it. Instead, Mr Born opined that the better way is for bar associations and bar regulatory authorities to reach some form of common agreement on ethics in international arbitration. Bar associations have regulatory impact and they can amend their rules to include specialised rules on arbitration. While this may seem difficult to implement at first blush, it may not be so if one bears in mind that the focus is solely on ethics in international arbitration and only leading jurisdictions would be involved at least as a first step. And while uniformity may not be achieved, it would be possible to at least achieve some measure of agreement. Mr Born posited that this would be a suggestion well worth the political effort it would take, and expressed hope that Singapore would take the lead. The session closed on that note. The practical tips and insights shared during the session were invaluable, and they related to fertile areas of arbitration law that guerrillas and freedom fighters ought to keep abreast of. In fact, guerrilla tactics were considered for the first time by the Singapore courts in April 2018, when the Singapore High Court in China Machine New Energy Corp v Jaguar Energy Guatemala LLC and another  SGHC 101 considered whether an award should be set aside on the basis that the respondent had employed guerrilla tactics and had thereby breached an implied duty to arbitrate in good faith. Further developments await. The Singapore International Arbitration Centre (SIAC) is pleased to announce that it has entered into a Memorandum of Understanding (MOU) with the Xi’an Arbitration Commission (XAAC) to promote international arbitration as a preferred method of dispute resolution for resolving international disputes. The MOU was signed on 7 September 2018, by Mr Kevin Nash, Deputy Registrar & Centre Director of SIAC, and Mr Pan Junxing, Vice Director & Secretary General of the Xi’an Arbitration Commission. The signing was witnessed by Mr Han Kok Juan, Deputy Secretary, Singapore Ministry of Law, and Mr Hu Minglang, Vice Governor, People’s Government of Shaanxi Province. Under the MOU, SIAC and XAAC will work together to jointly promote international arbitration to serve the needs of businesses. 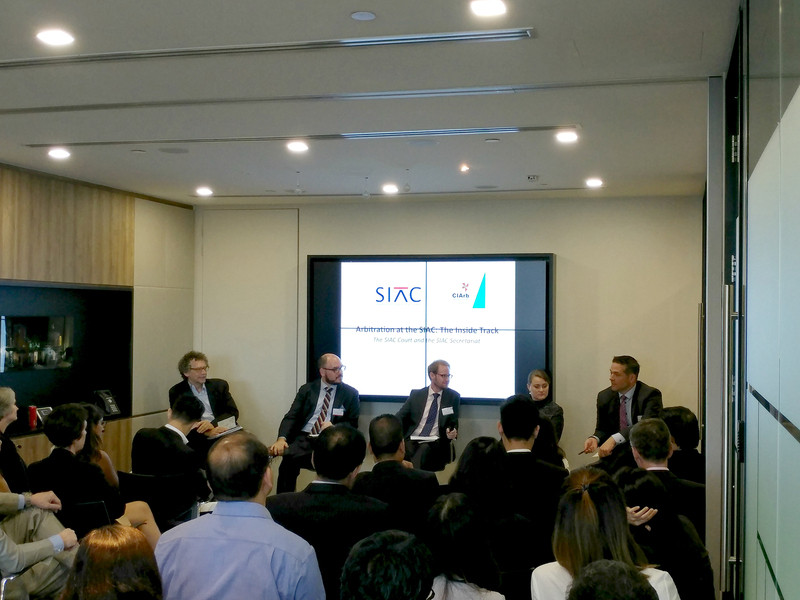 SIAC and XAAC will hold an annual joint signature event on international arbitration in either China or Singapore. In addition, the institutions will also co-organise conferences, seminars and workshops on international arbitration in China and Singapore. Both institutions will, upon request and where appropriate, provide recommendations of arbitrators to each other. Pursuant to the MOU, XAAC will also extend the use of its hearing facilities at preferential rates for SIAC arbitrations that are held in China. The Singapore International Arbitration Centre (SIAC) is pleased to announce that it has entered into a Memorandum of Understanding (MOU) with the Shenzhen Court of International Arbitration (SCIA) to promote international arbitration as a preferred method of dispute resolution for resolving international disputes. The MOU was signed at the 9th Singapore-Guangdong Collaboration Council meeting on 24 August 2018, by Ms Lim Seok Hui, Chief Executive Officer of SIAC, and Dr Liu Xiaochun, President of the Shenzhen Court of International Arbitration. The signing was witnessed by the Co-Chairmen of the Council, Singapore Minister for Education Ong Ye Kung and Guangdong Governor Ma Xingrui. Under the MOU, SIAC and SCIA will work together to jointly promote international arbitration to serve the needs of businesses. 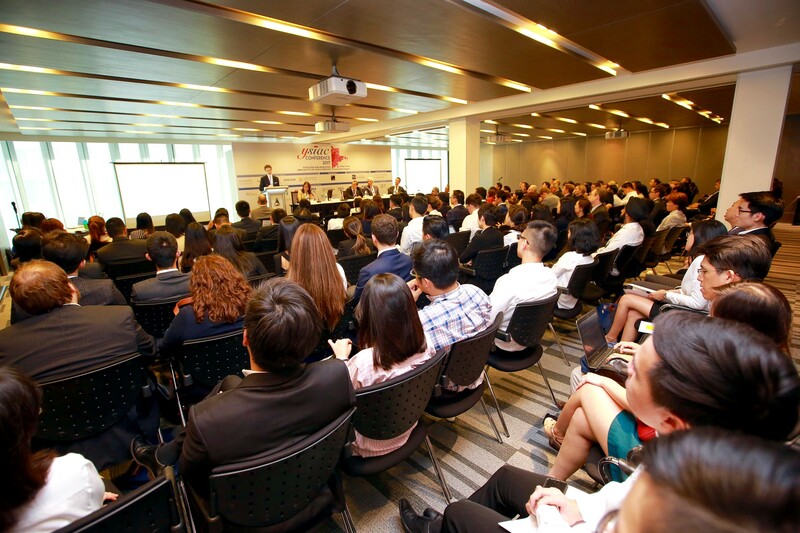 SIAC and SCIA will hold an annual joint signature event on international arbitration in either China or Singapore. In addition, the institutions will also co-organise conferences, seminars and workshops on international arbitration in China and Singapore. Both institutions will, upon request and where appropriate, provide recommendations of arbitrators to each other. Pursuant to the MOU, SCIA will also extend the use of its hearing facilities at preferential rates for SIAC arbitrations that are held in China. By working together, SIAC and SCIA can share their expertise and networks to better support the development of the Guangdong-Hong Kong-Macau Greater Bay Area and help connect the Greater Bay Area with the rest of Asia and the rest of the world. 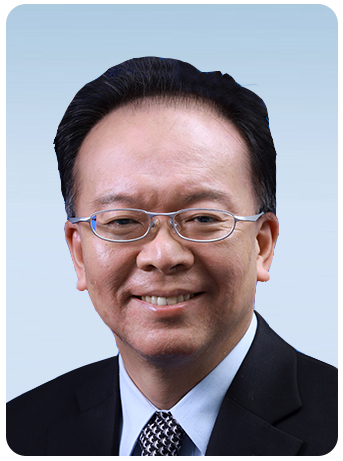 Dr Liu Xiaochun, President of the Shenzhen Court of International Arbitration, said, "We are confident that the MOU will provide both institutions with an enhanced platform to extend our outreach efforts to existing and potential users of international arbitration in China and Belt and Road economies, across a range of industry sectors including construction, infrastructure, energy, maritime and finance." Ms Lim Seok Hui, CEO of SIAC, commented that "This MOU represents a key milestone in our commitment and ongoing efforts to work closely with SCIA and other Chinese arbitral institutions to promote international arbitration to Chinese investors, companies and businesses as the preferred mode of dispute resolution for the resolution of cross-border commercial and investment disputes, particularly in the context of the Belt and Road Initiative." 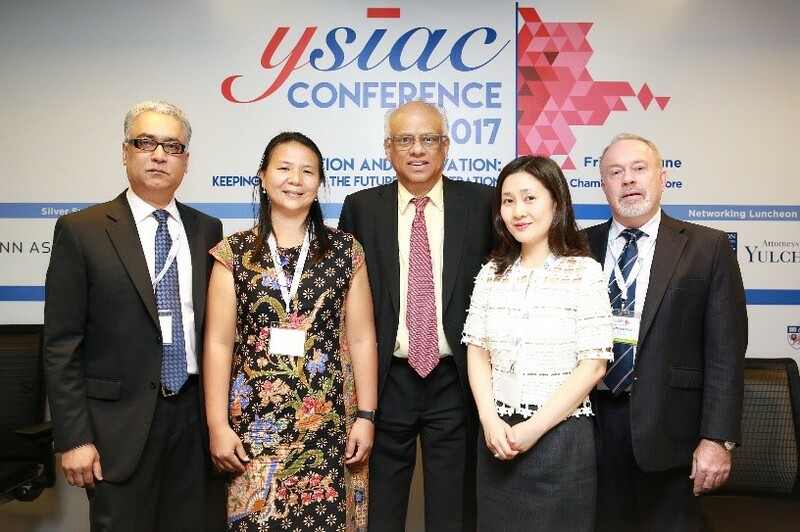 At the SIAC Congress 2018 held in Singapore on 17 May 2018, The Honourable the Chief Justice Sundaresh Menon, Supreme Court of Singapore, gave an insightful keynote speech on the special role and responsibility of arbitral institutions in charting the future of international arbitration. The growth of institutional arbitration is very much a feature of international arbitration's "golden age". By providing administrative and logistical support and pre-established rules and procedures, arbitral institutions have paved the way for its widespread adoption. Over time, arbitral institutions have morphed from private service providers, concerned only with commercial matters, to quasi-public bodies involved in the development, organisation, and promotion of international arbitration. 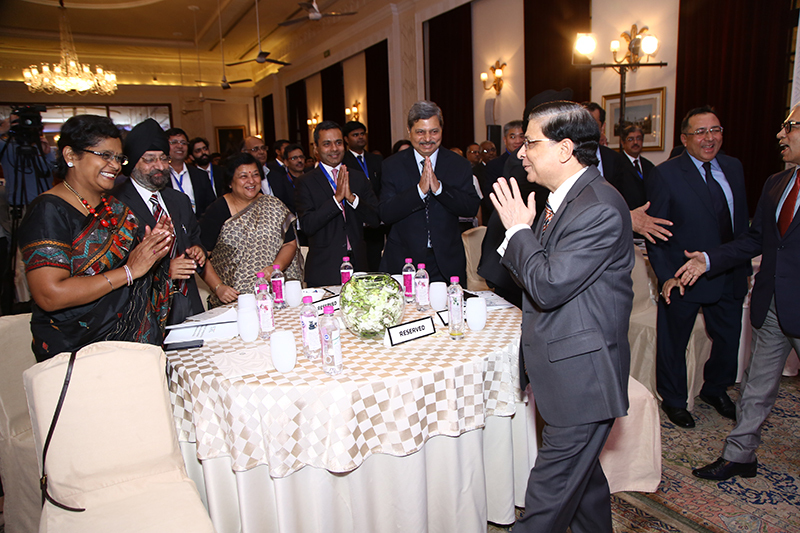 In his address, Chief Justice Sundaresh Menon discussed some of the challenges that come with this expanded role, and set out his thoughts on the ways in which arbitral institutions such as the SIAC can and must take the lead in securing the future of the industry in the face of the challenges that lie ahead. The full text of the speech may be found here. The SIAC Congress Week brought together distinguished members of the judiciary, the SIAC Board of Directors, the SIAC Court of Arbitration, and other leading international arbitration experts for a lively and interesting series of seminars, debates and a workshop. SIAC would like to thank all speakers, sponsors and participants for their many contributions to the success of the SIAC Congress Week. It was a great privilege and pleasure to have our guests of honour, The Honourable the Chief Justice Sundaresh Menon, Supreme Court of Singapore, Mr Heng Swee Keat, Minister for Finance, Singapore and Ms Indranee Rajah, SC, Minister in the Prime Minister’s Office and Second Minister for Finance and Education, Singapore, grace us with their presence at the SIAC Congress. The various reports on the SIAC Congress Week can be accessed here. The Singapore International Arbitration Centre (SIAC) is pleased to announce that in the latest Queen Mary University of London International Arbitration Survey (QMUL Survey) released on 9 May 2018, SIAC ranked as the most preferred arbitral institution in Asia, and 3rd out of the top 5 arbitral institutions in the world. The QMUL Survey is in its eighth edition and is one of the most prestigious International Arbitration surveys in the market. QMUL stated that this year’s QMUL Survey is the most “comprehensive empirical study” ever conducted by the university, with findings based on the questionnaire responses of 922 participants, including in-house counsel, arbitrators, firm practitioners, the staff of arbitral institutions, expert witnesses and third-party funders. 142 interviews were also conducted. Singapore is the 3rd most preferred seat worldwide, after London and Paris, and ahead of Hong Kong, Geneva, New York and Stockholm. Singapore is the most preferred seat in Asia. The Singapore International Arbitration Centre (SIAC) is pleased to announce the appointment of Prof Lucy Reed as a Vice President of the SIAC Court of Arbitration with effect from 29 June 2018. Prof Reed succeeds Mr John Savage QC, who previously served as a member of the SIAC Board of Directors from 2009 to 2017, and concurrently served as a Vice President of the SIAC Court of Arbitration from 2013 to March 2018. Mr Savage will continue to serve as a member of the SIAC Court. Prof Reed is the Director of the Centre for International Law and Professor on the Law Faculty of the National University of Singapore. She previously led the global international arbitration group in Freshfields Bruckhaus Deringer, and has represented private and public clients in investment treaty and commercial arbitrations for more than 35 years. 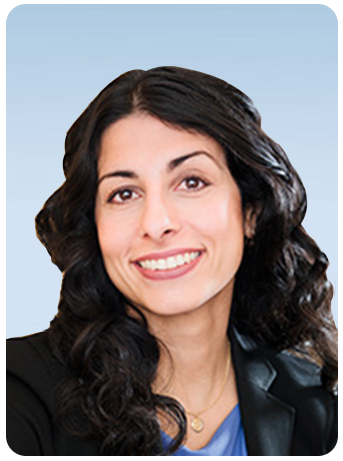 She now sits regularly as arbitrator in commercial and investment treaty cases. 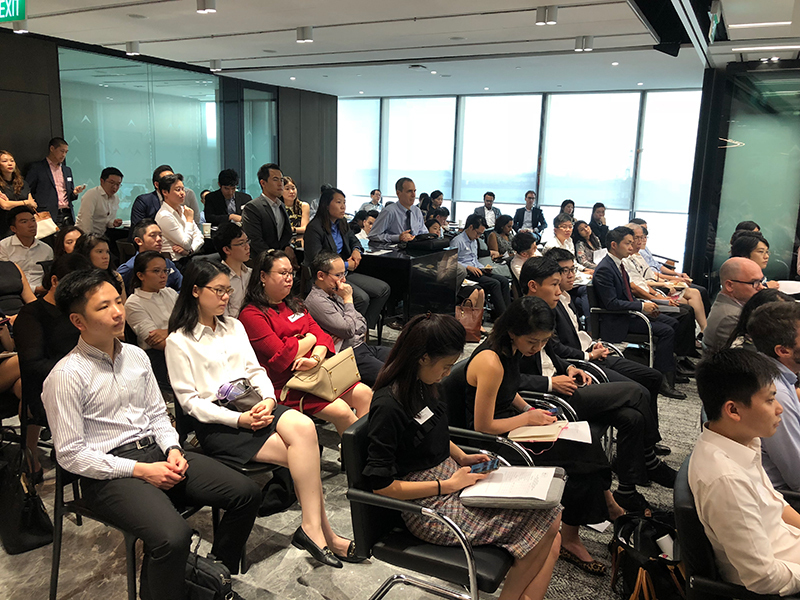 On 23 April 2018, the finale of a three-part workshop on arbitration at the Singapore International Arbitration Centre (SIAC) was successfully held by SIAC and the Chartered Institute of Arbitrators, Singapore (CIArb, Singapore). The workshop was attended by arbitrators, practitioners, in-house counsel and third-party funders, who were eager to hear the Secretariat’s views on the various applications that may be made under the SIAC Rules. Similar to the first two workshops, the final leg commenced with a welcome address by Ms Camilla Godman (Regional Director, CIArb), where the primacy of various applications under the SIAC Rules was addressed. Ms Godman then concluded her address by introducing the moderator of the day, Mr Timothy Cooke (Partner, Stephenson Harwood LLP) and the panel from SIAC, Mr Kevin Nash (Deputy Registrar & Centre Director, SIAC), Ms Khyati Raniwala (Associate Counsel, SIAC) and Ms Qian Wu (Associate Counsel, SIAC). 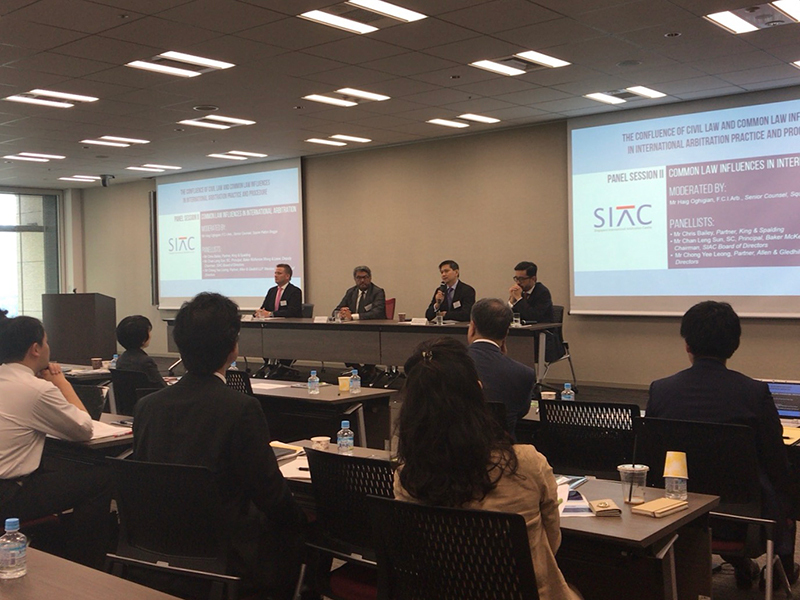 In the course of the discussion, the panel offered their insights on various procedures under the SIAC Rules, such as the emergency arbitrator, jurisdictional objection, early dismissal, joinder, multiple contracts and consolidation, and expedited procedure. The panel shed light on practical issues such as the tests generally adopted by emergency arbitrators in determining whether to grant emergency interim relief, the difference between the tests of “exceeding the scope of its jurisdiction” and “manifestly outside the jurisdiction of the tribunal” under Rules 28.3(b) and 29.1(b) of the SIAC Rules 2016, how the institution treated confidentiality of an arbitration in the event a non-party was joined to the arbitration, and the meaning of each criteria under Rule 8.1 for the consolidation of arbitrations. The participants took the opportunity to seek the Secretariat’s views on some interesting issues relating to the various procedures. One of which was whether it would be helpful for parties, who would like to facilitate consolidation to the maximum extent possible, to include express language in the arbitration agreement consenting to consolidation. The panel explained that although such language might be sufficient to bring in an application, the circumstances and the extent to which the parties wished to consolidate the arbitrations in the event of a dispute would nonetheless be examined. Mr Nash also stressed that even with an agreement on consolidation, the “stamp of approval” by the SIAC Court was still required. The workshop concluded with Mr Cooke thanking the participants for coming not only to the finale but also the other two workshops. Mr Cooke then expressed his gratitude to the panel from SIAC for taking the time to share their insights with the attendees. In a recent article by CMS Holborn Asia and the Society of International Law (Singapore), titled “Costs and Duration: A Comparison of the HKIAC, LCIA, SCC and SIAC Studies”, the authors concluded that “SIAC remains the most cost-competitive option for both sole-arbitrator and three-arbitrator cases” and that “for three-arbitrator cases in particular, SIAC remains significantly cheaper than LCIA and SCC where the costs extend to six-digit figures”. According to the article, SIAC arbitrations are “the most efficient in comparison to the other arbitral institutions”. The article added that “based on a comparison of the four studies, the costs and duration of arbitral proceedings are ostensibly most attractive when administered by SIAC”. A copy of the article may be accessed here. Further details on SIAC’s Costs and Duration Study may be found here. 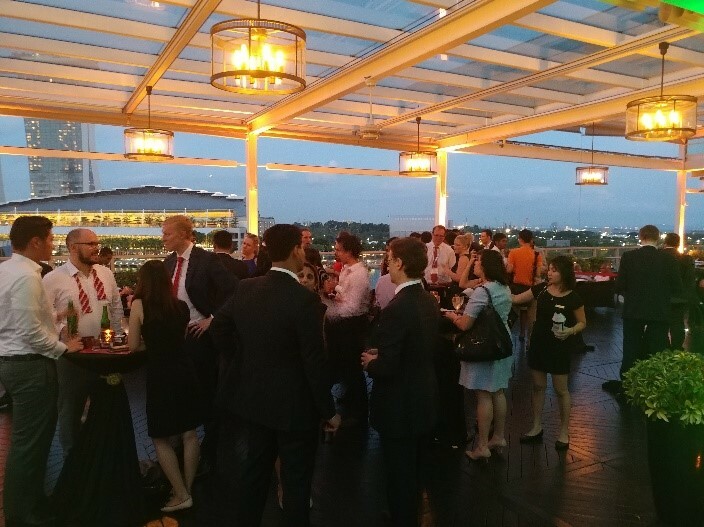 SIAC’s Annual Appreciation Event took place on 7 March 2018 in Singapore and attracted a record turnout of 240 members from the local and international arbitration communities. The evening commenced with a Welcome Address from Mr Davinder Singh, SC, Chairman of SIAC, who announced that SIAC had received a record 452 new cases, and administered 93% or 421 of the cases filed in 2017. 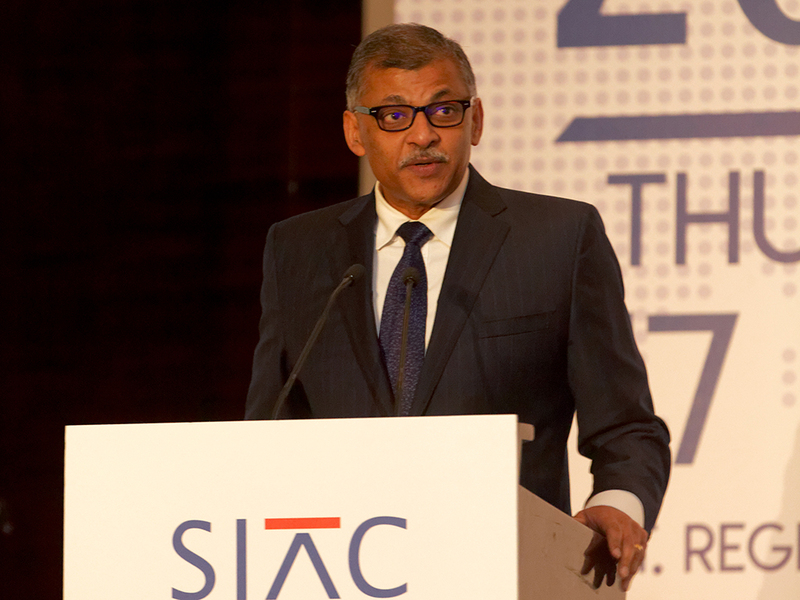 Mr Singh thanked the SIAC Board and Court members for their dedication and support for SIAC’s various initiatives, as well as the management and staff of SIAC for their contributions to SIAC’s goals. In her opening remarks, Ms Lim Seok Hui, CEO of SIAC, noted that 2017 was a year of firsts and innovations that included the proposal for a cross-institution consolidation protocol, the inaugural SIAC Academy and the first-ever SIAC-CIL Academic-Practitioner Colloquium. Ms Lim gave special thanks, on behalf of everyone at SIAC, to Mr Singh and Mr Born for their inspirational leadership and support. Mr Gary Born, President of the Court of Arbitration of SIAC, presented SIAC’s key case statistics for 2017, concluding that SIAC’s success could be attributed to its continued commitment to innovate and be responsive to the needs of its users. The Singapore International Arbitration Centre (SIAC) is pleased to announce the official release of its 2017 Annual Report. 2017 saw SIAC set a new record for the highest number of new case filings and administered cases. SIAC’s caseload continues to grow year on year, and has increased by more than 5 times in the last decade. In 2017, SIAC received 452 new cases from parties in 58 countries in 6 continents. This was a 32% increase from the 343 cases filed in 2016 and a 67% increase from the 271 cases filed in 2015. SIAC administered 93% or 421 of the cases filed in 2017. The aggregate sum in dispute for all new case filings amounted to USD4.07 billion (SGD5.44 billion). Whilst India and China remained significant contributors to SIAC’s caseload, SIAC’s top ten foreign user rankings also saw new entrants from Europe and the Middle East, underscoring SIAC’s global appeal to users from diverse legal systems and cultures. Further details of SIAC’s case numbers are available in the 2017 Annual Report. 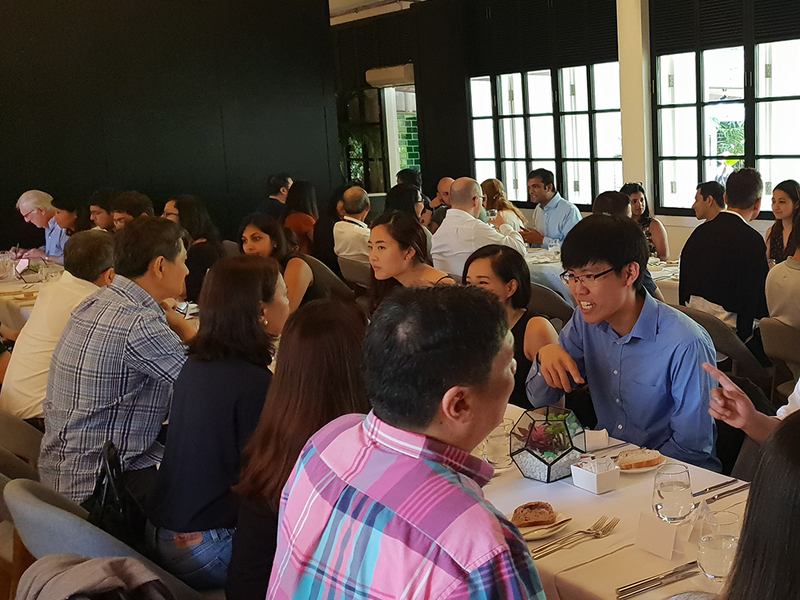 On 7 March 2018, the Singapore International Arbitration Centre (SIAC) and the Chartered Institute of Arbitrators, Singapore (CIArb, Singapore) successfully co-organised the second of a three-part workshop on arbitration at SIAC. 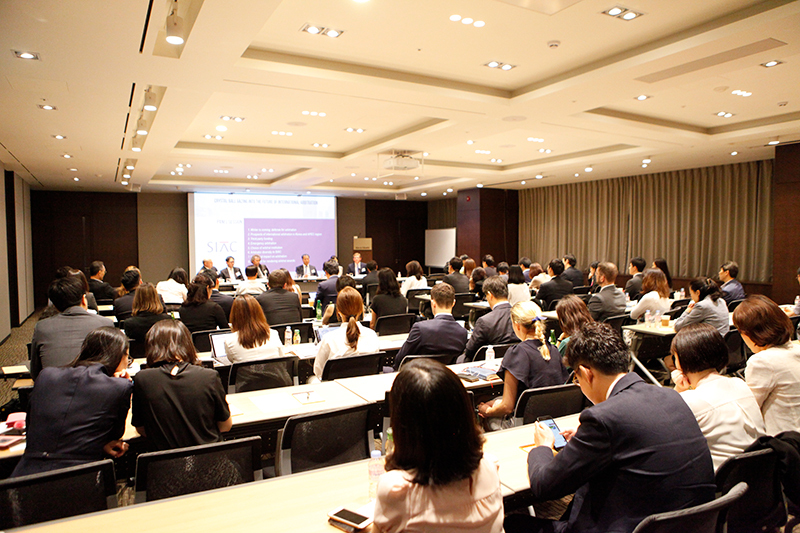 The workshop, which attracted an excellent turnout of attendees from law firms, arbitral institutions, and private companies, sought to offer a behind-the-scenes glimpse into the commencement of arbitral proceedings at SIAC. The workshop kicked-off with a Welcome Address by Ms Camilla Godman (Regional Director, CIArb) who stressed that “getting all the elements right at the start of an arbitration is critical not just for limitation reasons but also the ultimate creation of an enforceable award”. 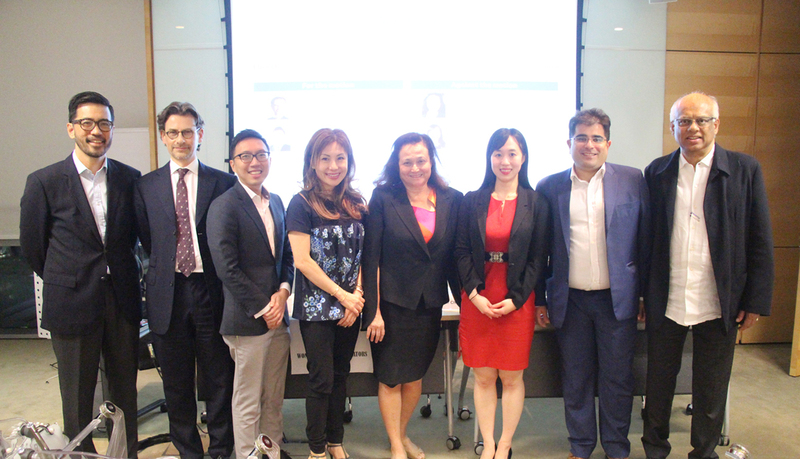 The session was moderated by Mr Timothy Cooke (Partner, Stephenson Harwood LLP) and the panel of speakers comprised Ms Delphine Ho (Registrar, SIAC), Mr Kendista Wantah (Associate Counsel, SIAC), and Ms Allison Goh (Associate Counsel, SIAC). The panel discussed various potential issues that a lawyer or a party may face when commencing an arbitration, and offered their insights on these issues from an institutional perspective. Amongst others, the discussion touched on practical topics including what would amount to a “complete” or “substantially complete” Notice of Arbitration for the purpose of commencing an arbitration at SIAC, issues involving a non-paying respondent in an SIAC- administered arbitration and the approach taken by SIAC when dealing with ambiguous arbitration agreements. The panel shared their experiences and elaborated on the rationale behind the institution’s approach under the SIAC Rules on these issues. Of particular interest to the attendees was SIAC’s considerations when determining the amount of deposits payable, especially in cases involving substantial counterclaims. The Registrar, Ms Ho highlighted the importance for parties to provide an estimated quantification of their claims early in the case to avoid “surprises”. The workshop ended on a high note with the panel addressing further burning questions from the attendees on, inter alia, the consolidation mechanism under the SIAC Rules and appointments by SIAC in ad hoc arbitrations. To end the session, Mr Cooke expressed his gratitude to the panel from SIAC for taking their time to share their insights with the attendees. “Tribunals with women arbitrators make better decisions.” As is well known, in a relationship, one person is always right and the other person is male – surely, this must be good counsel when selecting an arbitrator, where judgment and perceptiveness are crucial attributes. The YSIAC Debate held on 2 March 2018 sought to challenge this received wisdom. The moderator for the debate was Mr Chelva Rajah, SC (Member, SIAC Board of Directors, Managing Partner, Tan Rajah & Cheah). 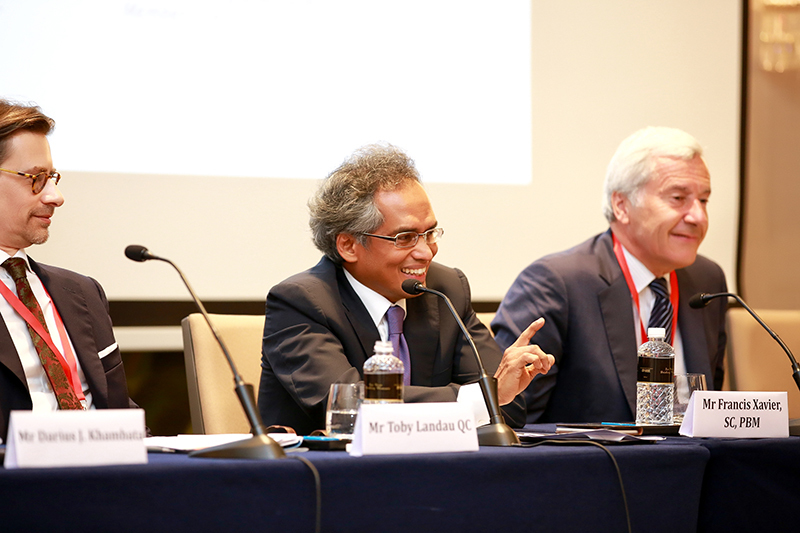 Arguing for the motion – and ostensibly with the “easier” task – was the duo of Mr Toby Landau QC (Member, SIAC Court of Arbitration; Barrister and Arbitrator, Essex Court Chambers) and Mr Paul Tan (Partner, Rajah & Tann Singapore LLP), with brains and beauty to spare. 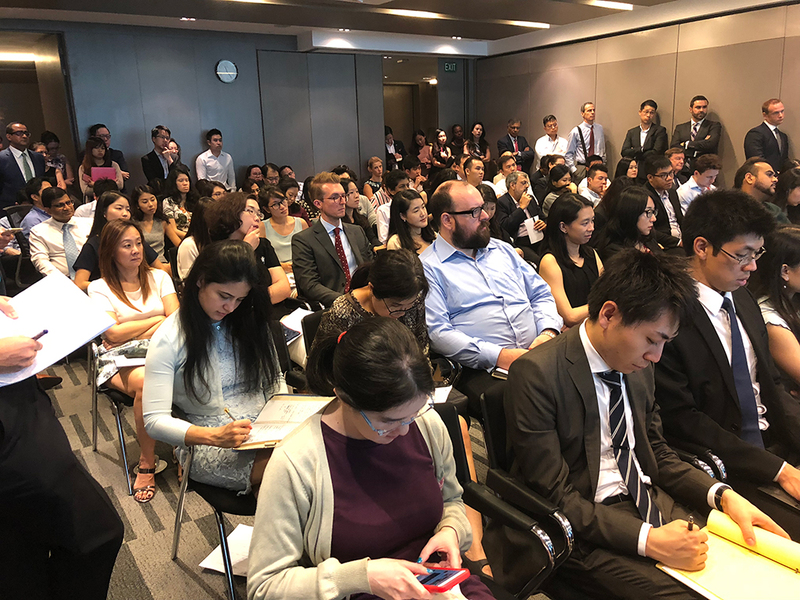 Arguing against the motion were the formidable team of Ms Deborah Barker, SC (Managing Partner, Withers KhattarWong) and Ms Jae Hee Suh (Associate, Allen & Overy), who persuaded the packed audience of 128 attendees with impassioned advocacy (and song). This debate was a timely one, coming slightly less than two years after the arbitration community drew up the Equal Representation in Arbitration Pledge, with signatories committing to diversify the pool of arbitrators and improve the profile and representation of women in arbitrations. 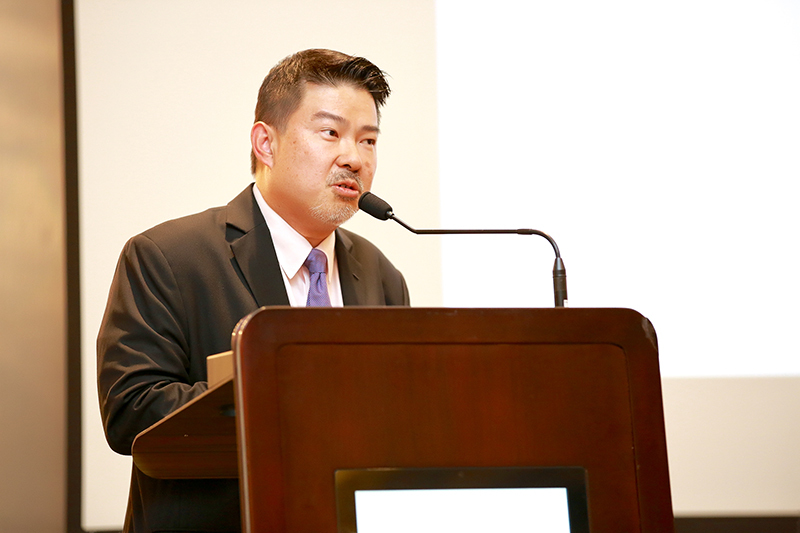 Mr Tan fired the opening salvo with the central thesis that women outperform men in personal qualities that were relevant to arbitral decision making – women tended to have more initiative and creativity, and displayed honesty and social awareness. Citing various statistical studies (as well as anecdotal evidence that women were smarter and live longer), Mr Tan presented a compelling case in favour of the participation of women on arbitral tribunals to improve decision making. Mr Tan’s arguments were met with a confident rebuttal from Ms Jae Hee Suh, who challenged the underlying assumption in the motion that women arbitrators had to make “better” decisions to justify their appointments to arbitral tribunals. She argued that gender should make no difference to decision-making: expertise and efficiency bore little correlation to one’s gender. Women arbitrators should be appointed on an equal opportunity basis, and not because of their gender. Ms Jae concluded that supporting the motion would harm, instead of support, women, by perpetuating gender stereotypes and suggesting that the participation of women in arbitral tribunals was no more than a form of tokenism. Following on the heels of Ms Jae’s challenge to the idea that woman had to show that they have a “right” to be there, Mr Landau presented yet another perspective that focussed on the importance of diversity in group decision-making. Quite apart from the fact that women might have specific personal qualities and characteristics that lent themselves to the process of decision-making, the individual skills of a diverse group collectively contributed to greater group intelligence and translated to greater collaboration in making sense of evidence and submissions. Mr Landau explained that “better” might not just mean right or wrong, but whether a decision was regarded by users as legitimate and acceptable. Gender diversity was a fact of the modern world, and the composition of tribunals should reflect this. Ms Barker responded, to rapturous applause from the audience, by breaking out the ukulele and in song with the aptly titled song “Man Smart, Woman Smarter”. The lyrics speak for themselves: “And not me but the people they say; That the men are leading the women astray; But I say, that the women of today; Smarter than the man in every way.” Ms Barker asked, rhetorically: how would the inclusion of females improve decision making? The oft-quoted description of arbitrators as a “male, pale and stale” group that would somehow benefit from the participation of women undermined the wider issues of unconscious bias and lack of equal opportunities that have contributed to the imbalance. At the end of this spirited debate, the audience spoke, and awarded the debate to Ms Barker and Ms Jae. What appeared at first to be a straightforward motion reflected the nature of the complex and multi-faceted debate on inclusivity in the community. Whilst the concept was widely supported, the unconscious bias in the system cannot be changed by the mere assertion that tribunals with woman arbitrators are “better”. The women were still right on this score. 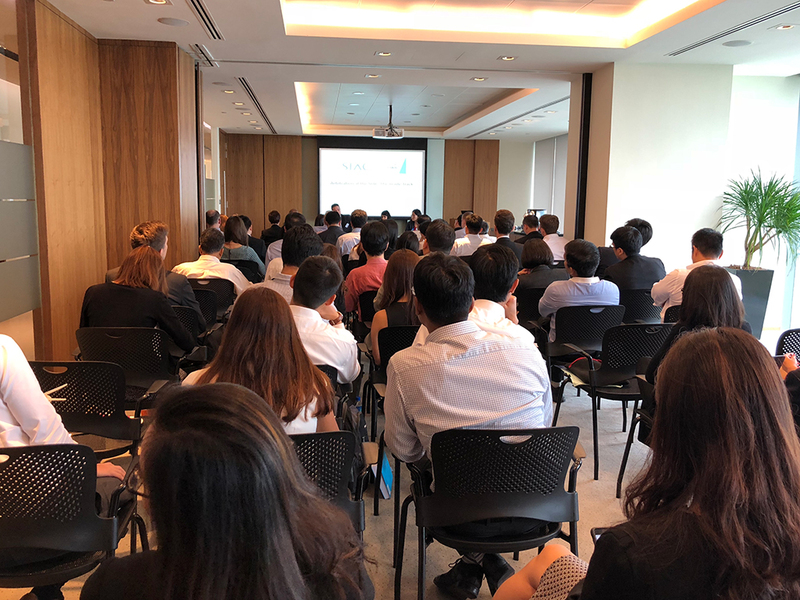 Kicking off a new three-part series of workshops co-organised by the Singapore International Arbitration Centre (SIAC) and the Chartered Institute of Arbitrators, Singapore (CIArb, Singapore), the first session of “Arbitration at the SIAC: The Inside Track”, was held on 24 January 2018. Eager to gain a glimpse behind the proverbial curtain at SIAC, a packed crowd comprising both young and experienced practitioners, in-house counsel and arbitrators came to hear Mr Gary Born (President, SIAC Court of Arbitration; Chair, International Arbitration Practice Group, Wilmer Cutler Pickering Hale and Dorr LLP), Mr Kevin Nash (Deputy Registrar & Centre Director, SIAC), Ms Aliona Bitkivskaja (Associate Counsel, SIAC), Mr Christopher Bloch (Associate Counsel, SIAC), and moderator Mr Timothy Cooke (Partner, Stephenson Harwood LLP), expound on the roles and interplay between the SIAC Court and the SIAC Secretariat. With Mr Born present to weigh in on how the President and the SIAC Court dealt with some of the applications filed by parties under the SIAC Rules 2016, including applications for emergency arbitration, Expedited Procedure, consolidation and joinder, and prima facie decisions on jurisdiction, participants were able to gain valuable insights on how to develop an effective case strategy in cases administered under the SIAC Rules. In terms of procedure, Mr Born noted that the President and the SIAC Court would look to the Secretariat to brief them on the facts, procedural complexities and competing arguments for each case. This briefing allowed the President and the Court Members to perform a detailed analysis of the merits of each application in complex cases where time was often of the essence. For efficiency, many of these applications to the SIAC Court were handled by a three-member ‘Committee’ of the SIAC Court. Unsurprisingly, one of the hottest topics raised by the audience related to various provisions in the SIAC Rules concerned with speed and costs, showing that this remained an important factor for parties. The first of these topics to be addressed was the revision to the emergency arbitration provisions in the SIAC Rules 2016 – namely the switch to a flat fee for emergency arbitrators (revised from the prior ad valorem scale where emergency arbitrators’ fees were capped at 20% of a sole arbitrator’s fee cap under the SIAC Rules 2013). Mr Nash noted that SIAC had seen this as an important change, noting that “there has been an uptick in the number of EA applications coming in since the amendment, presumably because of the greater predictability and cost savings with the new fixed fee”. Mr Bloch noted anecdotally that “parties often file their emergency arbitrations just before close of business on either a Friday night or eve of a public holiday – clearly a strategic decision on their part – but with our tight timelines, SIAC [would] get the emergency arbitrator appointed and underway, whether that [meant] being in the office on Saturday or over Chinese New Year”. The pro tip received: Give SIAC an indication that you would be preparing to file an emergency arbitration so that the internal processes can be begun to ensure the quickest turnaround possible. Another “special procedure” which received much attention for its time and cost saving potential was SIAC’s Expedited Procedure, which allowed for a dispute to be heard, from constitution of the tribunal to final award, within 6 months. In response to questions on timelines, the Secretariat confirmed that the overwhelming majority of tribunals were able to meet the deadline. Mr Born explained that this may be due to the robust approach adopted by SIAC in consideration of these applications. For instance, even if an application for Expedited Procedure met any of the threshold criterion under Rule 5.1 of the SIAC Rules, the President maintained the discretion to reject the application where the surrounding circumstances suggested that the regular procedure should be maintained. In 2017, SIAC received 107 applications for Expedited Procedure, and of those, 55 have been accepted, a 51% acceptance rate. As the discussion moved to the finer points of the Expedited Procedure, the panel received a comment on the possibility of SIAC affirmatively taking into account the efficiency with which an arbitrator dealt with a dispute when determining the costs of the arbitration, noting that sometimes it was substantially more difficult for an arbitrator to hear a case on a short timeframe and issue a quick award. The question then followed as to “whether an arbitrator should be paid more for efficient handling of an Expedited Procedure case?” Upon a straw poll being conducted by Mr Born on the spot, the crowd seemed split, but the majority were receptive to this proposal. In addition to questions on these special procedures, there was significant interest from the audience on the general financial management of arbitrations and remuneration of tribunals in SIAC-administered cases. 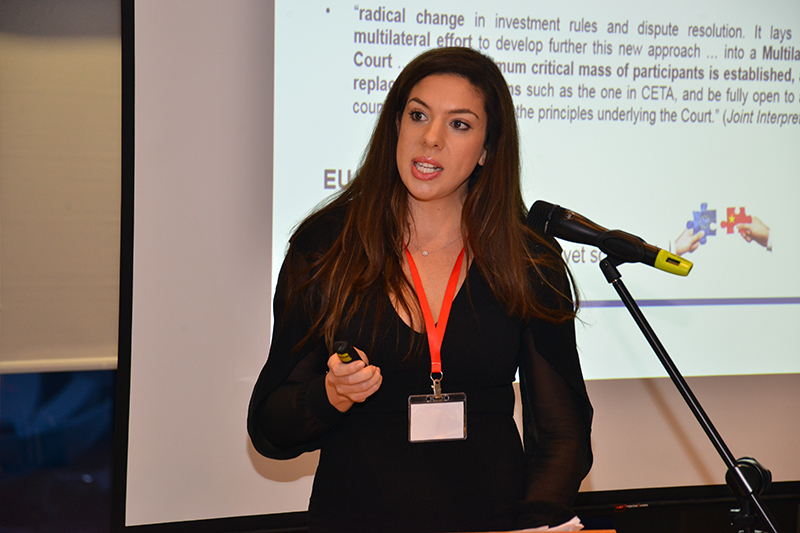 When discussing the fee structure, Ms Bitkivskaja noted that the SIAC Rules 2016 provided for a default ad valorem fee scale which linked the fees to the amount in dispute, but also noted that parties were free to agree to alternative remuneration for arbitrators. She described one method of alternative remuneration that SIAC had encountered which she coined a “hybrid” system – where arbitrators were paid on an hourly basis, but their fees were capped based on the amount in dispute. In this regard, Ms Bitkivskaja explained that SIAC’s Schedule of Fees (and even such a hybrid system) gave parties visibility on the potential costs of arbitration, “allowing parties to control their financial exposure and budgets”. As this was the opening salvo to the three-part series, the panel set the tone for the full and frank discussion of the SIAC Secretariat’s processes and procedures. Mr Cooke summarised that the participants had confirmed what he had previously suspected – namely, that there was an incredible amount of interest from the community in getting a look behind the curtain and gaining insight on how SIAC, and institutions generally, operate. Happy New Year from all of us at SIAC and best wishes for a happy, healthy and successful 2018. As we welcome the new year, we look back fondly at some of the highlights of 2017. 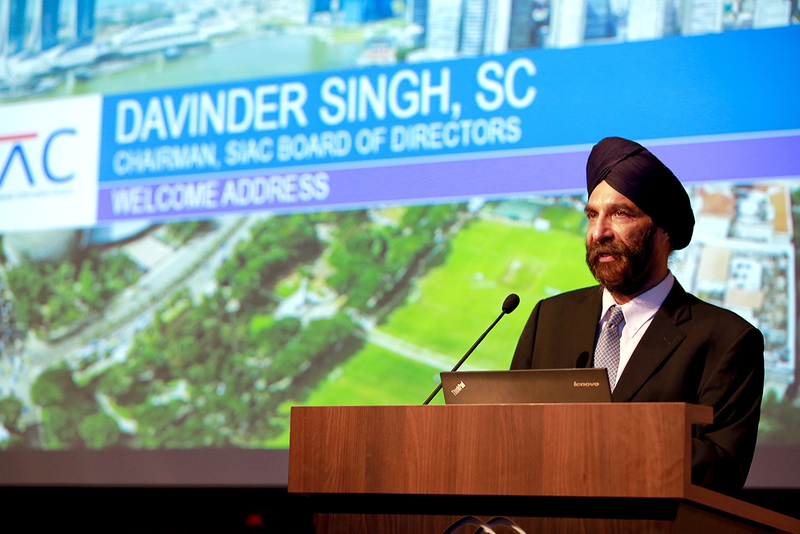 In April 2017, SIAC welcomed three new directors to SIAC’s Board of Directors under the chairmanship of Mr Davinder Singh, SC. They are Mr Chan Leng Sun, SC, of Baker McKenzie Wong & Leow, Mr Chong Yee Leong of Allen & Gledhill LLP, and Mr Tham Sai Choy, formerly the Chairman of KPMG in Asia Pacific. 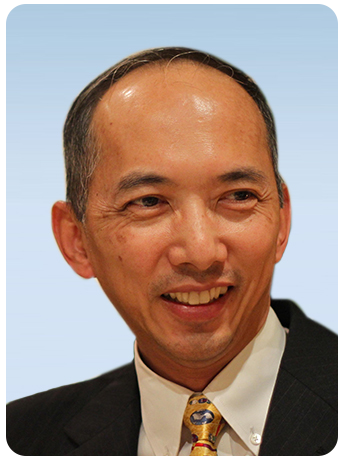 Mr Chan was appointed Deputy Chairman. Four new members were also appointed to SIAC’s Court of Arbitration in April 2017, which continues under the leadership of Mr Gary Born as its President. They are Professor Lawrence Boo and Mr Alan Thambiayah of The Arbitration Chambers, Ms Catherine Amirfar of Debevoise & Plimpton LLP, and Mr Nigel Blackaby of Freshfields Bruckhaus Deringer. In December 2017, SIAC announced its proposal on cross-institution cooperation for the consolidation of international arbitral proceedings. The SIAC proposal, which was initiated by Mr Gary Born, the President of the SIAC Court of Arbitration, is detailed in letters from Mr Born to other international arbitral institutions together with an attached memorandum. The memorandum proposes the adoption of a protocol by arbitral institutions permitting the cross-institution consolidation of arbitral proceedings subject to different institutional arbitration rules. Through institutional cooperation, the cross-institution consolidation proposal is designed to facilitate the efficient and enforceable resolution of international commercial disputes, which will lead to significant gains for parties. In August 2017, SIAC announced the opening of its second representative office in India (after its Mumbai representative office which was established in 2013), in the International Financial Services Centre in Gujarat International Finance Tec-City (GIFT IFSC), Gujarat. The opening of a second SIAC office in India in GIFT IFSC will allow SIAC to participate in GIFT’s economic development through the provision of a world-class dispute resolution mechanism to businesses and investors within GIFT IFSC, and will deepen SIAC’s existing ties with the legal and business communities in India. In the course of 2017, SIAC strengthened its Secretariat workforce with six new associate counsel hires who are qualified in India, Indonesia, Malaysia, and Singapore. 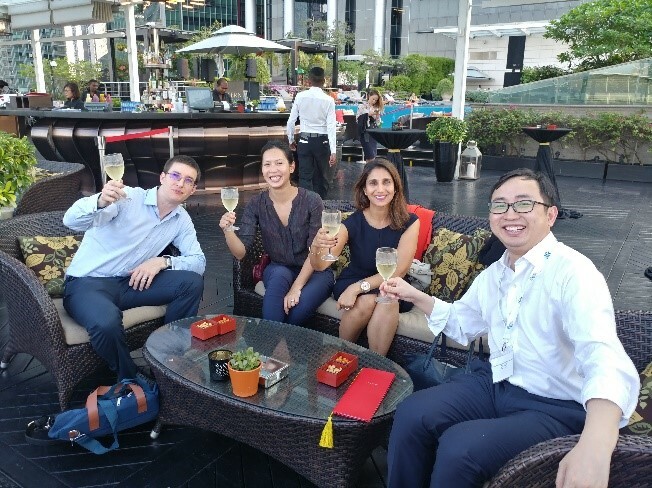 Our new colleagues are Ms Allison Goh, Ms Lim Shi Jean, Ms Pauline Low, Mr Piyush Prasad, Mr Kendista Wantah and Ms Angela Yap. With the latest additions to the team, SIAC now has lawyers from these and the following other countries: Canada, China, and USA. 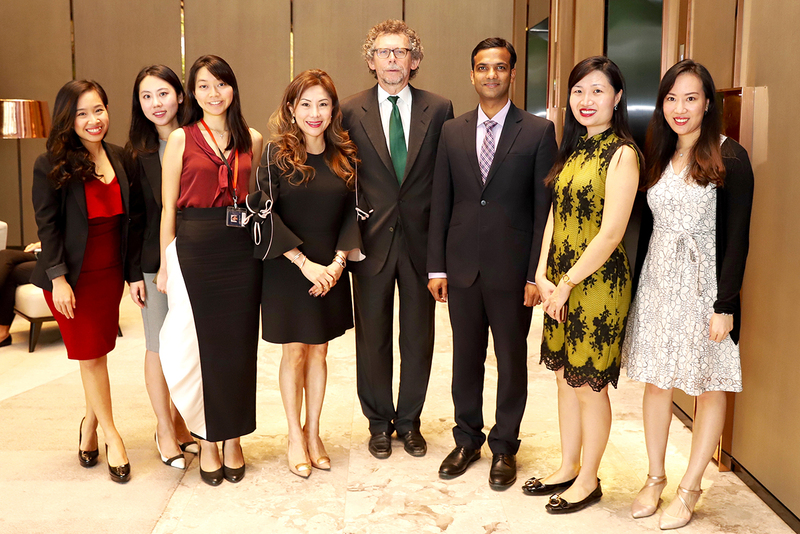 The inaugural SIAC Academy, titled “Time and Cost Savers at SIAC: Emergency Arbitration, Expedited Procedure and Early Dismissal”, was held in Singapore on 6 and 7 November 2017, to provide practical, “hands-on” training for arbitration practitioners and arbitrators. 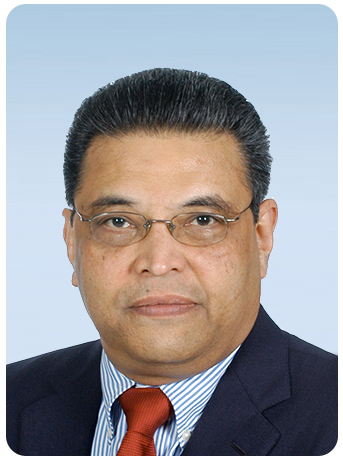 Mr Gary Born, President of the SIAC Court of Arbitration, chaired the teaching faculty which included Mr Chan Leng Sun, SC, Deputy Chairman of SIAC, members of the SIAC Court of Arbitration (Mr Toby Landau QC, Professor Lawrence Boo, Mr Alan Thambiayah) and other international arbitration luminaries. 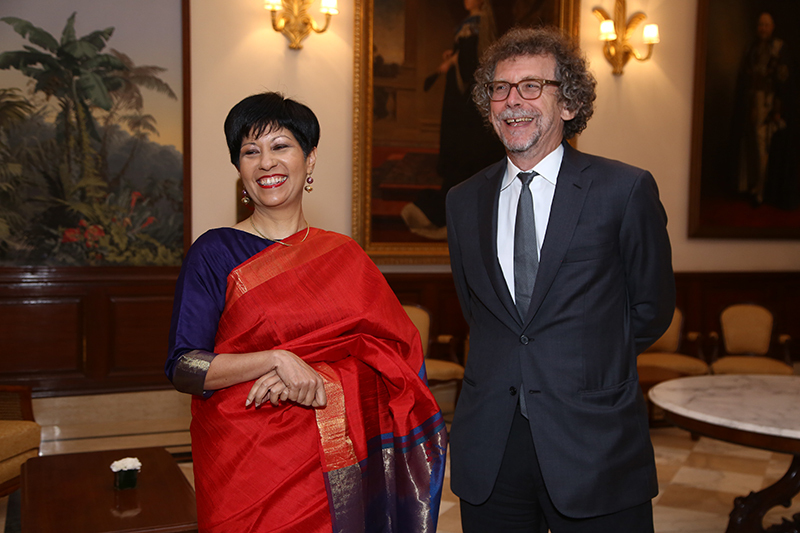 Ms Indranee Rajah, SC, Senior Minister of State for the Ministry of Law and Ministry of Finance, made a special appearance in a frank, highly interesting and lively discussion with Mr Born on developments in international arbitration in Singapore and in the region. 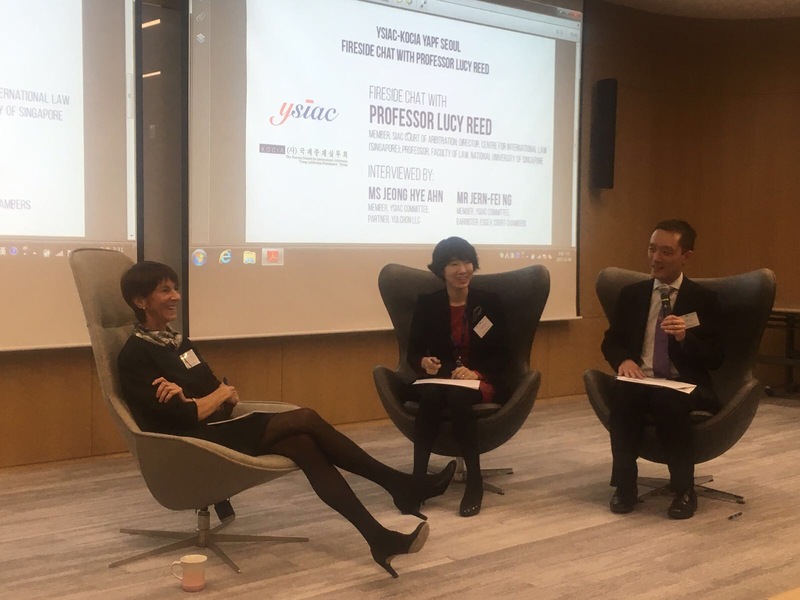 SIAC Court members, Professor Lucy Reed and Mr Toby Landau QC also spoke as panellists in an engaging lunchtime fireside chat. 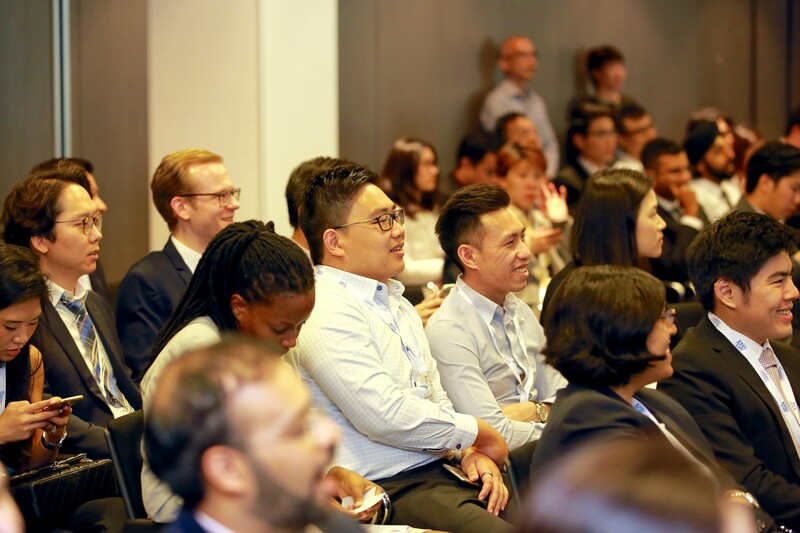 The Academy attracted a good turnout from both Singapore as well as overseas delegates from Bulgaria, China, Hong Kong, India, Indonesia, Japan, Korea, Malaysia, the United Kingdom and Vietnam. 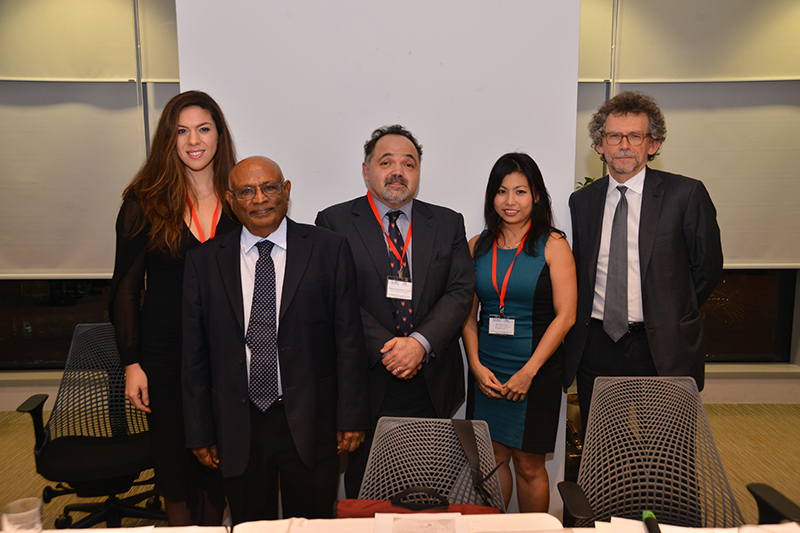 SIAC and the Centre for International Law, NUS (CIL), jointly organised the inaugural SIAC-CIL Academic-Practitioner Colloquium in November 2017. The format for the workshop involved two roundtable sessions, during which an academic presented her research paper on a current hot arbitration topic before a panel of eminent international arbitration experts who then engaged in an analytical discussion before an audience. 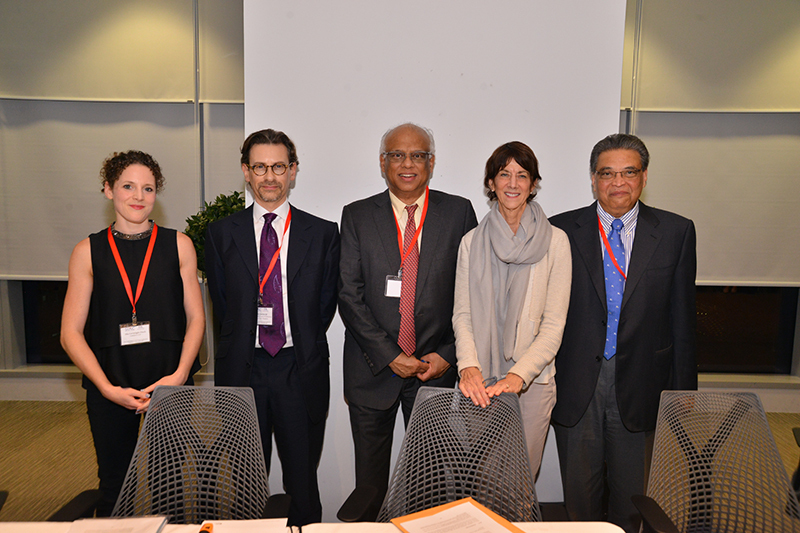 The two academics were Ms Elsa Sardinha and Dr Ula Cartwright-Finch, and the event featured a stellar line-up of panellists, including SIAC Court President, Mr Gary Born, members of the SIAC Court of Arbitration (Mr Toby Landau QC, Professor Lucy Reed and Mr Alan Thambiayah) and SIAC Board member, Mr Chelva Rajah, SC. 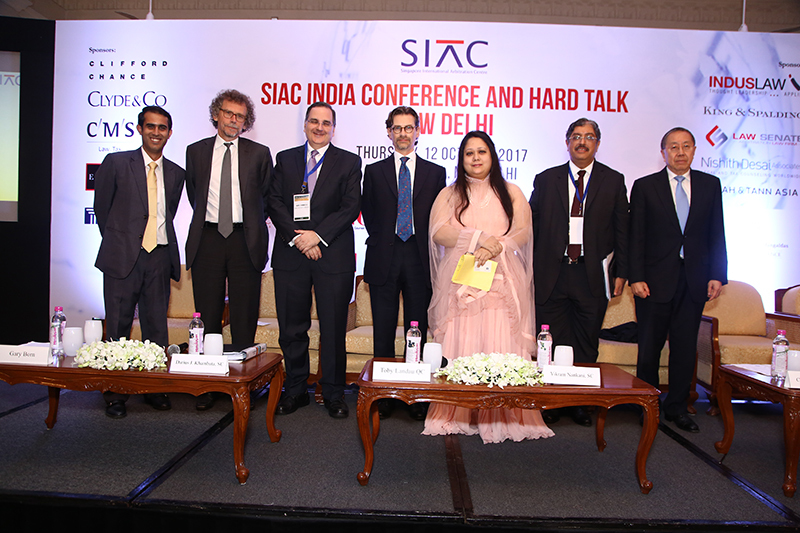 In 2017, SIAC organised a series of conferences and seminars in New Delhi, St. Petersburg, Seoul, Tokyo, and Xiamen. 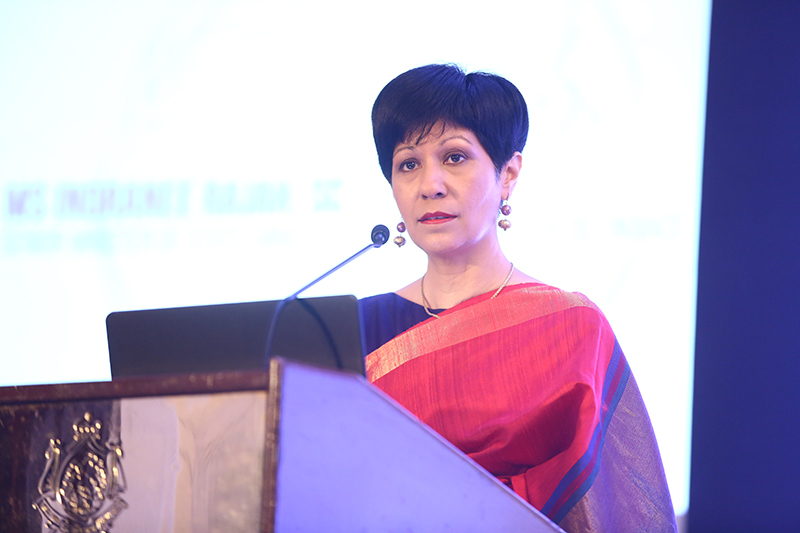 Ms Indranee Rajah, SC, Senior Minister of State for the Ministry of Law and Ministry of Finance, Singapore, delivered the opening address at the SIAC Hard Talk in New Delhi, as well as the special address at the SIAC India Conference. 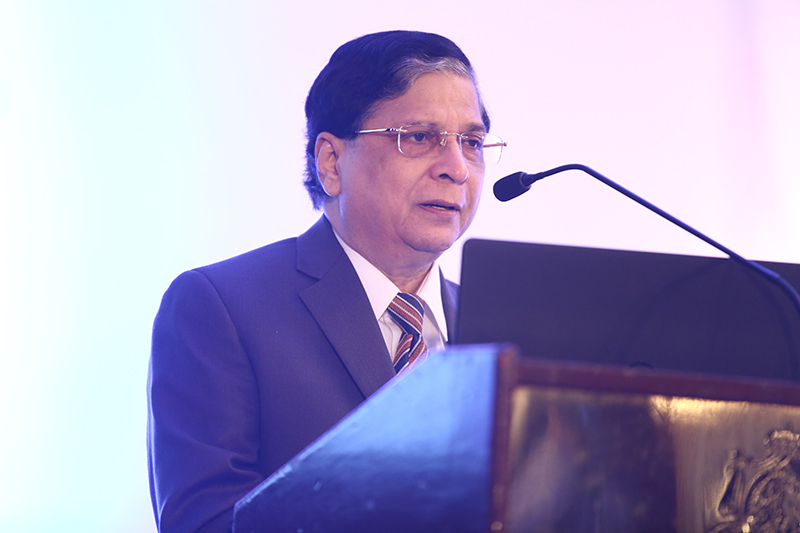 The Hon’ble Mr Justice Dipak Misra, Chief Justice of India delivered the special address for the SIAC Hard Talk, which was attended by the Hon’ble Mr Justice A K Sikri of the Supreme Court of India, Justice Gita Mittal, Acting Chief Justice of the High Court of Delhi and several other judges of the Delhi High Court. 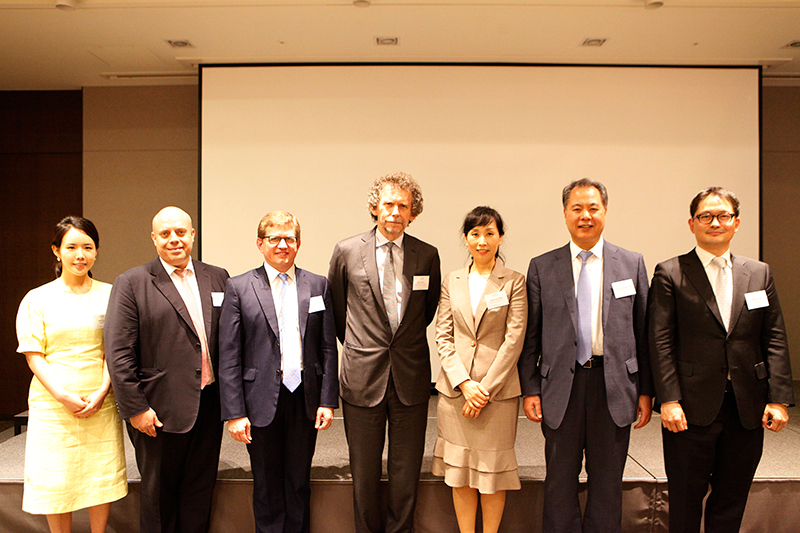 SIAC also partnered with other institutions to hold joint seminars and events in Shanghai with the Shanghai International Arbitration Centre (SHIAC), in Seoul with the Korea In-House Counsel Association (KICA) and Korean Commercial Arbitration Board (KCAB), and in Singapore with the Chartered Institute of Arbitrators, Singapore branch. Panellists included the President and members of the SIAC Board and Court, as well as leading arbitration practitioners and in-house counsel. 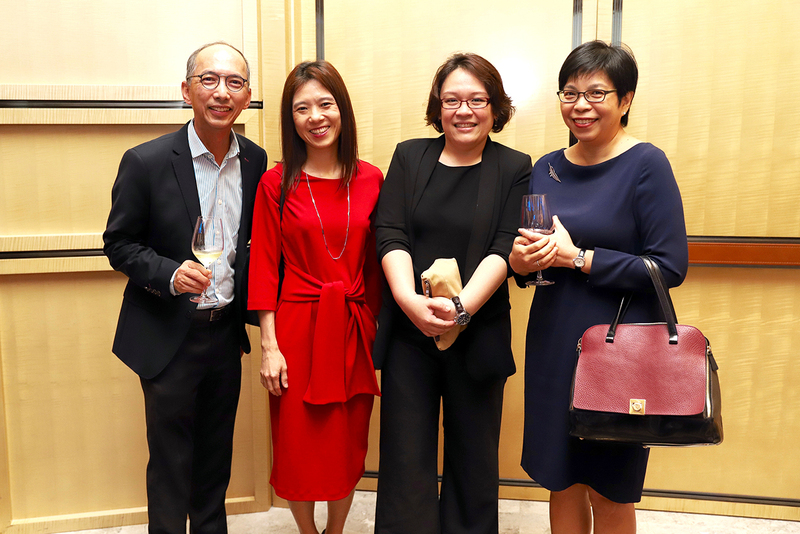 The events were well-attended by private practitioners, in-house counsel, government officials and members of the academe. 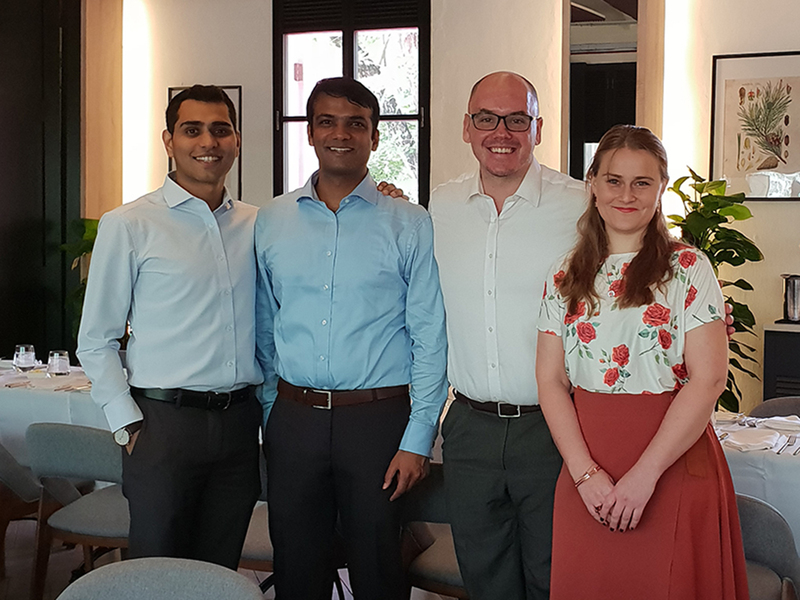 In January 2017, the YSIAC Committee, led by co-chairs Mr Ankit Goyal and Ms Koh Swee Yen, welcomed new committee members, Ms Jeong Hye Ahn, Ms Holly Blackwell, Mr Rishab Gupta, Mr Moazzam Khan, Mr Nicholas Lingard and Ms Julie Raneda. 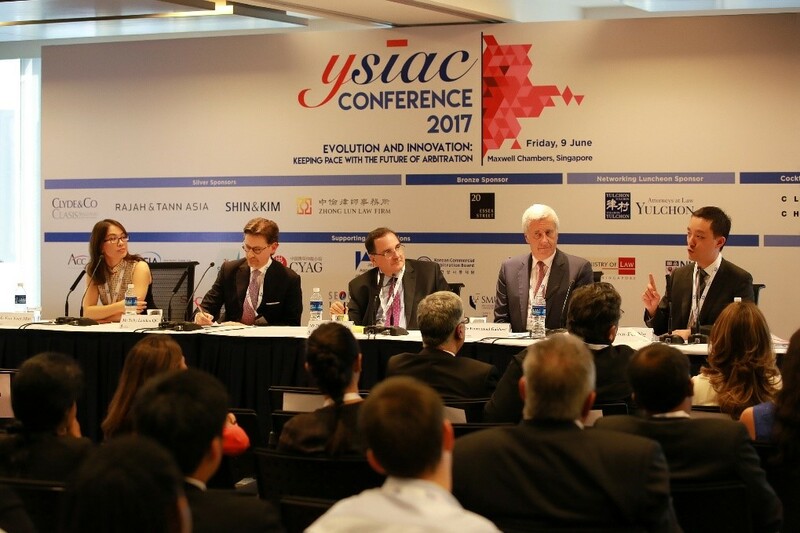 The biennial YSIAC Conference titled “Evolution and Innovation: Keeping Pace with the Future of Arbitration” was held in Singapore on 9 June 2017. The conference attracted almost 200 delegates from 12 jurisdictions, with delegates from places as far away as Sint Maarten, the United Kingdom and the United States. In conjunction with the YSIAC Conference, SIAC also organised the third YSIAC Essay competition, which received a record 73 entries from 25 jurisdictions. The winner was Mr Gabriel Li of Drew & Napier LLC. The 1st Runner Up was Ms Amy Seow of Rajah & Tann Singapore LLP and the 2nd Runner up was Mr Parul Kumar of Luthra & Luthra Law Offices. 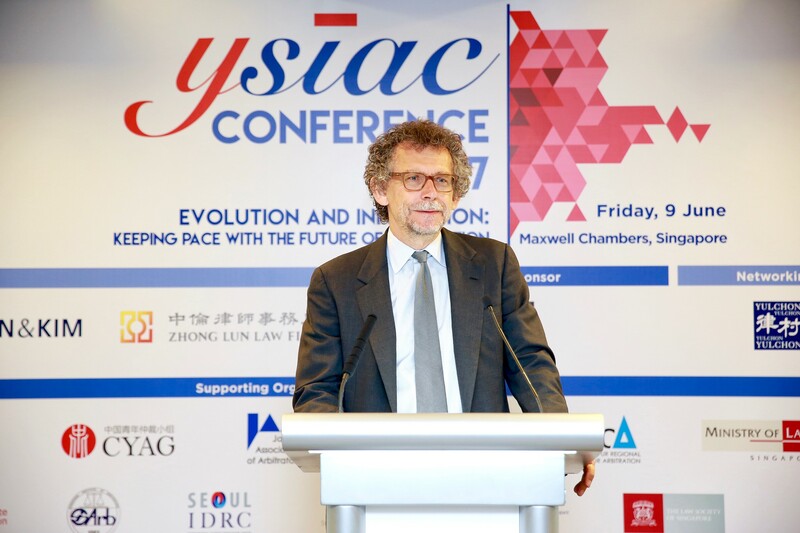 Other YSIAC events held in 2017 included the YPG KLRCA-YSIAC Advocacy Workshop in Kuala Lumpur, YSIAC Lunchtime Events in Singapore, YSIAC Oral Advocacy Workshop in New Delhi, and the YSIAC-KOCIA YAPF Fireside Chat in Seoul. In June 2017, SIAC entered into a Cooperation Agreement with Arbitrator Intelligence (AI), an entity affiliated with Penn State Law, to promote the use of the Arbitrator Intelligence Questionnaire (AIQ). The AIQ is a new feedback mechanism that will collect objective information and professional assessments of arbitrators’ case management skills and decision-making from users following the conclusion of their arbitrations. The data will be anonymised and be published only with the arbitrator’s consent. They will appear in reports which will be made available to subscribers. We would like to express our heartfelt thanks and appreciation to members of the SIAC Board, Court and the YSIAC Committee as well as all of our partners and friends in the local and international legal and business communities for their many contributions and consistent support. The Singapore International Arbitration Centre (SIAC) is pleased to announce its proposal on cross-institution cooperation for the consolidation of international arbitral proceedings. The SIAC proposal, which was initiated by Mr Gary Born, the President of the SIAC Court of Arbitration, is detailed in letters from Mr Born to other international arbitral institutions together with an attached memorandum. The memorandum proposes the adoption of a protocol by arbitral institutions permitting the cross-institution consolidation of arbitral proceedings subject to different institutional arbitration rules. Rules on consolidation, joinder and intervention in international arbitration play an important role in the international arbitral process. By allowing related issues to be resolved in a single proceeding, consolidation permits more efficient and cost-effective dispute resolution, whilst minimising the risk of inconsistent decisions in related disputes. These benefits have led a number of arbitral institutions to adopt provisions in their institutional rules that allow the consolidation of related disputes and/or the joinder of additional parties. The 2016 SIAC Arbitration Rules contain a state-of-the art set of provisions for consolidation, as do the rules of other leading arbitral institutions, including the International Chamber of Commerce Court of Arbitration (ICC). Importantly, however, the consolidation provisions of existing institutional rules of leading arbitral institutions do not permit the consolidation of arbitrations that are subject to different sets of institutional arbitration rules (for example, SIAC and ICC arbitrations), even if they satisfy the other criteria for consolidation. Instead, existing institutional rules provide for the consolidation of arbitral proceedings only where the parties’ various arbitration agreements are compatible, including by incorporating the same institutional arbitration rules. Thus, a SIAC arbitration can be consolidated with another SIAC arbitration, but not with an ICC arbitration; likewise, an ICC arbitration can be consolidated with another ICC arbitration, but an ICC arbitration cannot be consolidated with a SIAC arbitration. The lack of any existing mechanism for “cross-institution” consolidation of arbitrations subject to different institutional arbitration rules substantially limits the types of disputes that can be consolidated. In turn, this prevents related disputes, which otherwise meet the criteria for consolidation, from being heard together and thus limits the ability of arbitration to reach its full potential as a dispute resolution mechanism to serve the needs of users. SIAC has sought to address this shortcoming in the existing treatment of consolidation by arbitral institutions through enhanced institutional cooperation. In particular, the efficiency and efficacy of the international arbitral process would be materially improved by the adoption of a consolidation protocol by leading arbitral institutions, providing for the cross-institution consolidation of arbitrations, where such proceedings otherwise satisfy the criteria for consolidation. a. The consolidation protocol would set out a new, standalone mechanism for addressing the timing of consolidation applications, the appropriate decision-maker (i.e. the institution(s) or the tribunal) and the applicable criteria to determine when arbitral proceedings are sufficiently related to warrant cross-institution consolidation. A joint committee appointed from members of the Courts or Boards of the concerned arbitral institutions would be mandated to decide the applications, with a specific committee being appointed for each application. b. Once consolidated, the proceedings should be administered only by one institution applying its own arbitration rules. The institutions can agree on objective criteria to determine which institution should administer the consolidated dispute, such as the number of disputes subject to the different rules or the time of commencement of the first proceeding. The arbitral institutions’ rules would be amended to incorporate the consolidation protocol. By adopting the institutional rules in their arbitration agreements, parties would in turn give the protocol the same contractual force as other provisions of the institutional rules. The consolidation protocol would not change the current requirement that the arbitration agreements designate the same seat. The consolidation of arbitral proceedings offers important benefits to parties that help reduce the complexity, cost and time of proceedings. The cross-institution consolidation of arbitrations under different institutional rules takes these benefits further, making arbitration an even more effective system of dispute resolution. SIAC looks forward to receiving comments from, and working together with, users and other arbitral institutions to further explore and implement the proposal for cross-institution consolidation. 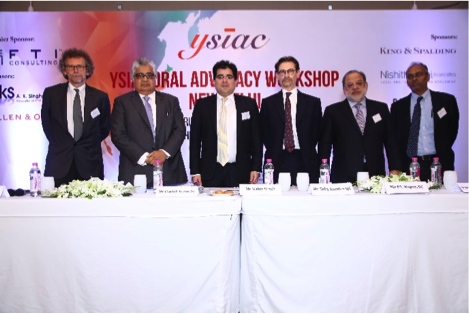 The SIAC-KCAB joint seminar, “Multiple Proceedings in Multiple Fora – Strategies and Synergies”, covered everything one would expect and more from a seminar addressing a pertinent and timely topic in the ever-evolving world of international arbitration. 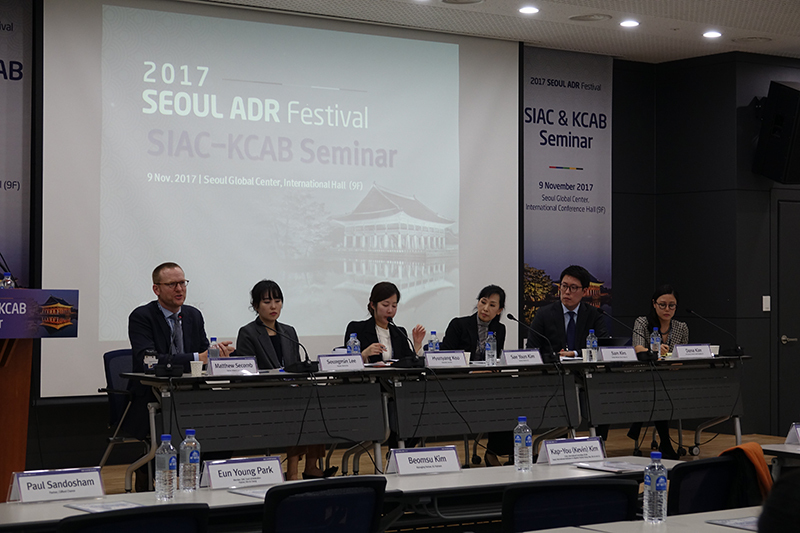 SIAC and KCAB jointly hosted the seminar at Seoul Global Center on 9 November 2017, as part of the week-long Seoul ADR Festival. Over 75 practitioners and in-house counsel attended the event, thanks to the all-star lineup of speakers and panellists who addressed joinder and consolidation provisions as a means to improve efficiency when dealing with multiple parties, contracts, and claims. Ms Lim Seok Hui (CEO, SIAC and SIMC) welcomed the attendees by stressing the importance of time and cost considerations when developing strategies for cross-border projects and transactions. She also articulated a vision in which Singapore and Seoul would work in synchrony as arbitration hubs in the APAC region, as what the arbitration hubs of Paris and Geneva had done for Europe. Professor Lucy Reed (Member, SIAC Court of Arbitration; Director, Centre for International Law (Singapore); Professor, Faculty of Law, National University of Singapore) delivered the Keynote Address by describing how national laws and arbitration rules were in conflict, and how each jurisdiction had the responsibility to respect the rules of other jurisdictions while fulfilling its own responsibilities and duties to the parties. While she stressed the importance of joinder and consolidation provisions as tools to overcome consent requirements when adding additional parties, she also wondered if, in practice, joinder and consolidation provisions actually improved efficiency of the arbitral proceedings and led to cost savings for the parties. 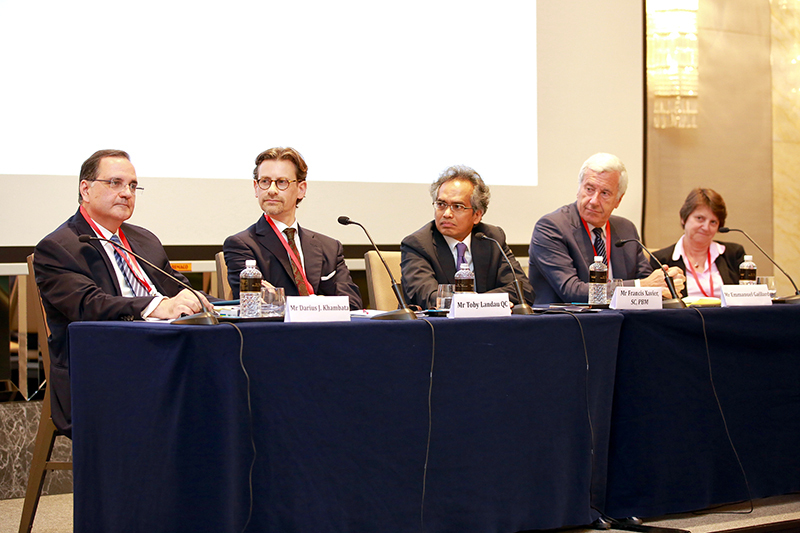 The first panel session included leading arbitrators and practitioners from across Asia, with each panellist wearing the hat of a different arbitral institution to discuss the different joinder and consolidation rules. Mr Kap-You (Kevin) Kim (Chair, International Arbitration Committee, KCAB; Head, International Arbitration & Litigation Practice Group, Bae, Kim & Lee LLC) was the moderator for the first panel session, which included panellists Mr Beomsu Kim (Managing Partner, KL Partners), Dr Eun Young Park (Member, SIAC Court of Arbitration; Partner, Kim & Chang), Professor Lucy Reed, and Mr Paul Sandosham (Partner, Clifford Chance). 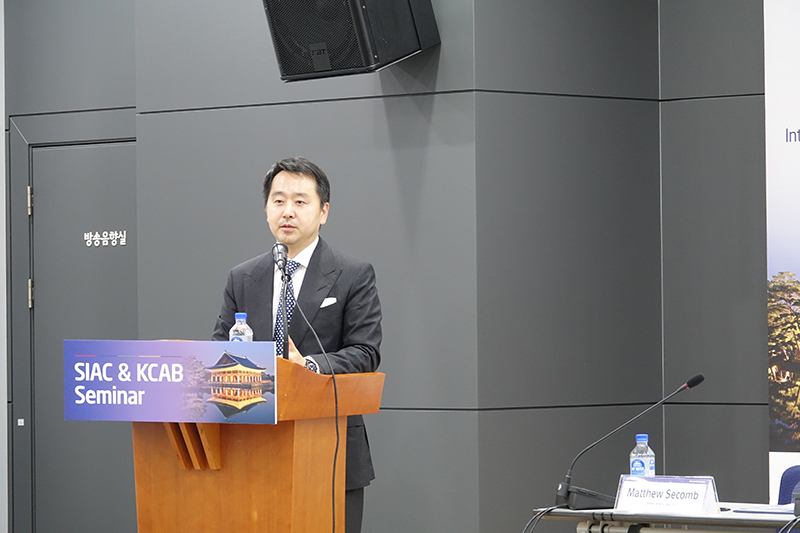 • Mr Beomsu Kim, representing the KCAB, noted how the simpler and more straightforward KCAB rules, which implemented a joinder provision in 2016, only allowed for parties to the current arbitration to apply for joinder and not third parties such as in other jurisdictions. The afternoon’s second panel session included younger attorneys from a broad spectrum of international arbitration practices in Asia. 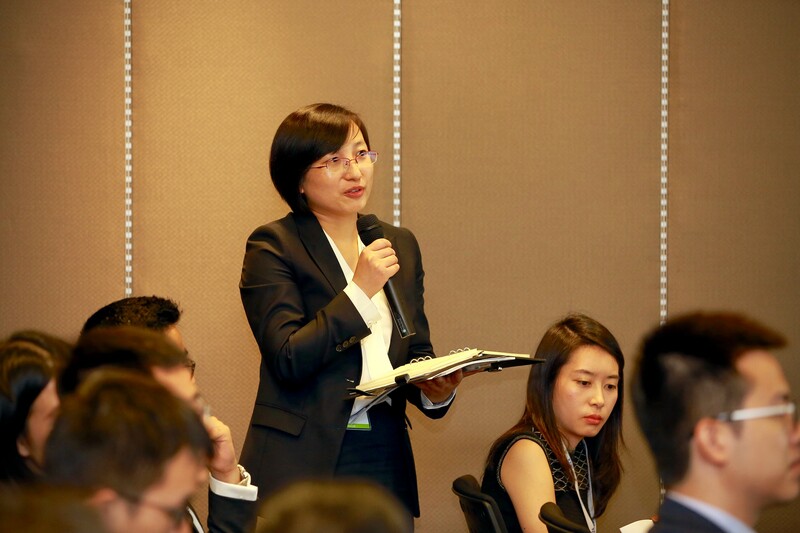 Ms Sae Youn Kim (Partner, Yulchon LLC), in moderating the panel, likened the experienced panellists of the first session to “generals” and the panellists of the second session to “soldiers” who executed the generals’ commands. The afternoon’s “soldiers” included Ms Dana Kim (Of Counsel, Herbert Smith Freehills LLP), Mr Sam Kim (Foreign Attorney, Yoon & Yang LLC), Ms Hyunyang Koo (Associate, Lee & Ko), Ms Seungmin Lee (Partner, Shin & Kim), and Mr Matthew Secomb (Partner, White & Case LLP). The panellists of the second session shared their experiences in working with complicated arbitration cases, and the lessons that they had learned along the way. Mr Matthew Secomb described how some parties had used joinder and consolidation as tools for tactical advantages, and labelled parties who wanted to keep things simple as “angels”, and parties who sought to complicate matters as “devils”. Mr Kap-You (Kevin) Kim brought the afternoon to a close, noting that with the number of multiparty international disputes growing in Korea, the timing of the seminar could not have been more opportune. 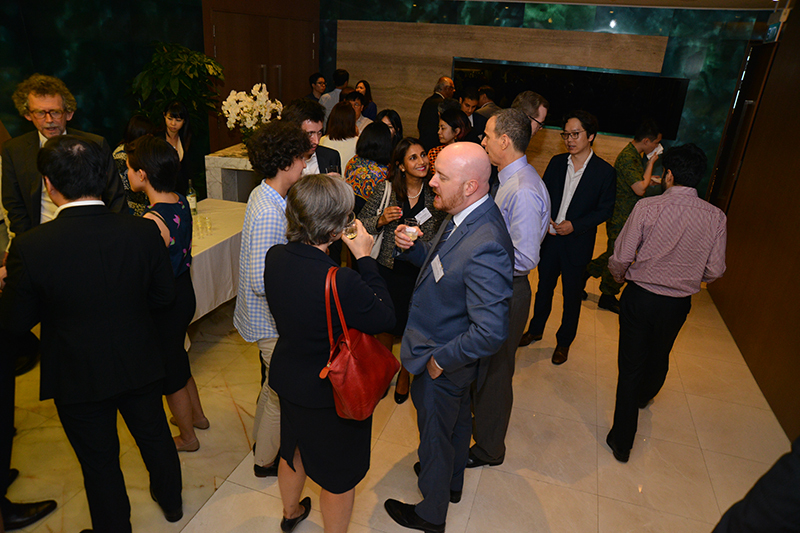 On 8 November 2017, YSIAC and KOCIA YAPF hosted the “Fireside Chat with Professor Lucy Reed” at Yulchon LLC, attracting a vibrant crowd of over 55 attendees from a variety of professional and legal backgrounds. 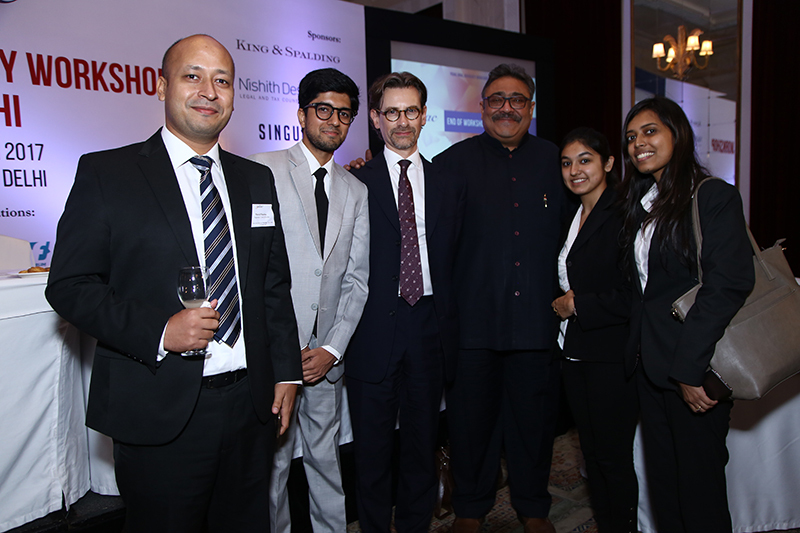 Among the attendees were in-house counsel, practising lawyers and academics. The event opened with a Welcome Address by Ms Lim Seok Hui (CEO, SIAC and SIMC), who outlined the recent developments in international dispute resolution around the globe. Ms Lim’s address was followed by the highlight of the event, the Fireside Chat with Professor Reed. 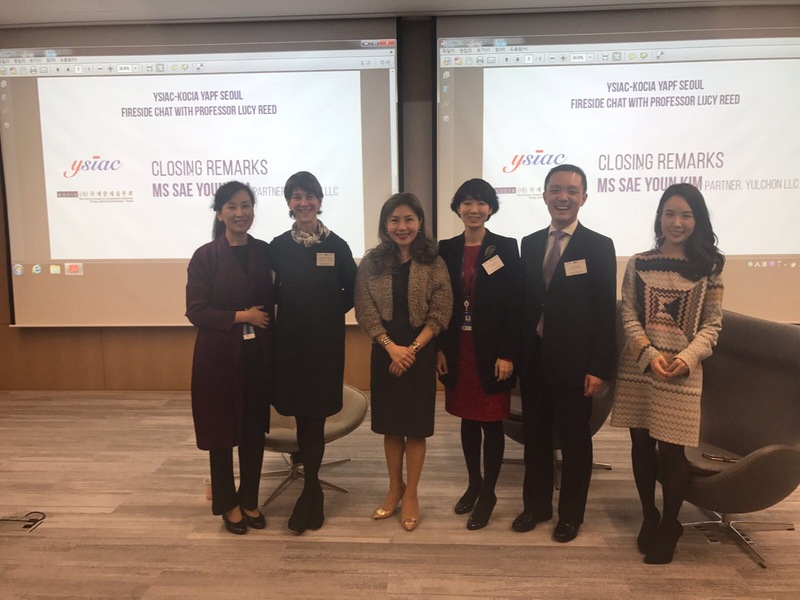 The chat was moderated by Ms Jeong Hye Ahn (Member, YSIAC Committee; Partner, Yulchon LLC) and Mr Jern-Fei Ng (Member, YSIAC Committee; Barrister, Essex Court Chambers). The Chat provided a forum for discussing hot topics such as challenges and opportunities arising from recent developments in international commercial and investor-state arbitration, gender diversity in international arbitration, and other burning questions that the participants wished to pose to Professor Reed. 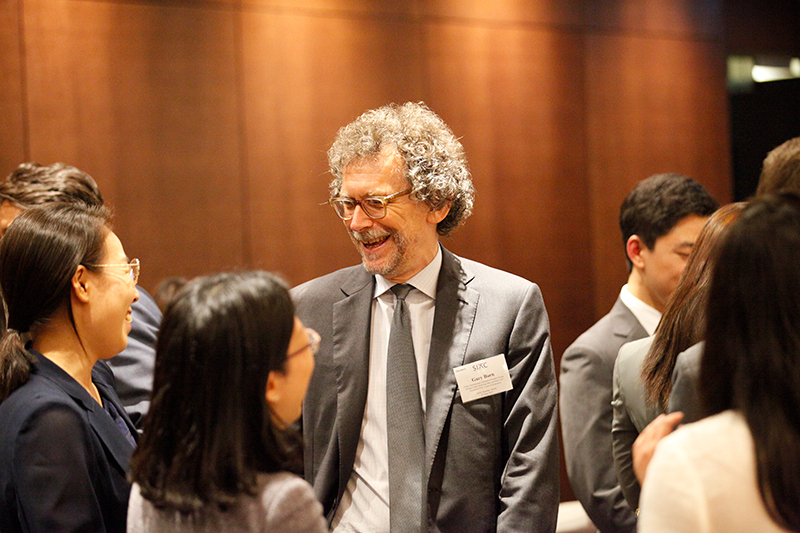 Of particular interest to the attendees was the future of mediation and arbitration in Seoul. Professor Reed provided insight on how Seoul could develop into an arbitration hub and the ways in which Korea could establish mediation as one of the primary mechanisms of dispute resolution. 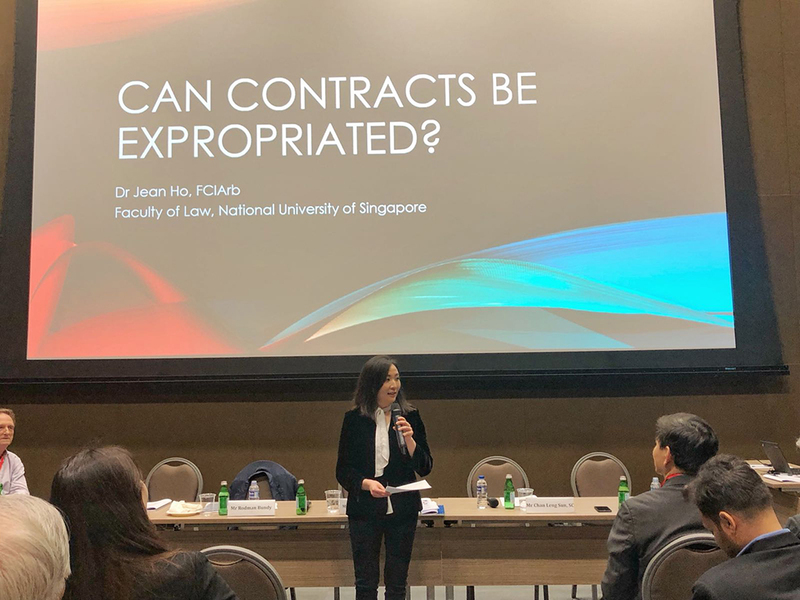 The event ended with Closing Remarks by Ms Sae Youn Kim (Partner, Yulchon LLC), who shared her personal observations and insights into what it meant to be a practitioner in the field of international arbitration. 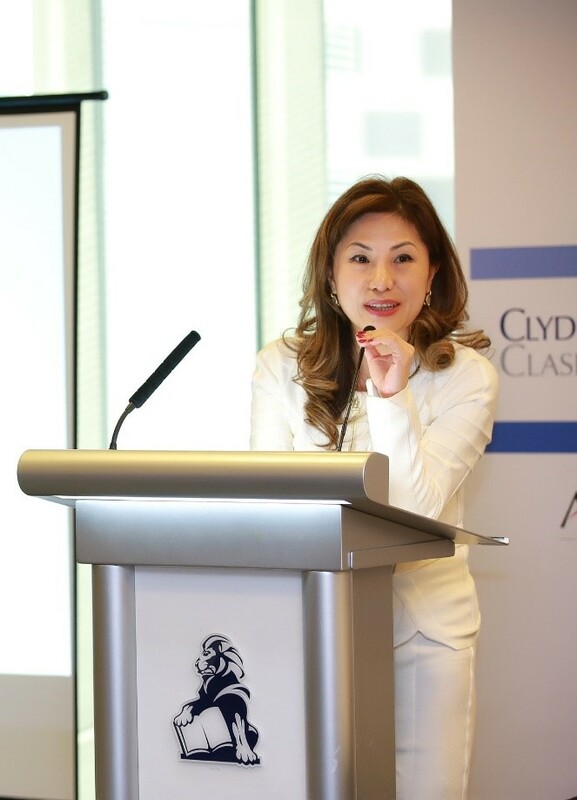 Emphasising the vast diversity of issues that may arise in international arbitration, Ms. Kim talked about the intellectually challenging yet highly rewarding nature of her work. The pursuit of knowledge is never-ending for a practitioner of international arbitration. 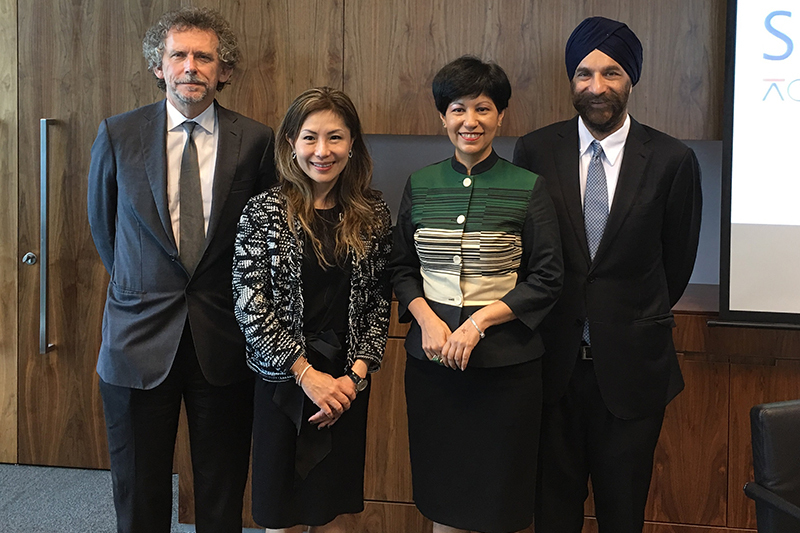 The inaugural SIAC-CIL Academic-Practitioner Colloquium on 7 November 2017 was significant as it marked an important development in the Singapore arbitration arena. Essentially, the event provided academics with a platform to showcase their current research work in the field of international arbitration, and to test their ideas on a panel of arbitration practitioners and fellow academics. In turn, the event provided practitioners with an opportunity to interact with academics researching on issues that might have relevance to their areas of practice. 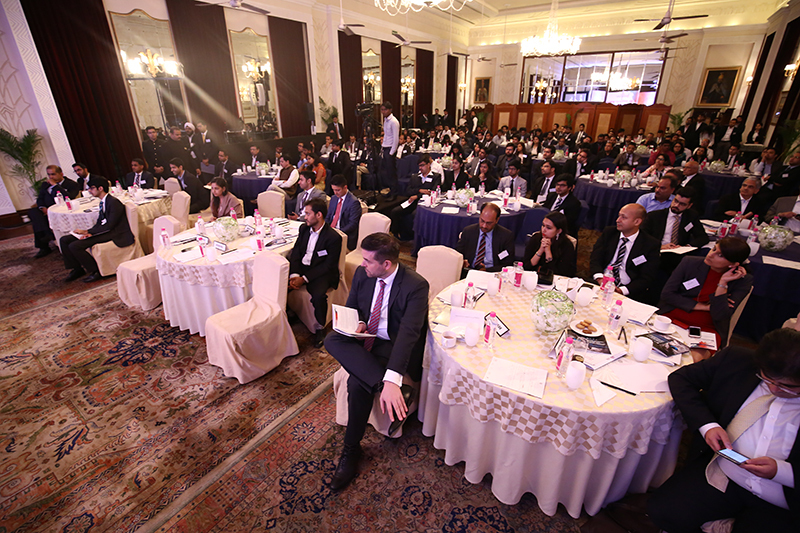 The event was well attended, and attracted an audience of 100 attendees, comprising corporate counsel, practising lawyers and academics. 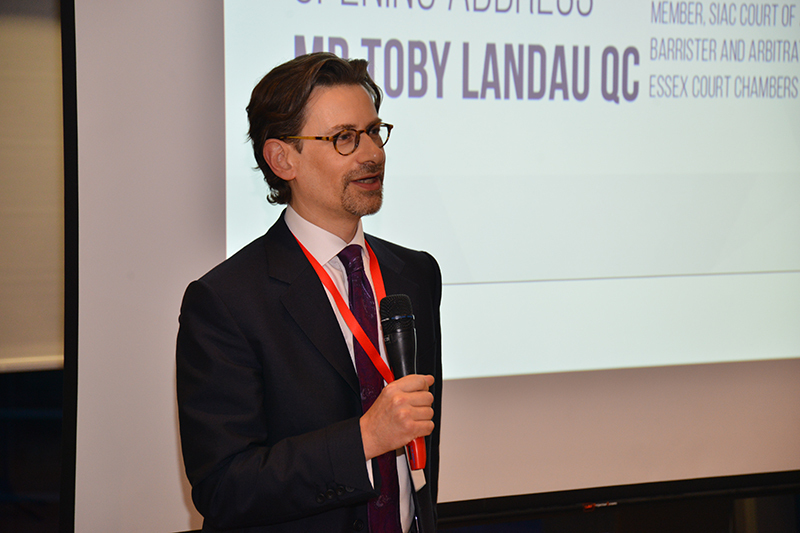 Mr Toby Landau QC (Member, SIAC Court of Arbitration; Barrister and Arbitrator, Essex Court Chambers) kicked off the event with opening remarks explaining the format and purpose of the seminar. This was then followed by the paper presentations by the two academics and panel discussions. The two researchers who presented at the inaugural event provided an insightful discussion on the integration of a two-tier court system into new trade agreements, and also shed light on how a witness’ memory might be distorted and the impact of this on witness testimony in international arbitration. 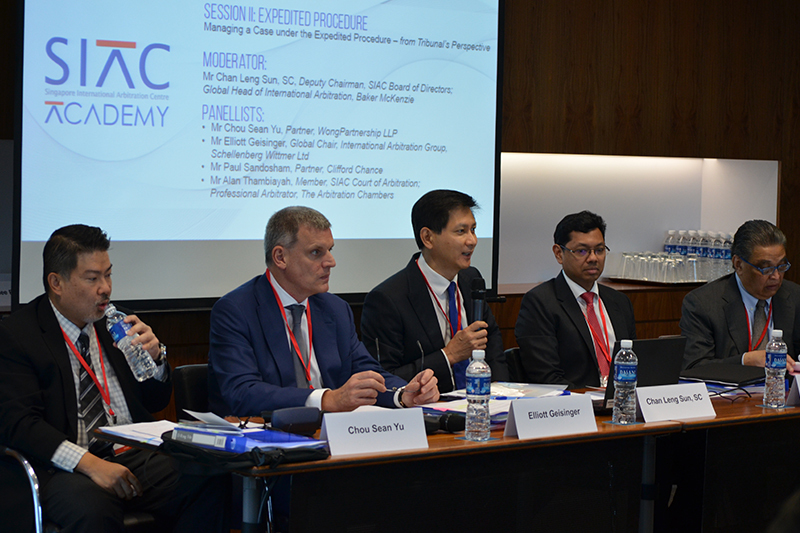 The panel sessions comprising seasoned arbitration practitioners also provided participants with candid, and at times, critical insight into the realities of international arbitration practice. Ms Elsa Sardinha (Research Associate & Practice Fellow to Chris Thomas QC, Investment Law & Policy Group, Centre for International Law (Singapore); National University of Singapore) presented the first paper. The first panel session was moderated by Professor Nicolas Jansen Calamita (Head, Investment Treaty Law & Policy, Principal Research Fellow; Research Associate Professor, Centre for International Law (Singapore); National University of Singapore), and comprised Mr Gary Born (President, SIAC Court of Arbitration; Chair, International Arbitration Practice Group, Wilmer Cutler Pickering Hale and Dorr LLP), Ms Koh Swee Yen (Co-Chair, YSIAC Committee; Partner, WongPartnership LLP) and Professor Muthucumaraswamy Sornarajah (C J Koh Professor, Faculty of Law, National University of Singapore). Since 2004, treaties have become more complex and more precisely drafted to provide a richer context for interpretation. Two new treaties that were recently introduced – the Canada-EU Comprehensive Economic Trade Agreement (CETA) and the EU-Vietnam Free Trade Agreement (EU-Vietnam FTA) – were reflective of this shift in treaty-drafting practice. Both treaties established a two-tier investment tribunal system (ITS), where a permanent appellate tribunal has the power to review tribunal decisions. The ITS provides for a spectrum of possible challenges to arbitral awards by incorporating the grounds for annulment in Article 52 of the ICSID Arbitration Rules into both treaties, together with the power to review for errors of law and fact. Further, the CETA has a 24-month deadline for the final award to be rendered whereas the EU-Vietnam FTA has an 18-month deadline for the final award to be rendered. Elsa analysed the ITS under these two treaties, and argued that the treaties contained some potentially problematic features, such as the removal of the involvement of disputing parties in the selection of the tribunal members and the extremely tight deadlines to render final awards. In particular, considering the number of rounds of pleadings and the time that the tribunal would require to digest submissions in order to reach its decision, she suggested that the short deadline was unrealistic. While the creation of the ITS aimed to solve the problem of the lack of independence and impartiality of some arbitrators, the panellists questioned whether this problem was in reality so prevalent in practice that it warranted such a drastic change. The panellists also pointed out other problems with the ITS, such as the limited term of tribunal members and the potential effect of the lack of tenure on tribunal members’ decision-making, and the disadvantages which might be faced by States with less bargaining power. Whilst there may be some potential benefits of implementing such a tribunal system, the panellists did acknowledge that such a radical change should be cautiously proceeded with. 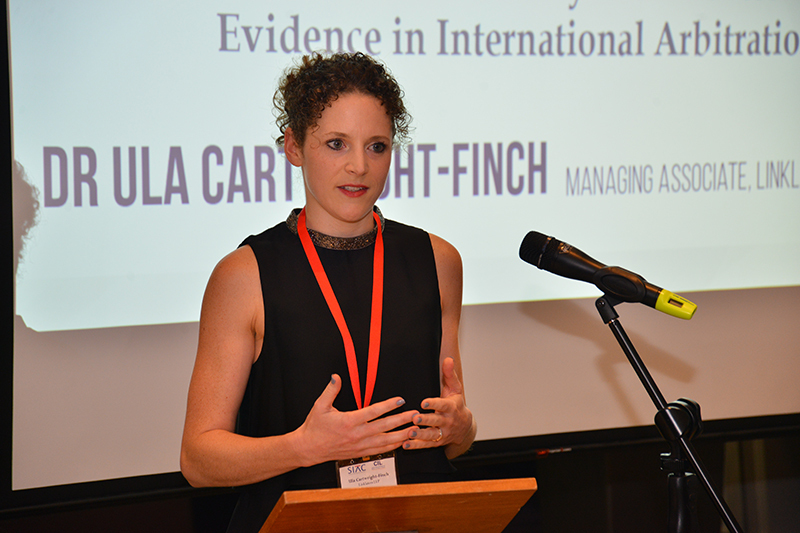 Dr Ula Cartwright-Finch (Managing Associate, Linklaters LLP, London) presented the second paper on “Human Memory and Witness Evidence in International Arbitration”. The second panel session was moderated by Mr Chelva Rajah, SC (Member, SIAC Board of Directors; Managing Partner, Tan Rajah & Cheah), and comprised Mr Toby Landau QC, Professor Lucy Reed (Member, SIAC Court of Arbitration; Director, Centre for International Law (Singapore); Professor, Faculty of Law, National University of Singapore) and Mr Alan Thambiayah (Member, SIAC Court of Arbitration; Professional Arbitrator, The Arbitration Chambers). The accuracy of a witness’ memory is crucial to the various stages of an international arbitration, from the initial investigation, to the focused investigation, the preparation of witness statement and the hearing. However, the ability of witnesses accurately to recollect events from the past and provide reliable testimony has always been a controversial issue in international arbitration. Drawing on research in psychology and neuroscience, Ula suggested that the human memory undergoes a continuous reconstructive process that is susceptible to distortion. In her presentation, Ula discussed 3 instances in which a witness’ memory might be distorted and how these effects might arise in the context of witness testimony in international arbitration. Firstly, the misinformation effect, whereby a witness’ recollection of episodic memories could become less accurate due to post-event information such as the way that a question was posed during the cross-examination. In a 1975 research by Loftus & Zanni, after a video was shown to participants, they were split into two focus groups. The first group was asked whether they had seen a broken headlight, whereas the second group was asked whether they had seen the broken headlight. It was shown that participants in the second group were more likely to report having seen a broken headlight. Secondly, a witness might be susceptible to false memories, whereby his or her recollection of events might be affected by his or her personal belief or opinion. This was exemplified by the “lost in the mall” scenario, whereby confabulations about events that never took place – such as having been lost in a shopping mall as a child – could be created through suggestions made to participants. Lastly, a witness’ memory might be conformed and compromised when another person’s recollection of a memory influences his or her recollection of the same experience. Distortions of witness’ memories may have severe consequences by impacting the witness’ testimonies and consequently the findings of fact in an award. Therefore, in her paper, Ula proposed some practical strategies to mitigate the potential impact of these effects on memory, such as carrying out timely witness interviews and taking special precautions in framing the questions during the interviews. The panellists noted that the problems with witness recollection would extend to the cross-examination and re-examination stages of the arbitration as well. The panellists also observed that the research conducted on witness recollection have thus far been carried out in relatively controlled scenarios, and hence might not accurately reflect or be directly applicable to international arbitration processes. There was nonetheless consensus in the room that these witness recollection issues highlighted the importance of arbitration tribunals in the assessment of witness testimonies. The various reports on the SIAC Academy can be accessed here. 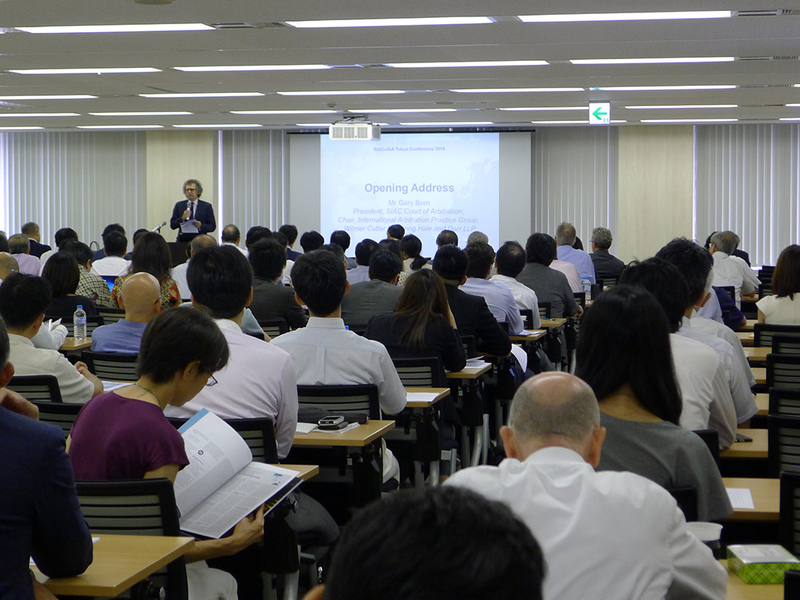 Backed by popular demand, the SIAC Academy 2018 will be held in Seoul (15 to 16 June 2018), Tokyo (7 to 8 September 2018) and Mumbai (6 to 7 October 2018). Please mark your calendars. 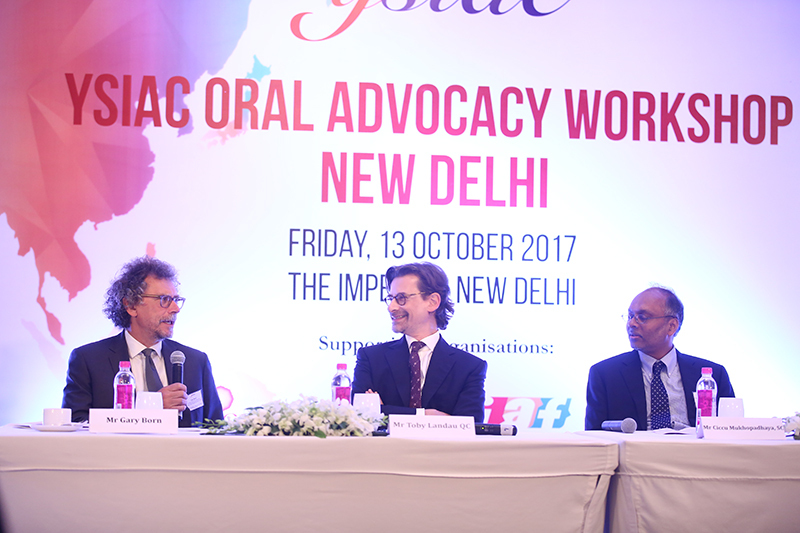 On the evening of Friday, 13 October 2017, a room full of arbitration luminaries and enthusiasts engaged in an open dialogue on the “art” of oral advocacy and conducted a mock application for emergency interim relief. The Emergency Arbitrators for the mock scenario comprised Mr Gary Born (President, SIAC Court of Arbitration; Chair, International Arbitration Practice Group, Wilmer Cutler Pickering Hale and Dorr LLP), Mr Toby Landau QC (Member, SIAC Court of Arbitration; Barrister and Arbitrator, Essex Court Chambers), Mr Ciccu Mukhopadhaya, SC (Supreme Court of India), and Mr Harish Salve, SC (Member, SIAC Court of Arbitration; Blackstone Chambers). Mr Kevin Nash (Deputy Registrar & Centre Director, SIAC) kicked off the workshop charting how SIAC had become a major player among international arbitral institutions, and one of the preferred arbitral institutions amongst Indian parties. This was followed by a brief introduction to the mock case scenario by Mr Rishab Gupta (Member, YSIAC Committee; Partner, Shardul Amarchand Mangaldas & Co). Thereafter, the ball started rolling and the Preliminary Objections Session began. The first three sets of counsel dealt with three jurisdictional objections raised in the mock case scenario: (i) whether, by the reference to “Singapore Chamber of Commerce”, a non-existent entity, the parties had intended to choose SIAC as the administering institution for arbitration; (ii) whether mediation talks between the parties were a pre-condition to arbitration and had been satisfied; and (iii) who were the proper parties to the arbitration. On the first jurisdictional objection, counsel for the Claimant, Mr Sonal Kumar Singh (Partner, M/s A. K. Singh & Co.), stressed how certain arbitral institutions had become synonymous with geographical areas, and that the reference to “Singapore” must signify SIAC. On this point, Mr Landau QC was quick to point out that by the same token, the words “Chamber of Commerce” could signify the parties’ intent to choose the ICC. Counsel for the Respondent, Mr Moazzam Khan (Member, YSIAC Committee; Co-Head, International Disputes Practice, Nishith Desai Associates), argued that it was not possible to infer from the clause any intention as to “which institution” and “where”, and was only possible to infer that there was an intention to arbitrate. On the second jurisdictional objection, Mr Prateek Bagaria (Partner, Singularity Legal), argued that the arbitration clause would only “mature” upon the activation of the temporal jurisdiction of the tribunal after the stipulated time period for mediation talks had expired. This led Mr Born to wonder aloud, “Are arbitration clauses teenagers that they would ‘mature’?”, which led to much laughter from the audience, including Mr Bagaria. Next, counsel for the Claimant, Mr Anirban Bhattacharya (Partner, Luthra & Luthra Law Offices) submitted that the agreement to mediate, being an agreement to agree, was not enforceable under the governing law, which in his submission was Indian law. Mr Landau QC inquired whether it was artificial to submit that the “agreement to mediate” was illegal, and separate it from the “agreement to arbitrate”, when both the arbitration and mediation clauses were subordinate clauses of the same clause in the agreement. Mr Bhattacharya responded that while both subordinate clauses were related, only the latter was an arbitration agreement, and hence, different laws would in his opinion apply to both. On the third jurisdictional objection, submissions were made for the Respondent by Mr Lomesh Kiran Nidumuri (Partner, IndusLaw) and for the Claimant by Ms Sheila Ahuja (Of Counsel, Allen & Overy). The discussion between the counsel and the arbitrators revolved around exceptions to the rule of privity of contract, and how, given that the emergency arbitration mechanism was a provisional measure, the emergency arbitrator (EA) was only required to take a prima facie view on proper parties. After a short break, the Workshop proceeded to the fourth session, with counsel making submissions on the applicable test for interim relief. Ms Elodie Dulac (Partner, King & Spalding), who acted as counsel for the Claimant, submitted that the essential conditions were fulfilled: there being presence of risk, causation of irreparable harm, and a prima facie case on the merits. She also submitted that the test of urgency was also satisfied, namely “whether harm could happen before an award was passed on the merits”. However, Mr Born was of the view that such tests would make the threshold for the grant of interim relief too low. Acting for the Respondent, Mr Promod Nair (Founding Partner, Arista Chambers) submitted that the three jurisdictional objections submitted previously showed the absence of a prima facie case, and that the EA ought to pass an order that was “necessary”, not “appropriate”, thereby signifying a higher threshold for grant of interim relief. The fifth session pertained to whether or not emergency interim relief should be granted by the EA. Mr P.V. Kapur, SC, argued for interim relief to be granted since there were risks involved as one of the Respondents did not own any known assets. Acting for the Respondent was Mr Landau QC (who had switched from being an EA to counsel), who submitted that there was no prima facie case on the merits, to which Mr Salve, SC, intervened and asked how the EA could possibly decide at the present stage that there was no prima facie case on the merits from the Claimant’s side. Mr Landau QC responded by saying the burden to prove the same, as well as the burden to prove that the Respondent was ill-intentioned and there was a risk involved if the relief was not granted, lay solely with the Claimant. With that, the mock arbitration hearing concluded. In short, these five sessions were thoroughly enlightening. 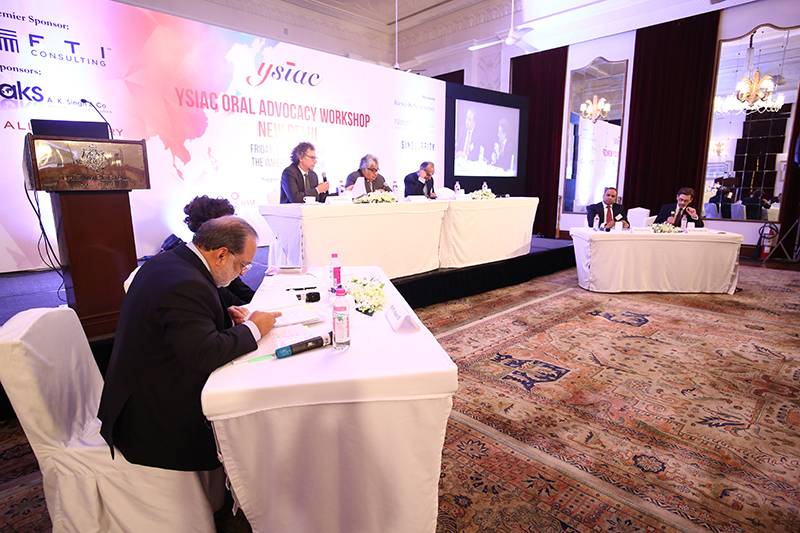 What followed was even more exciting: the feedback by the Tribunal, moderated by Mr Kabir Singh (Member, YSIAC Committee; Partner, Clifford Chance). Mr Born was extremely impressed by the performance of the various counsel under fire from what he admitted was “not an easy tribunal”. Mr Landau QC, with a good sense of humour, chimed in with a remark that given the time allotted and the complexity of the problem, “everyone was brilliant, except counsel for the Respondent in the last session (himself)”! 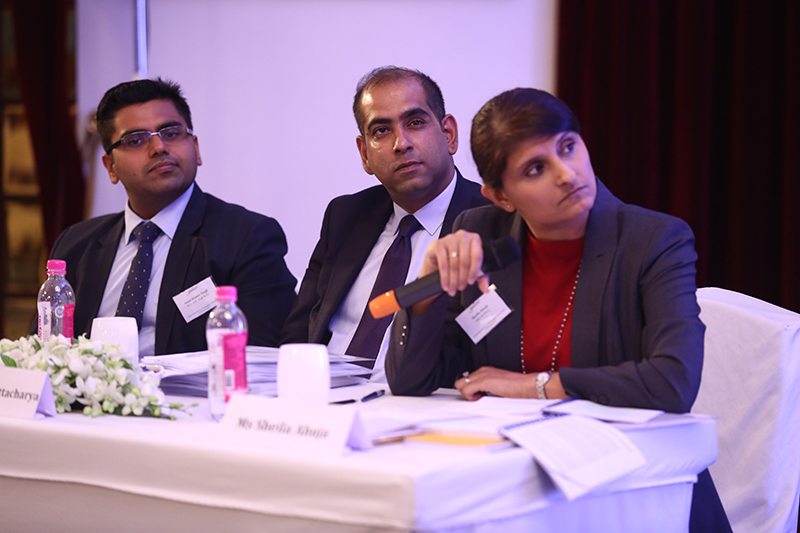 The panellists then discussed the challenges affecting the growth of arbitration globally. Mr Landau QC and Mr Salve, SC emphasised the need to “unlearn”, noting that there needed to be more attempts to make a departure from “litigation advocacy” towards “arbitral advocacy”. Talking further about such a transition, especially for young professionals, Mr Mukhopadhaya, SC, and Mr Born said that young professionals should enter into the world of arbitration from the very beginning, but never leave courtroom lawyering behind. “Litigation and arbitration have as many similarities as dissimilarities”, Mr Born added. Mr Salve, SC spoke about how to “read” a tribunal, by trying to sell it an idea and understand their thought process. Mr Landau QC emphasised that the audience was neither the opponent, nor the client, but the tribunal. Mr P.V. Kapur, SC, spoke about the need for more cross-examination experience for young professionals, with Mr Salve, SC, noting that no case should be too small and every opportunity should be seized by young professionals. On language barriers in arbitrations, Live Note service providers and transcriptions were recommended as the expensive and cheap options respectively. The panellists were also asked to recount their “best as well as worst experience professionally” to much interest and laughter. In the Closing Remarks, Mr Nish Shetty (Partner, Clifford Chance) applauded SIAC for organising the workshop which offered invaluable insights into the practice of arbitration through the mock arbitration. 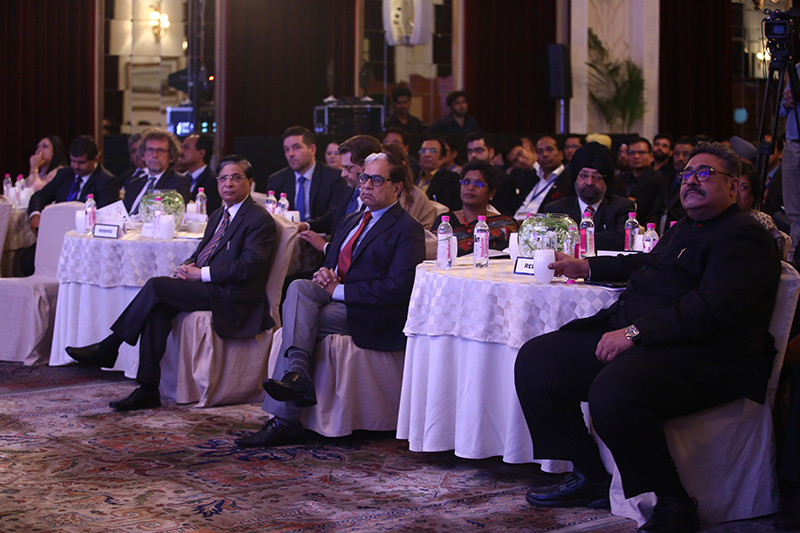 He also mentioned that the growing practice of arbitration in India will lead to the emergence of an “arbitration bar” and that such events were contributing to the same. He expressed hope that arbitration would go from being an “extra-curricular” to a full-time career. He expressed gratitude to the counsel and members of the EA Tribunal for taking time from their busy schedules for what was, indeed, a unique night of learning. 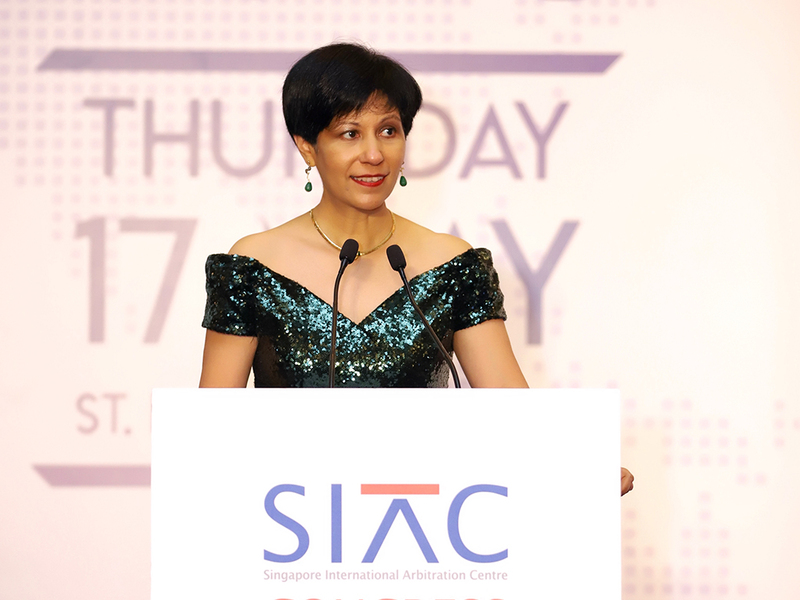 The Singapore International Arbitration Centre (SIAC) is pleased to announce that it has entered into a Memorandum of Understanding (MOU) with the Institute of Modern Arbitration (IMA) of the Russian Federation to support and promote the development of Singapore and Russia’s arbitration regimes. Under the MOU, SIAC will conduct training programmes, seminars and workshops for IMA and the arbitrators of the Arbitration Center established at the IMA. In addition, the institutions will also co-organise seminars, conferences and workshops in international arbitration. The MOU was signed by Ms Delphine Ho, Registrar of SIAC, and Mr Andrey Gorlenko, General Director of IMA, at the 8th Session of the High-Level Russia-Singapore Inter-Governmental Commission (IGC8) in Moscow. Mr Andrey Gorlenko, General Director of IMA, said, "IMA has established The Arbitration Center at the IMA, which is one of the first permanent arbitral institutions authorised by the Russian Government to administer disputes under the new Russian arbitration law. We are delighted to have entered into an MOU with SIAC, and are confident that this collaboration will enable both institutions to forge closer ties with existing and potential users of international arbitration in both Russia and Singapore." 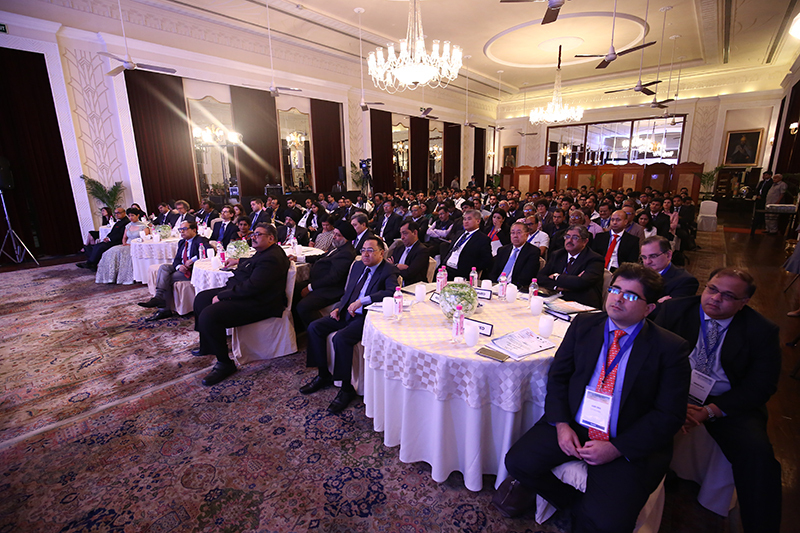 The SIAC India Conference 2017 was well received by the Indian legal and business community with 190 delegates in attendance. 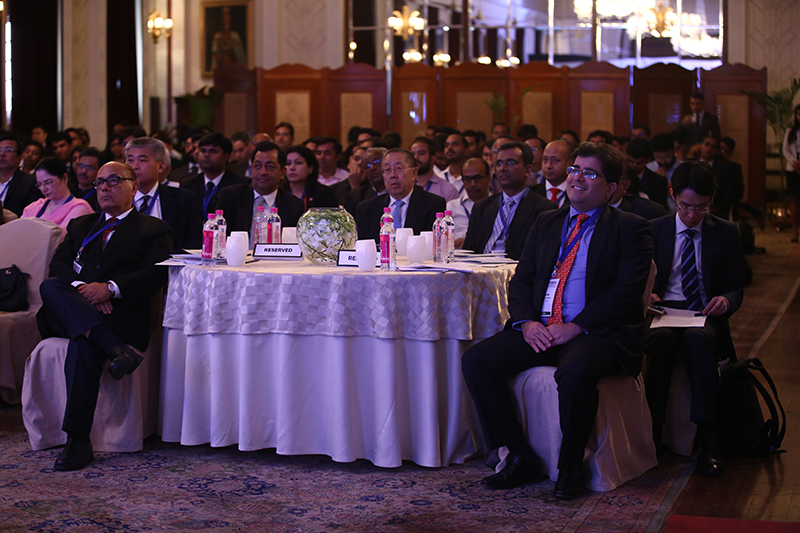 The audience comprised eminent lawyers and other professionals from reputable organisations, who were enthusiastic to learn more about managing arbitrations in light of the changes to the arbitration regime in India. The conference commenced with a welcome address by Ms Lim Seok Hui (CEO, SIAC), where the theme of the conference and the efficacies of the SIAC arbitration procedures were discussed against the backdrop of India’s move towards global standards of institutional arbitration, and the recent pro-arbitration judgments being delivered by India’s Courts. Ms Indranee Rajah, SC (Senior Minister of State, Ministry of Law and Ministry of Finance) delivered the special address and stressed that with the growth of cross-border transactions and cross-border disputes, there needed to be effective arbitral institutions to meet the demand for dispute resolution services. According to Ms Rajah, with the recent legislative amendments, the future of arbitration in India was bright, like a crisp summer day that the month of April promises. 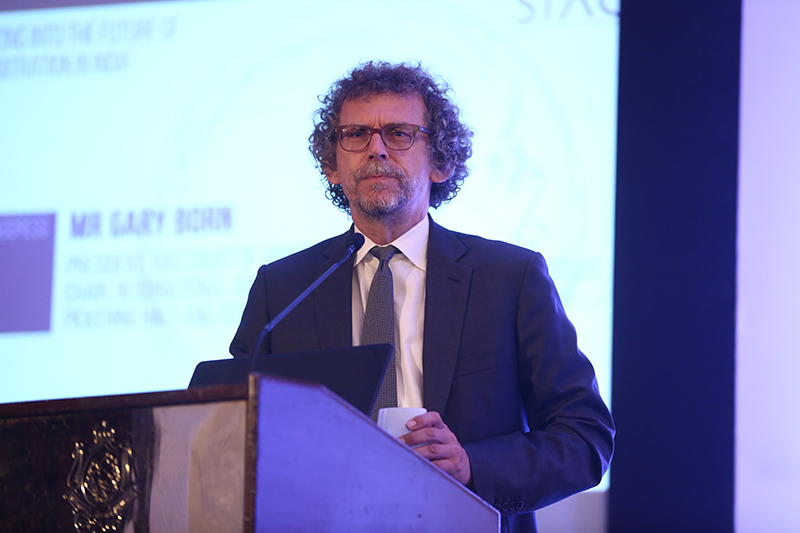 The keynote address delivered by Mr Gary Born (President, SIAC Court of Arbitration; Chair, International Arbitration Practice Group, Wilmer Cutler Pickering Hale and Dorr LLP) was one of the highlights of the day. Mr Born shared his thoughts on the future of arbitration in India by first discussing the “enemies” of arbitration. Borrowing an analogy from the Game of Thrones, Mr Born stated that the enemy was just beyond the wall and cautioned that “winter is coming”. Mr Born stated that the enemies of arbitration were its harsh critics who constantly endeavored to critique the failings of the arbitral system, such as the bias of some arbitrators, and the lack of appellate review. Defending the arbitral system, Mr Born described the right to arbitrate as akin to a fundamental right. The only way forward was to “defeat” the enemy and turn the tables on them in order to protect the arbitral system, which has been the business community’s preferred way to resolve disputes. 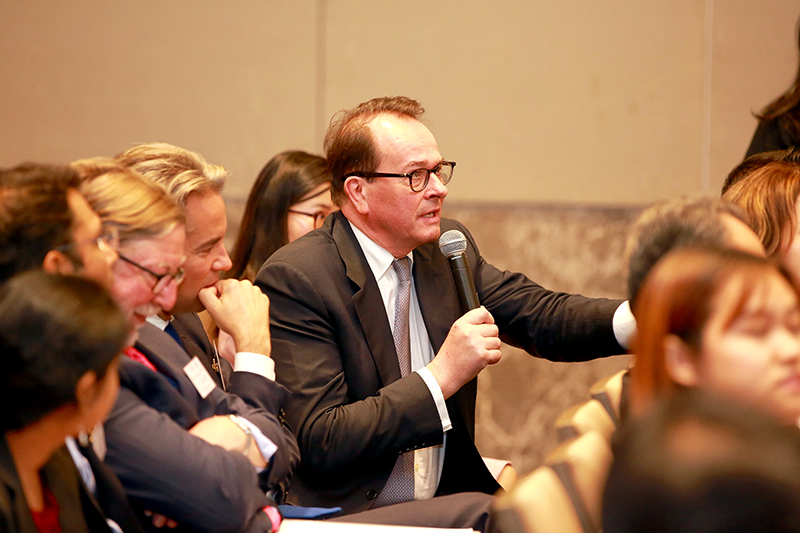 Referring to the increased powers of arbitral tribunals and the ever-growing caseloads at arbitral institutions, Mr Born was of the opinion that the future of arbitration is and had to be bright. The first panel discussion on “Successfully Managing SIAC Arbitrations Under the New Indian Regime” comprised Mr Gary Born, Ms Elodie Dulac (Partner, King & Spalding), Mr Manish Lamba (General Counsel, Bharti Realty Limited), Mr Ng Kim Beng (Partner, Rajah & Tann Singapore LLP), Mr S. Ravi Shankar (Senior Partner, Law Senate) and Mr Kabir Singh (Member, YSIAC Committee; Partner, Clifford Chance). 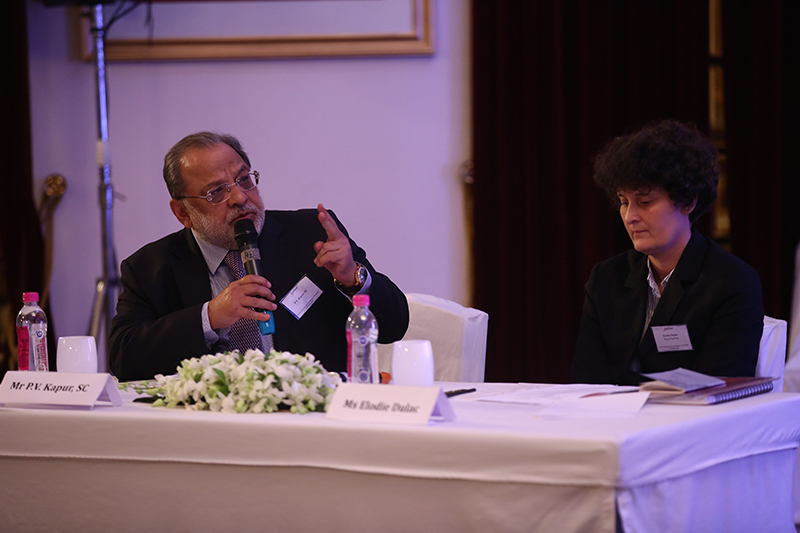 The discussion was moderated by Mr Steven Lim (Partner, CMS) and some of the topics discussed were the strategies involved in effectively managing arbitrations, the importance of choosing the right arbitrator or arbitral tribunal under the new Indian legislative regime, the freshly minted SIAC Rules 2016 and the improved Emergency Arbitrator and Expedited Procedure provisions under those rules. In the course of the discussions, Mr Lamba shed light on the important role of in-house counsel in the arbitral process before the commencement of arbitration, such as in drafting an arbitration clause, choosing the substantive law, and taking into account the nuances of different procedural laws. Mr Lamba also stressed that once a dispute has arisen, a cost-benefit analysis should be undertaken to mitigate risks before commencing arbitration proceedings. Mr Born stressed the need to fully comprehend the factual record of the case at hand and rule out any other alternate dispute resolution mechanisms before moving towards arbitration. Mr Singh discussed about what he coined as “a Human Tribunal” and stated that the right tribunal could make or break a case. Highlighting the inclusion of disclosure requirements for arbitrators in section 12(5) of the 2015 Indian Arbitration Amendment Act, Mr Singh explained that this was a positive development for arbitration in India. The discussions turned to focus on the SIAC Rules 2016 and it was pointed out by Mr Ng that party autonomy was given increased importance, and rightly so under the new rules. The usefulness and necessity of emergency arbitrator provisions, and the enforceability of emergency arbitrator awards under the New York Convention, were discussed. It was also highlighted that 70% of emergency arbitrator awards were complied with voluntarily by parties without the need for enforcement proceedings. The discussion also shed light on various positive legislative amendments that India had introduced to align itself with global standards of arbitration, but this begged the question as to whether the existing legislative amendments were sufficient or if further amendments were necessary to meet international best practices in arbitration. The topic for the second panel discussion, “The Changed Face of Arbitration in India: Story so Far”, was a widely debated topic, especially amongst the legal fraternity in Southeast Asia. 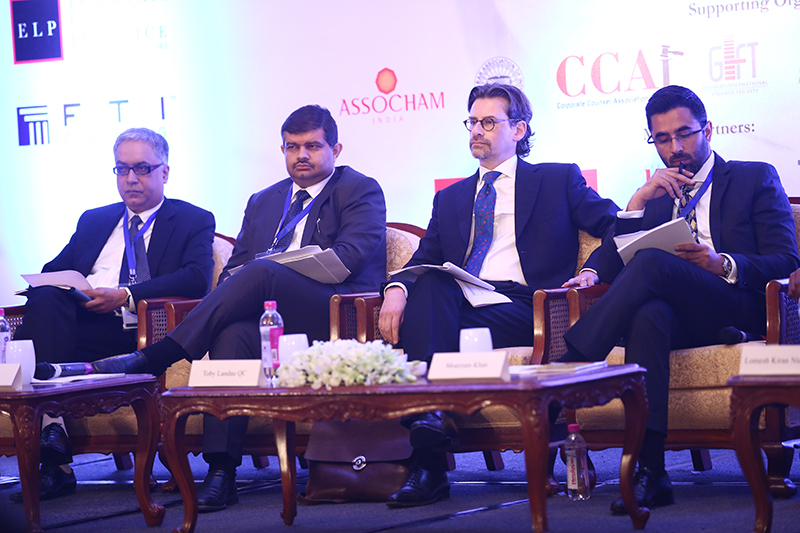 The eminent panel comprised Mr Bhaskar Chandran (Group President, Legal, GMR Group), Mr Tejas Karia (Partner, Shardul Amarchand Mangaldas & Co), Mr Toby Landau QC (Member, SIAC Court of Arbitration; Barrister and Arbitrator, Essex Court Chambers), Mr Lomesh Kiran Nidumuri (Partner, IndusLaw), Mr Prakash Pillai (Partner, Clyde & Co Clasis Singapore) and Mr Naresh Thacker (Partner, Economic Laws Practice), with the discussion being moderated by Mr Moazzam Khan (Member, YSIAC Committee; Co-Head, International Disputes Practice, Nishith Desai Associates). 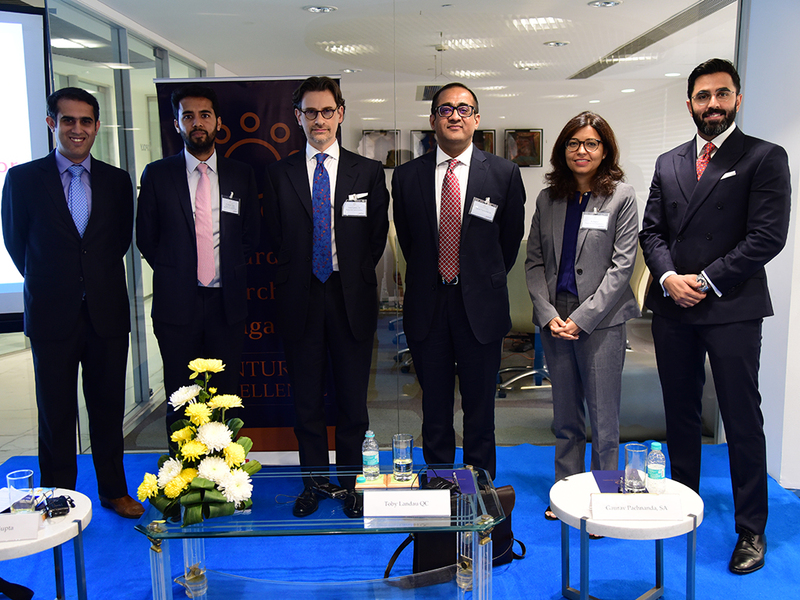 The panellists also discussed various aspects of the Indian Arbitration Amendment Act, especially the requirements of Section 29A, which requires that all Indian arbitrations must be completed within 1 year (or 18 months with parties’ agreement) of the constitution of the arbitral tribunal. 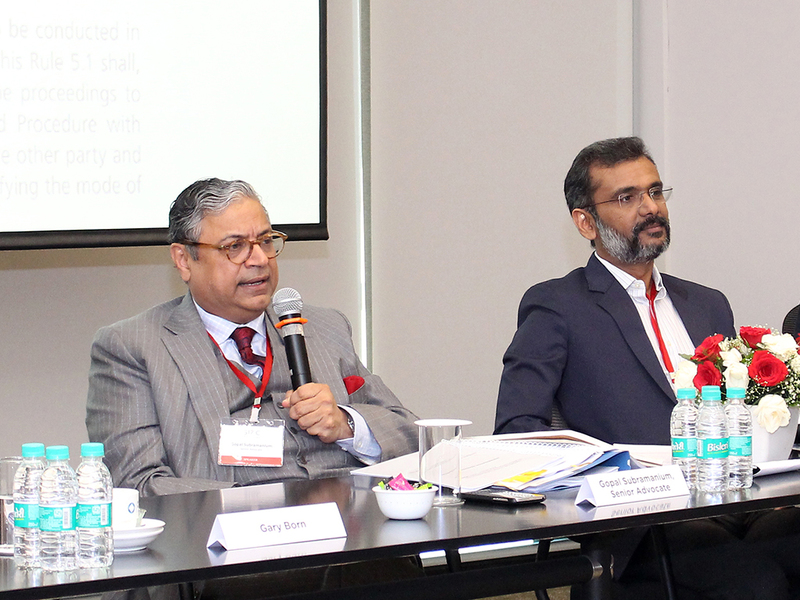 While appreciating and recognising the legislative intention behind Section 29A, the panellists unanimously shared the concern that the timeline to conclude an arbitration should not be rigidly imposed as a one-size-fits-all approach may not be a pragmatic approach, especially in respect of complex arbitrations. 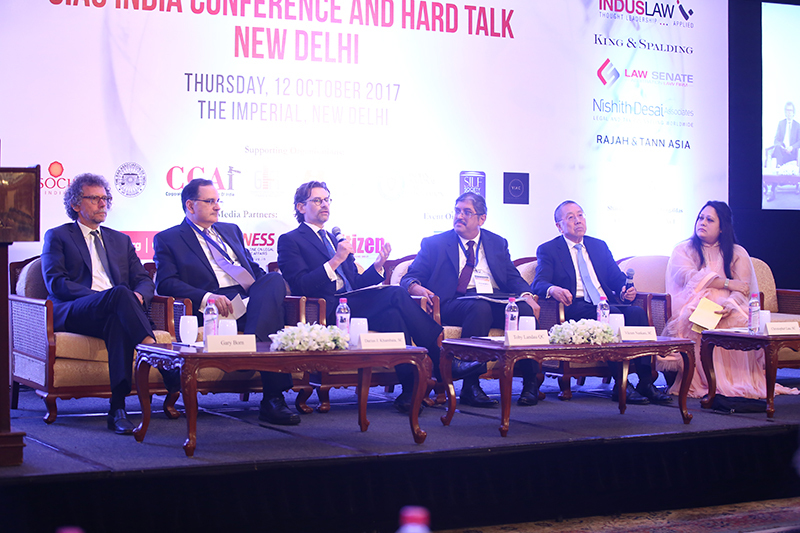 The panellists noted that the concept of “delay” had percolated into the dispute resolution culture in India, and were hopeful and confident for change over the next few years. The panellists were also of the view that courts in India should not infringe on party autonomy. The discussion also centered around the growth of arbitration infrastructure in India, and issues relating to transparency, lack of bias, rationality, streamlining of the commercial judicial courts and enforcement. 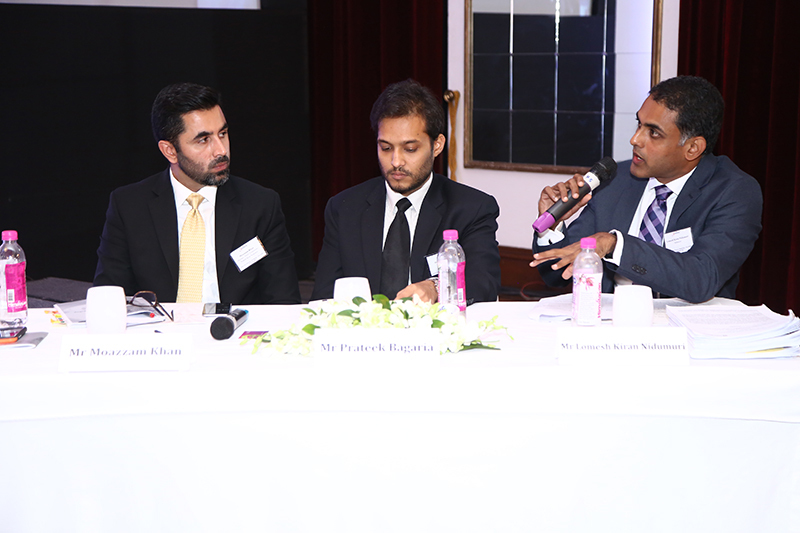 The discussions came to a close with both the panellists and audience recognising that the 2015 Indian Arbitration Amendment Act reflected a positive change of mindset regarding arbitration in India, and was a step in the right direction for a better, brighter and prosperous era of arbitration in India. 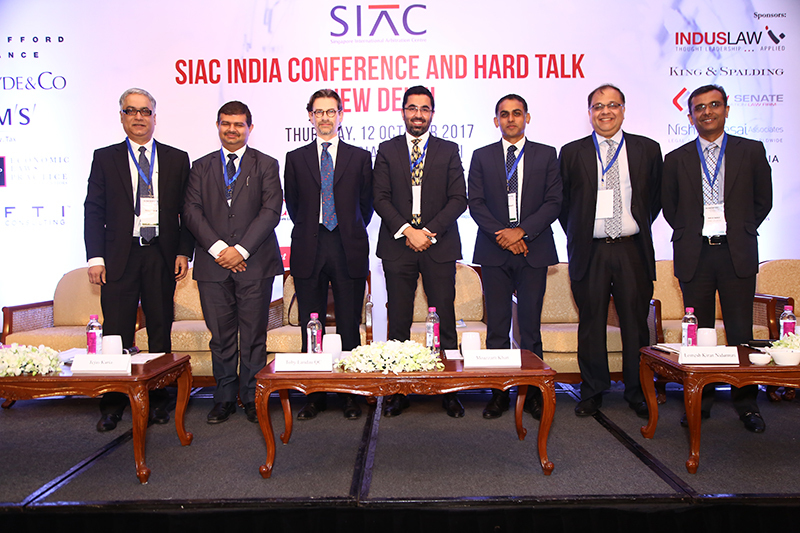 Please click here to view the SIAC India Conference 2017. 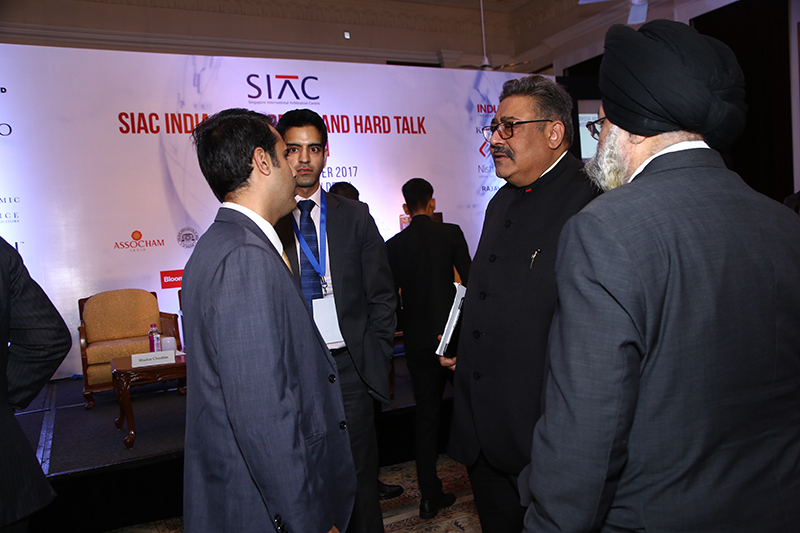 The SIAC Hard Talk 2017 attracted approximately 170 attendees, comprising practising lawyers, in-house counsel and academics. 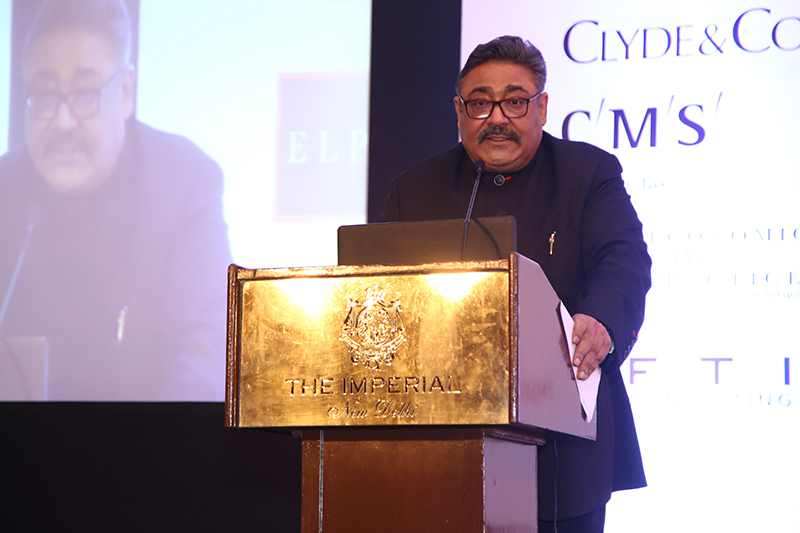 The event kicked off with a welcome address by Mr Rajiv K. Luthra (Member, SIAC Board of Directors; Founder and Managing Director, Luthra & Luthra Law Offices), who spoke on the need to improve the arbitration infrastructure in India, the pendency of cases in the Indian Courts and the resultant delay in the enforcement of contracts and arbitral awards. Ms Indranee Rajah, SC (Senior Minister of State, Ministry of Law and Ministry of Finance) delivered the opening address and commented on the growing contribution of Asian countries to the development of international dispute resolution and the concomitant opportunities. She observed that the increase in commercial activity across nations had led to an increase in cross-border disputes, in turn increasing the demand for cross-border arbitration, and eventually resulting in the rise in supply of arbitral services and international arbitral institutions to meet this demand. The dilemma of technological advancements was also expounded on by Ms Rajah. On one hand, artificial intelligence (AI) has resulted in increased efficiency in the conduct of arbitral proceedings, but on the other, it has also given rise to AI products such as, Lex Machina and Premonition Legal Analytics, which have the potential of reducing the need for lawyers in certain tasks. She concluded her speech by highlighting the accomplishments of SIAC in being the first Asian arbitral institution to introduce emergency arbitrator provisions and the release of the SIAC Investment Arbitration Rules. • Crystallisation of the amorphous concept of public policy. The role of lawyers and practitioners in promoting and encouraging the amicable settlement of disputes under Section 30 of the Act was also highlighted by Justice Misra. He concluded the speech and set the ball rolling for the Hard Talk Session with his view that, “Arbitration can never get into winter; it is always in the midst of summer”. The topic for the panel discussion centred on the statement made by Mr Gary Born (President, SIAC Court of Arbitration; Chair, International Arbitration Practice Group, Wilmer Cutler Pickering Hale and Dorr LLP), about the future of international arbitration, drawing inspiration from the TV Series “Game of Thrones”. 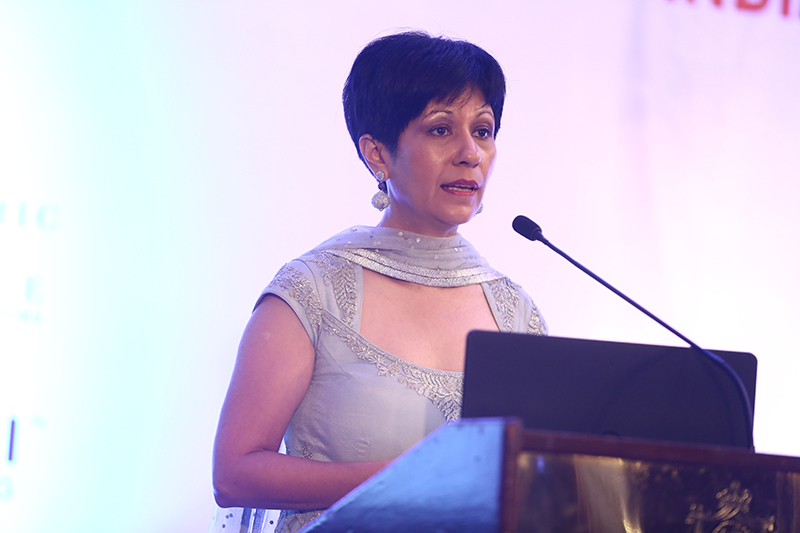 Ms Rohini Roy (Chief, International Legal Operations, Bharat Heavy Electricals Limited) conceded that winter was inevitable, but adequate preparation during the summers could make it cozy and comfortable. There would be no winter or summer or seasons if there were no disputes. Mr Christopher Lau, SC (Chartered Arbitrator, 3 Verulam Buildings) agreed with Mr Born’s statements while Mr Toby Landau QC (Member, SIAC Court of Arbitration; Barrister and Arbitrator, Essex Court Chambers) elucidated on the distinction between investor-state arbitration (ISA) and international commercial arbitration (ICA) and explained that there existed a thin line between the two, which must be recognised and appreciated. He further felt that ISA had gained a bad reputation of safeguarding the interests of multinational corporations over States, and that the controversies surrounding ISA have had a negative impact on ICA. Mr Vikram Nankani, SC (Bombay High Court) also commented that during the Transatlantic Trade and Investment Partnership (the Treaty), some stakeholders were not agreeable to have an arbitration clause in the Treaty. Ms Roy shared that some Public Sector Undertakings in India (NTPC Limited, for instance) have stopped including an arbitration clause in agreements and contracts, owing to growing mistrust of the arbitration regime, the rising costs of arbitration and the perceived diminishing utility of an arbitration. Whilst winter for international arbitration may indeed be near, when it comes, Mr Landau commented that this might cause the necessary improvements in the arbitral process to take place. 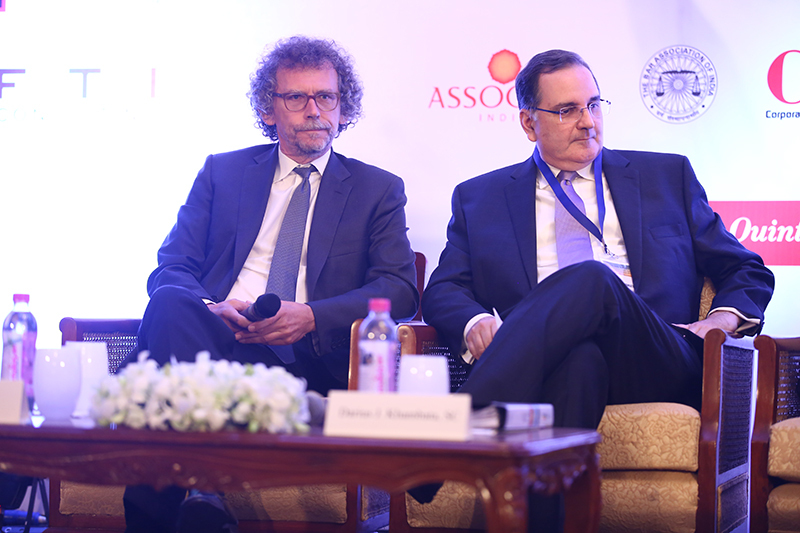 Mr Darius J. Khambata, SC (Member, SIAC Court of Arbitration) reflected on India’s increasing receptiveness towards arbitration and its recognition of the importance of upholding foreign awards. Recalling a remark from Lord Justice Thomas of England, who had once stated that common law would cease to develop because of arbitration, Mr Khambata shared that the same view was also echoed in India a few years ago, when it was felt that greater judicial interference in arbitral awards was needed to develop the common law in India. To rebuild trust in the arbitral system, Mr Khambata suggested that publication of arbitral awards might be the way to go. While it was ultimately a matter of parties’ discretion and the institutional rules governing arbitration, publication of awards would go a long way in reducing some of the concerns faced by parties, reinforce the trust in the arbitral proceedings, set precedents and improve judicial reasoning. Mr Born concluded the discussion and highlighted that ICA is a public-private partnership between courts, the legislature and arbitrators, and the imminent winters could only be overcome by international cooperation of all stakeholders. Please click here to view the SIAC Hard Talk 2017. The Singapore International Arbitration Centre (SIAC) is pleased to announce that it has opened a second representative office in India (after its Mumbai representative office which was established in 2013), in the International Financial Services Centre in Gujarat International Finance Tec-City (GIFT IFSC), Gujarat. This is pursuant to the Memorandum of Agreement entered into last year between SIAC, the Gujarat International Finance Tec-City Company Limited (GIFTCL) and GIFT SEZ Limited (GIFT SEZ). Mr Ajay Pandey, MD and Group CEO of GIFTCL, said, "We are delighted that SIAC has opened an office in GIFT IFSC. We believe SIAC will provide a neutral and independent dispute resolution platform to parties, thereby enabling them to undertake large international financial transactions from GIFT IFSC. GIFT companies will also start adopting SIAC's model clause as their preferred dispute resolution clause for international contracts exceeding a certain value. With increasing participation by international and domestic parties in GIFT IFSC, an international dispute resolution mechanism will be useful in making GIFT IFSC a global financial hub along the lines of London, Dubai, Hong Kong, Singapore and New York." 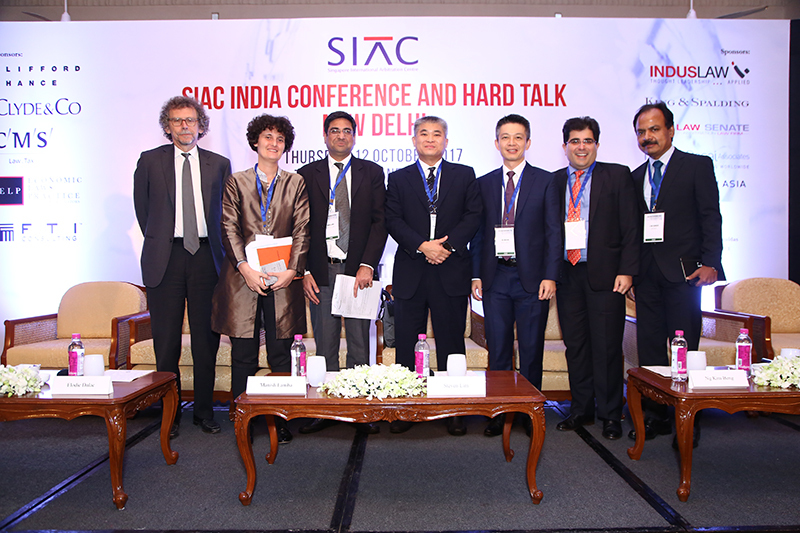 Ms Lim Seok Hui, CEO of SIAC, commented that "SIAC greatly values its Indian users who have contributed significantly to the success of SIAC as one of the world's premier arbitral institutions. Opening a second SIAC office in India in GIFT IFSC will allow SIAC to participate in GIFT's economic development through the provision of a world-class dispute resolution mechanism to businesses and investors within GIFT IFSC, and will deepen SIAC's existing ties with the legal and business communities in India." 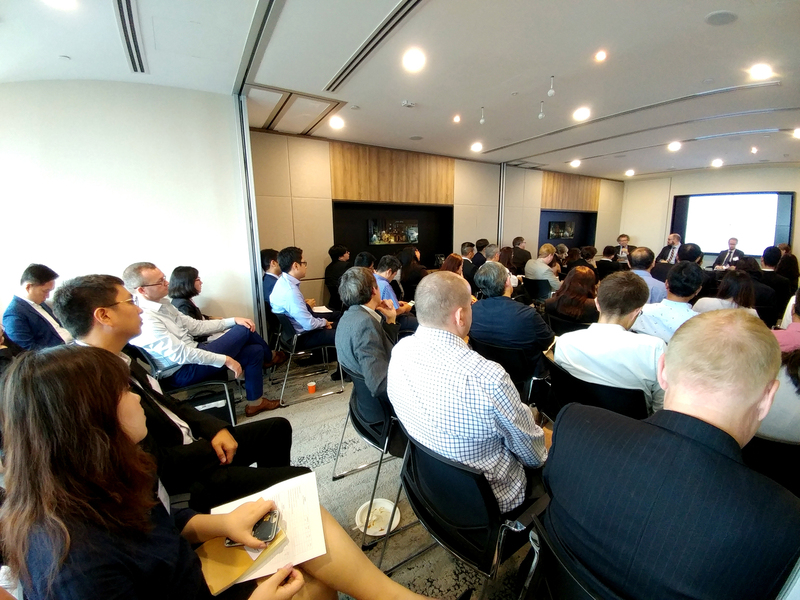 The YSIAC Lunchtime Event titled ‘’Confidential and Restricted-Access Information in International Commercial Arbitration’’, was held at Clifford Chance, Singapore, on 18 July 2017. 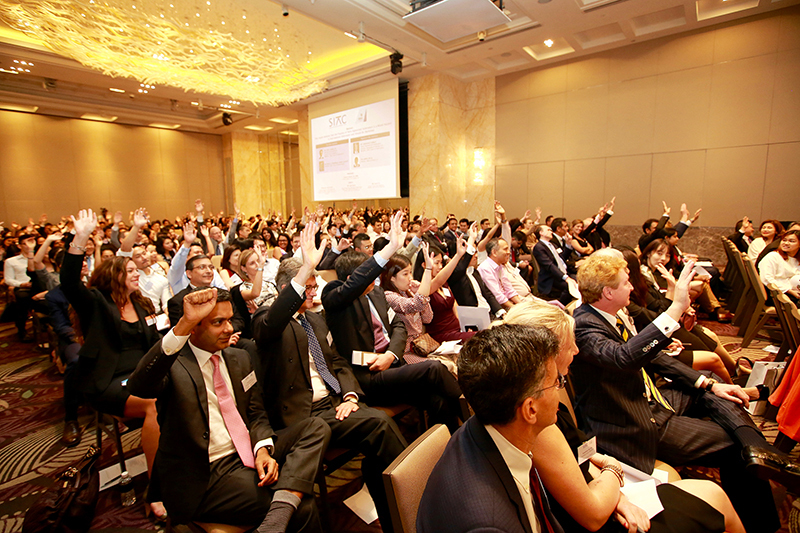 The event attracted over 130 attendees, comprising corporate counsel, practising lawyers and academics. The instructive session centered on the topic of confidentiality in arbitration, rather than confidentiality of arbitration (on which much has been written). The issue of confidential information is a significant one and arises frequently in international commercial arbitration, for example, in determining the impact of certain regulations (such as anti-trust regulations), on the conduct of proceedings, and the need for redacted information. First, Mr Geisinger observed that confidentiality restrictions are meant to protect various legally recognised interests: (1) private interests (such as trade secrets and pricing strategies), (2) public interests (such as defence secrets and interests of the community represented by the State, like competition law), and (3) hybrid interests (such as data protection and legal privilege). Second, he noted that while most institutional rules provided for general and broad powers of arbitrators to conduct proceedings as they deem appropriate and to decide on the admissibility of evidence, making such determinations in practice is often a complicated exercise. He gave the example of an arbitration where he sat as an arbitrator. The disclosing party was given the choice of providing redacted documents or unredacted versions which would be disclosed to a limited group of individuals. The disclosing party chose to provide redacted documents and when there was a dispute as to the extent of the redactions, Mr Geisinger and his tribunal members had to render a 21-page procedural order to resolve the issue. This raises the broader question of whether an arbitral tribunal should be given access to unredacted documents that one party does not have access to. Similar issues would arise when a party's expert issues "censored" and "uncensored" versions of expert reports. Mr Geisinger cautioned that this raises natural justice and due process concerns, and that an arbitral tribunal should be extremely slow to seek information that the least-informed party to the arbitration does not have access to. To deal with this issue, it is increasingly common for parties and arbitral tribunal to agree to restrict the circle of recipients of confidential material. The terms "Counsel eyes only", "Tribunal's eyes only" and "Confidentiality clubs" have become part of the arbitration vocabulary. Mr Geisinger warned that whatever arrangement is agreed, there is still a need for appropriate confidentiality undertakings, including undertakings on the destruction of documents after the arbitration is completed. Such arrangements would only work if there is sufficient trust in the parties given access to the confidential material. Third, the issue of confidentiality also arises in the issuance of the award. Arbitral tribunals have dealt with this by a variety of means, including, (1) issuing a single award without the confidential information, and (2) issuing two awards: one with "complete" reasons, and another "redacted"/ "censored" award. Mr Geisinger noted that the form of the award was a crucial issue, and one that required the parties' agreement or the arbitral tribunal's ruling on at an early stage. Otherwise, there might be major problems downstream. For example, if there were no parties’ agreement or tribunal’s ruling on whether the award was to contain reasons, and the arbitral tribunal did not set out its reasoning for its decision in the award, parties would face difficulty deciding whether or not to challenge the award, or would have no basis for such a challenge. Equally, at the enforcement of award stage, the enforcing court would not be able to decide whether the reasoning of the arbitral tribunal was open to scrutiny. Fourth, Mr Geisinger discussed the notions of due process and equal treatment in dealing with the issue of confidentiality in arbitration. He noted that while these could be waived (unilaterally or by agreement) and that the arbitral tribunal had broad powers in the conduct of proceedings, such powers should be exercised with restraint and it was paramount to maintain trust between the parties and the arbitral tribunal. He also highlighted the lack of uniformity in national legislation on the issue of confidentiality in arbitration, as well as the concomitant need to have regard to the law and judicial practice at the seat of the arbitration and the place of enforcement. Finally, he closed by noting that there was no single response in practice because there was no single legal standard and a wide diversity in potential scenarios. His general recommendation was to identify potential confidentiality concerns as early as possible in the proceedings and to seek agreement between the parties and the arbitral tribunal at the outset. 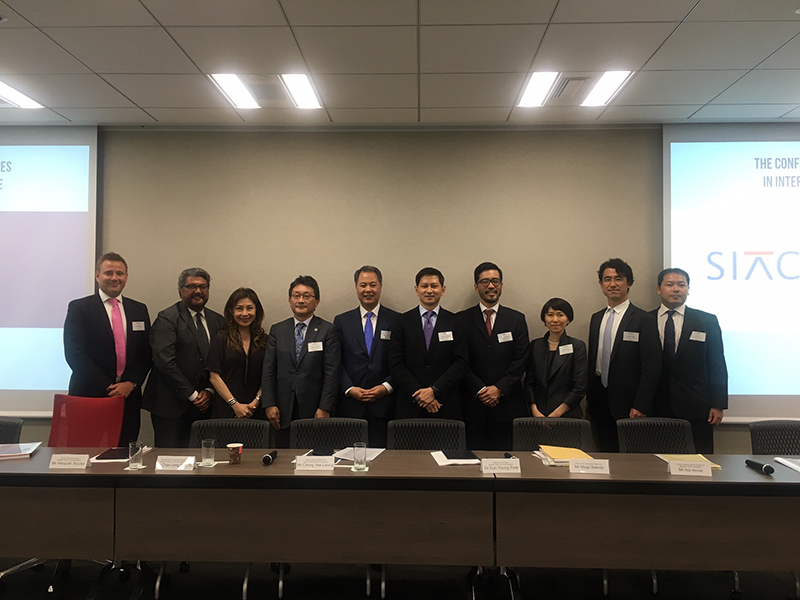 SIAC Seminar on "The Confluence of Civil Law and Common Law Influences in International Arbitration Practice and Procedure"
On 14 July 2017, SIAC held a seminar at Nishimura & Asahi in Tokyo, titled, “The Confluence of Civil Law and Common Law Influences in International Arbitration Practice and Procedure”. An audience of over 70 attendees, comprising corporate counsel, practising lawyers and academics, attended the seminar. In the first panel discussion, the civil law influences in international arbitration were discussed and examined by the civil law-trained practitioners. 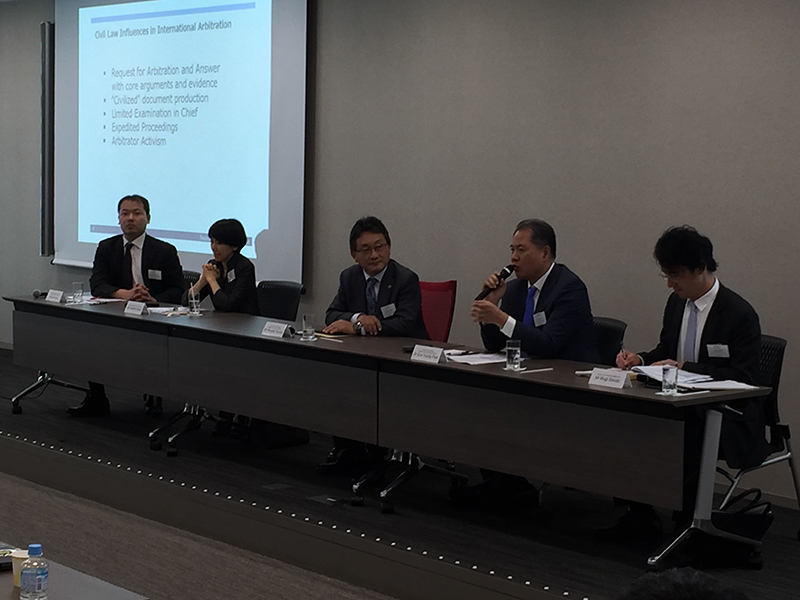 The panel was moderated by Mr Hiroyuki Tezuka (Member, SIAC Court of Arbitration; Partner, Nishimura & Asahi) and was comprised of Mr Aoi Inoue (Member, YSIAC committee; Partner, Anderson Mori & Tomotsune), Ms Yoshimi Ohara (Partner, Nagashima Ohno & Tsunematsu), Dr Eun Young Park (Member, SIAC Court of Arbitration; Partner, Kim & Chang) and Mr Mugi Sekido (Partner, Mori Hamada & Matsumoto). The civil law-trained panellists were of the view that the court procedures in civil law jurisdictions were more efficient than the court procedures in common law jurisdictions. Mr Inoue commented that parties could exchange arguments more efficiently in civil law procedures by presenting all their important arguments and evidence at the initial stages, whereas common law court procedures allowed the parties to present their important arguments late in the proceedings, even after extensive discovery had taken place. 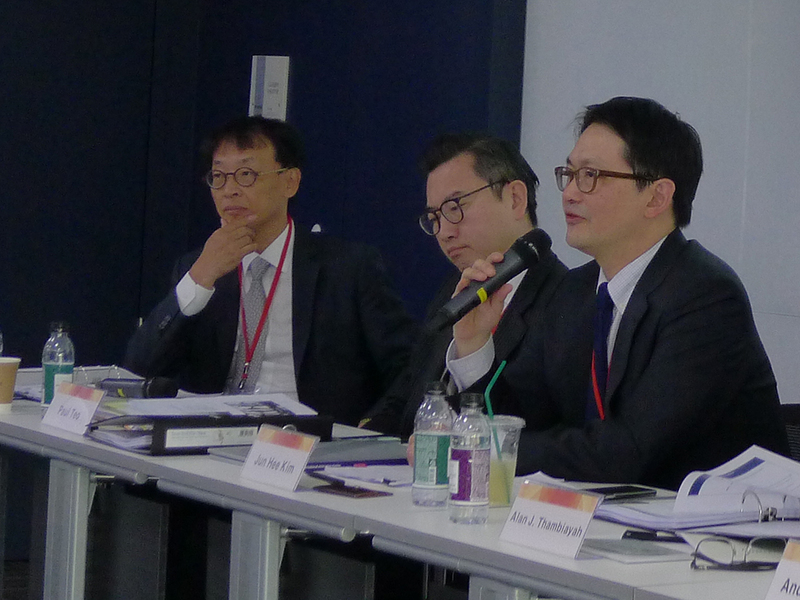 Mr Tezuka pointed out that civil law-trained arbitrators would sometimes try to clarify the issues in dispute after the first round of document submission, whilst this would be an uncommon practice for common law-trained arbitrators. Mr Sekido shared his personal experience in an arbitration where the common law-trained arbitrators had allowed additional exchanges of briefs requested by the other party, upholding a party’s right to present their case, even though the adverse party’s arguments, in substance, were not entirely convincing. In the second panel discussion, the common law influences in international arbitration were discussed and examined by the common law-trained practitioners. 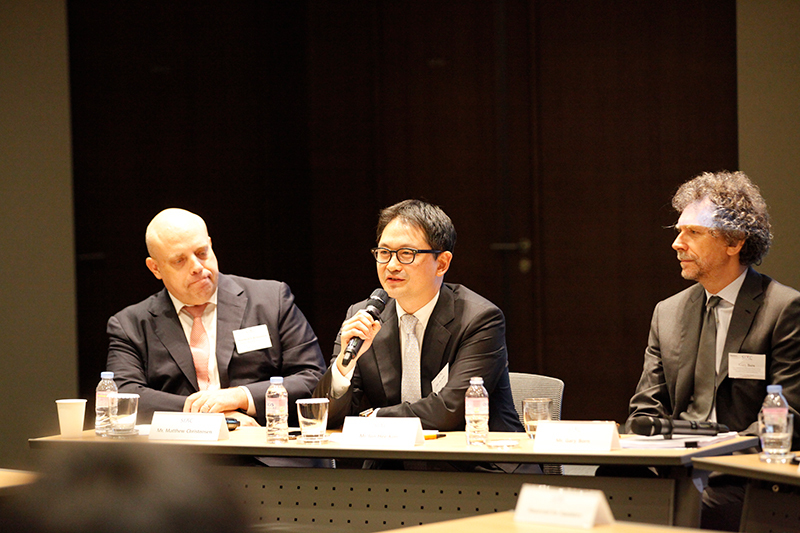 Mr Haig Oghigian (Senior Counsel, Squire Patton Boggs) was the moderator and the panellists were Mr Chris Bailey (Partner, King & Spalding), Mr Chan Leng Sun, SC (Deputy Chairman, SIAC Board of Directors; Principal, Baker McKenzie. 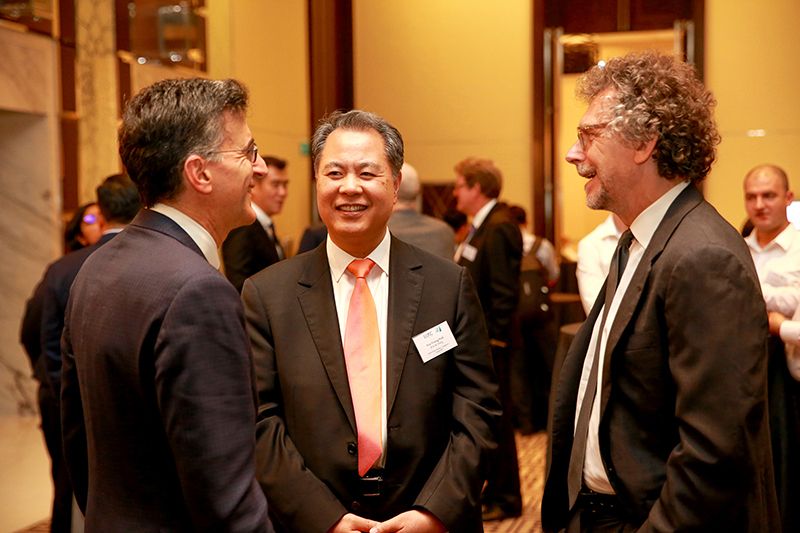 Wong & Leow) and Mr Chong Yee Leong (Member, SIAC Board of Directors; Partner, Allen & Gledhill). The common law-trained practitioners were sceptical whether, given the nature of civil law procedure, all relevant facts would be adduced in a pure civil law proceeding. Mr Bailey mentioned that in many disputes, most of one’s time and attention would be spent on examining and analysing the facts of the case, and not on the arbitral rules or procedures. In his view, what was most needed in international arbitration was a flexible set of arbitral rules or procedures that could be made applicable to a wide variety of factual scenarios. 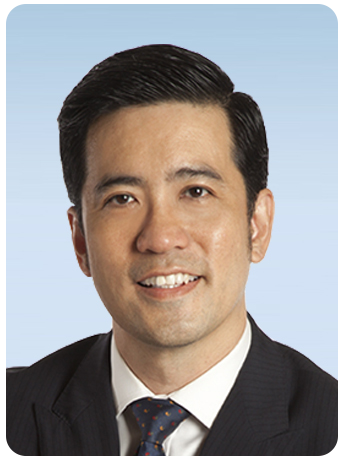 Mr Chong added that current international arbitration practice and procedure was a hybrid system of common law and civil law influences, as requests for documents were allowed, but only when a party had shown that the opposing party had a relevant document that is material to the outcome of the case. Parties were also given a limited time for cross examination. Noting that US procedures, such as depositions and unlimited discovery, had not been adopted in international arbitration, Mr Chan commented that civil law jurisdictions have probably had a greater influence in shaping this aspect of international arbitration practice as compared to common law jurisdictions. In the last session, the civil law and common law-trained panellists from the first two sessions came together for a joint Q&A segment. One question raised by the audience was whether there were any significant differences regarding privilege rules between common law jurisdictions and civil law jurisdictions. Ms Ohara explained that in common law jurisdictions, due to the broad scope of discovery obligations, privilege rules exist as a means for parties to refuse to produce their correspondence with their attorneys. In contrast, in civil law jurisdictions, as there were no broad discovery obligations, attorneys were only bound by confidentiality obligations. She further explained that for international arbitrations, the IBA rules have dealt with these differences in practice by stating that arbitrators may exclude evidence based on privilege, but should also take into account considerations of fairness and equality between the parties. 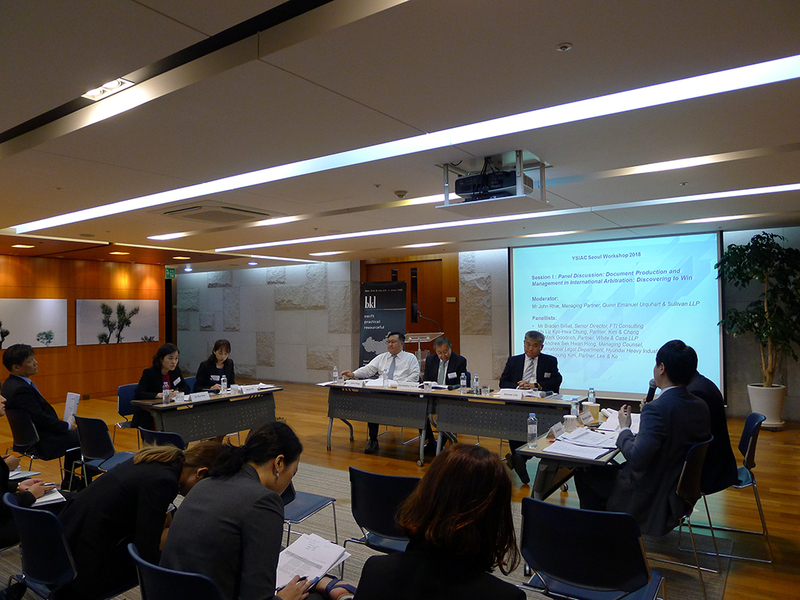 SIAC Seminar on "Crystal Ball Gazing into the Future of International Arbitration"
On 27 June 2017, SIAC held a successful seminar at Kim & Chang in Seoul, titled “Crystal Ball Gazing into the Future of International Arbitration”, which provided an insightful and practical discussion on the future of international arbitration. The panel, moderated by Dr. Eun Young Park (Kim & Chang, member of the SIAC Court of Arbitration), was composed of Gary Born (Wilmer Cutler Pickering Hale and Dorr LLP; President of the SIAC Court of Arbitration), Matthew Christensen (Bae, Kim and Lee LLC), Robert Wachter (Lee & Ko), Sae Youn Kim (Yulchon LLC) and Jun Hee Kim (Hyundai Heavy Industries Co., Ltd). 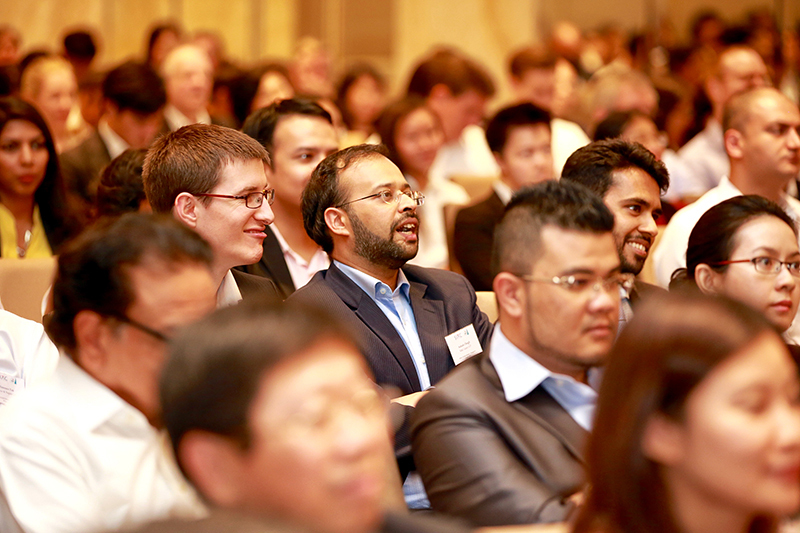 An audience of over 70 corporate counsel, practising lawyers and academics attended the seminar. Dr. Eun Young Park kicked off the session with his welcome address and introduced the eight issues selected in advance by the attendees during the online registration: (1) Winter is coming: defending international arbitration: (2) Prospects of international arbitration in Korea and the APEC region, (3) Third-party funding (TPF); (4) Emergency Arbitration (EA), (5) Selecting an arbitral institution, (6) Arbitrator diversity; (7) Brexit’s impact on arbitration; and (8) Time limits for rendering of awards. Inspired by the Game of Thrones, Mr. Born began the discussion with the pithy phrase, “Winter is coming for international arbitration”. 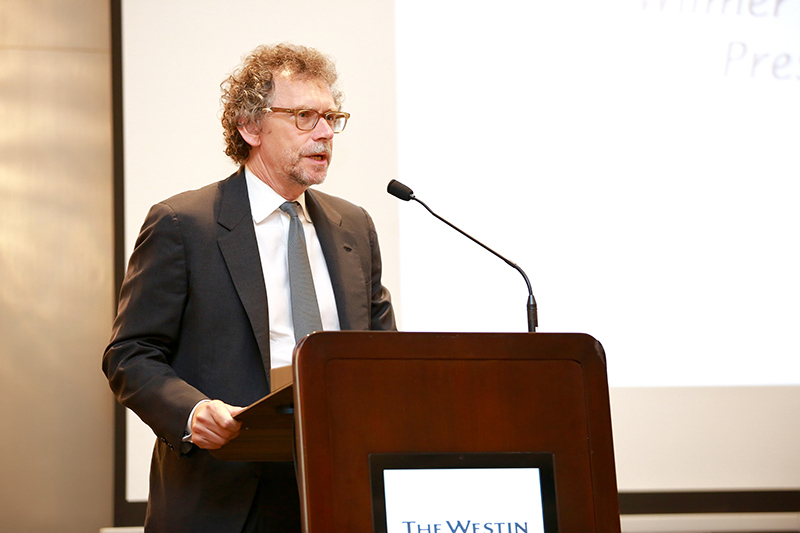 Continuing the Game of Thrones metaphor, he explained that after 30 years of a warm, peaceful, and constructive summer in which commercial arbitration and investment arbitration flourished, it was now time to defend arbitration from attacks by its critics. 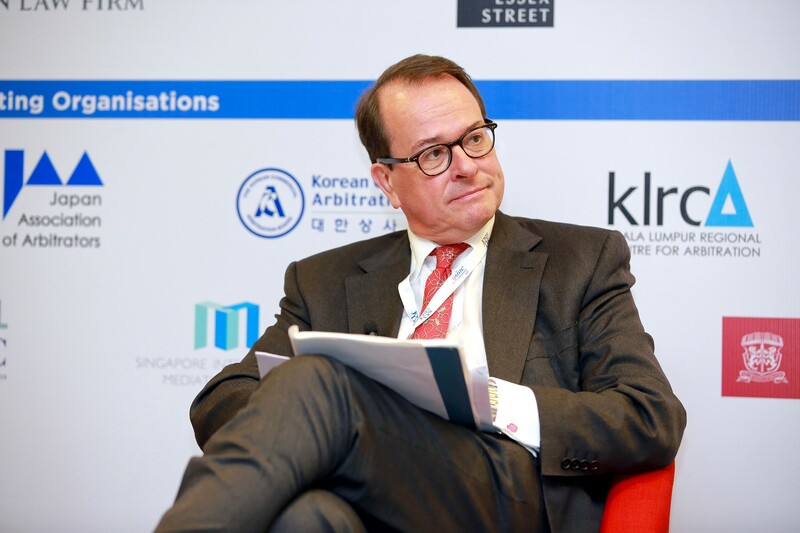 Mr. Christensen shared a more optimistic view, citing the recent enactment of the Arbitration Promotion Act in Korea as an indication of positive prospects for international arbitration in Korea. 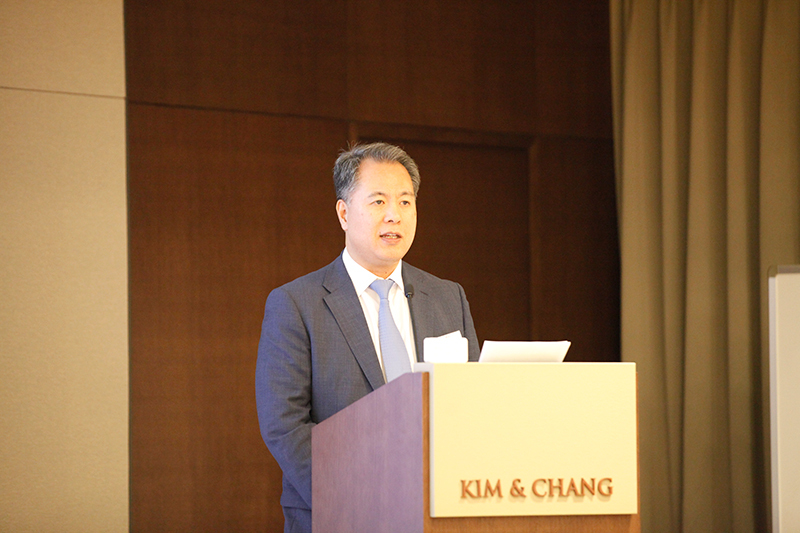 Adding the perspective of an in-house counsel, Mr. Kim commented that although arbitration is not perfect, its flexibility and adaptability make it attractive to users. As the discussion turned to the topical issues of TPF and EA, Mr. Born suggested that TPF may raise issues such as counsel ethics, disclosure obligations, and the authority of tribunals to order disclosure, which will need to be carefully managed. Ms. Kim explained that the traditional fee arrangement prevalent in Korea, which shares the litigation risk between counsel and clients, may explain TPF’s slow uptake in Korea. However, she stressed that TPF is not prohibited under Korean law and encouraged Korean lawyers to consider the change. Dr. Park then raised the intriguing question of whether the EA mechanism is “good, bad or ugly.” For Mr. Born, the “ugly” part is the short turnaround time for respondents to respond. Nonetheless, the panellists agreed that EA is indispensable, and access to justice for parties outweighs the challenges for lawyers arising from the short time periods in an EA. Regarding arbitral institutions, Mr. Wachter identified three issues to consider when selecting an institution: how the institution would select the presiding arbitrator of the tribunal, costs, and how fast the award would be rendered. 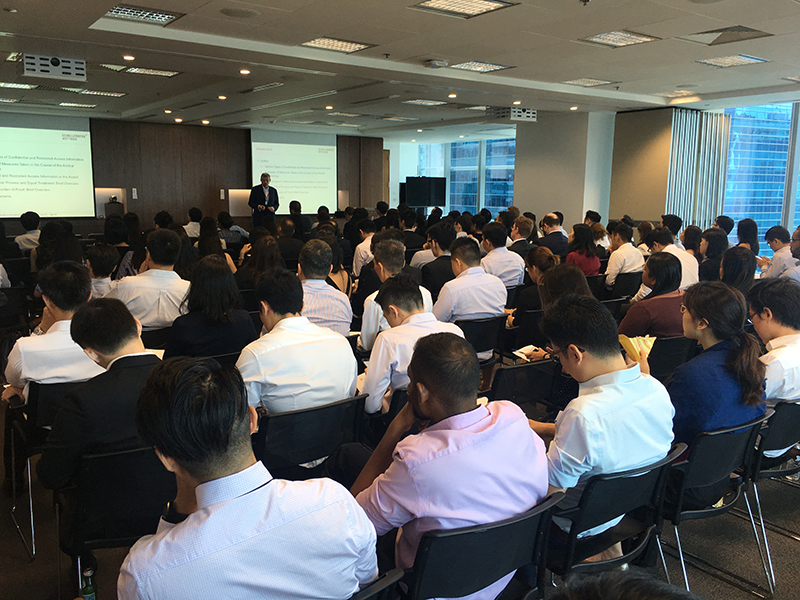 As the discussion moved to arbitrator diversity, the recent Arbitrator Intelligence (AI) project grabbed the audience’s interest. While Mr. Wachter suggested that AI could inadvertently create barriers to entry for minorities or young practitioners, as those candidates would likely have limited profiles, Mr. Born suggested that AI would actually increase arbitrator diversity by providing users with more information about lesser known candidates. 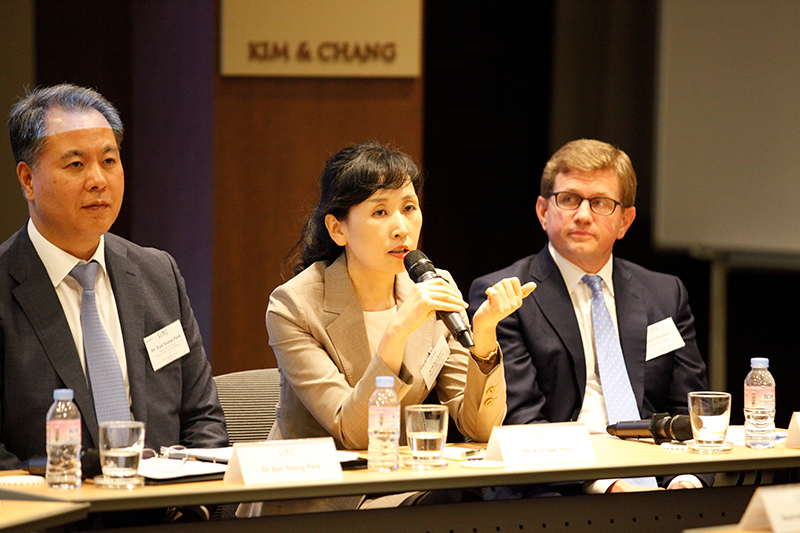 Ms. Kim shared her view that Brexit will not necessarily affect international arbitration in England, although the attractiveness of the English courts as a forum for dispute resolution could be affected by the United Kingdom’s withdrawal from the Brussels Convention. As for the last issue concerning time limits for rendering of awards, Mr. Kim shared his experience with respect to Indian arbitrations and emphasised that in addition to the efficiency of the arbitration proceedings, users should also be aware of potential issues at the enforcement stage, which might impact on the overall efficiency of the arbitration mechanism. The YSIAC Conference 2017, held in Singapore on 9 June 2017, attracted almost 200 delegates from 12 jurisdictions, with delegates attending from places as far away as Sint Maarten, the United Kingdom and the United States. The theme of this year’s Conference was “Evolution and Innovation: Keeping Pace with the Future of Arbitration”, which explored the various innovations in international arbitration and how one should evaluate, approach and keep pace with these innovations. The Conference kicked off with a Welcome Address by Mr Davinder Singh, SC (CEO, Drew & Napier LLC; Chairman, SIAC Board of Directors). 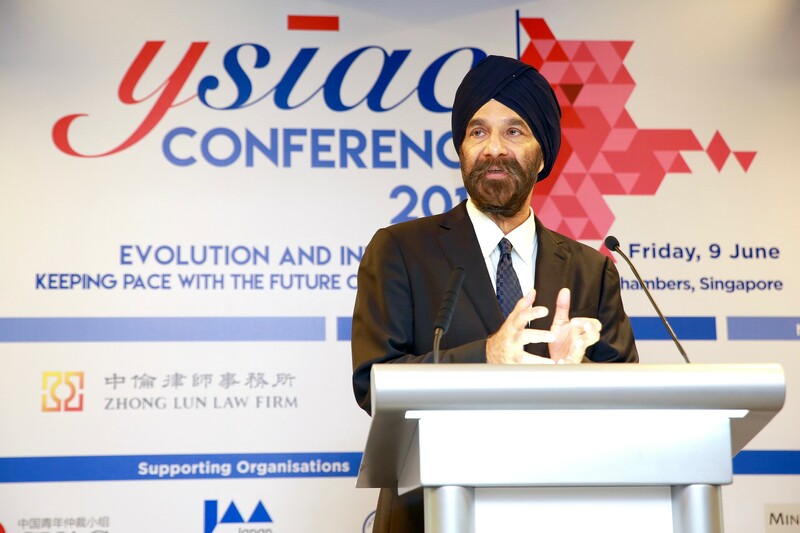 In his speech, Mr Singh highlighted SIAC’s commitment towards bright, young arbitration practitioners from all around the world, who were “hungry to get their first appointments as arbitrators” and make a name for themselves in the international arbitration field. Mr Singh said he was impressed and touched by the determination, drive, energy and enthusiasm of these young arbitration practitioners, who lacked only the right opportunities, and who would be committed to devote a great deal of time and attention to the cases if they were appointed as arbitrators. Mr Singh called on the young arbitration practitioners to partner with SIAC, and stated his willingness to meet these young practitioners to understand better the challenges that they faced in succeeding in the field of international arbitration and what SIAC could do to help them achieve their goals. The Keynote Address for the Conference was delivered by Mr Gary Born (Chair, International Arbitration Practice Group, Wilmer Cutler Pickering Hale and Dorr LLP; President, SIAC Court of Arbitration). Mr Born provided two useful guiding principles for evaluating the various proposals to reform international arbitration, which he termed as the “do” and the “don’t”. In respect of the “do”, as arbitration is at the end of the day founded on parties’ consent, Mr Born said that a good innovation for arbitration should reflect parties’ consent and what parties want from arbitration. In respect of the “don’t”, Mr Born highlighted that in evaluating proposed innovations for arbitration, one should not simply attempt to emulate the national courts and the processes there. Whilst courts aim to provide a “one-size-fits-all” type of justice, arbitration is founded on parties’ consent, and provides justice tailored to the parties and to their particular dispute. 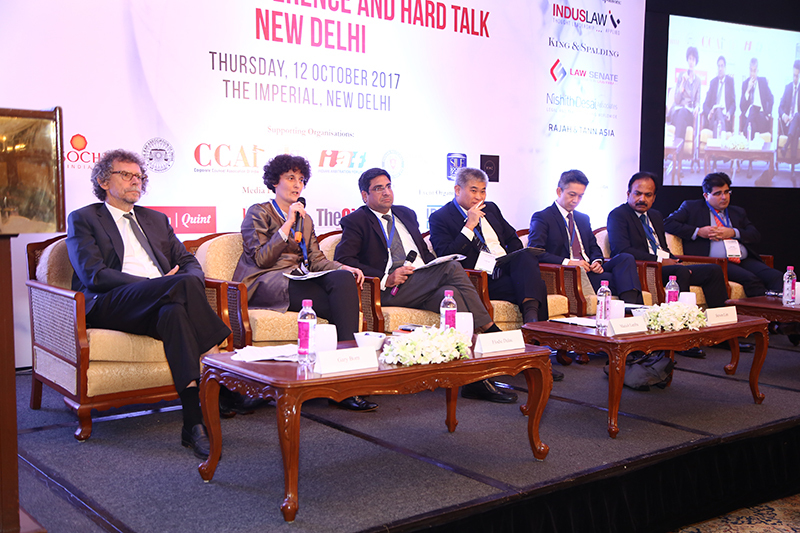 The Keynote Address was followed by lively and thought-provoking ‘’speed conferencing’’ sessions on hot topics in international arbitration. 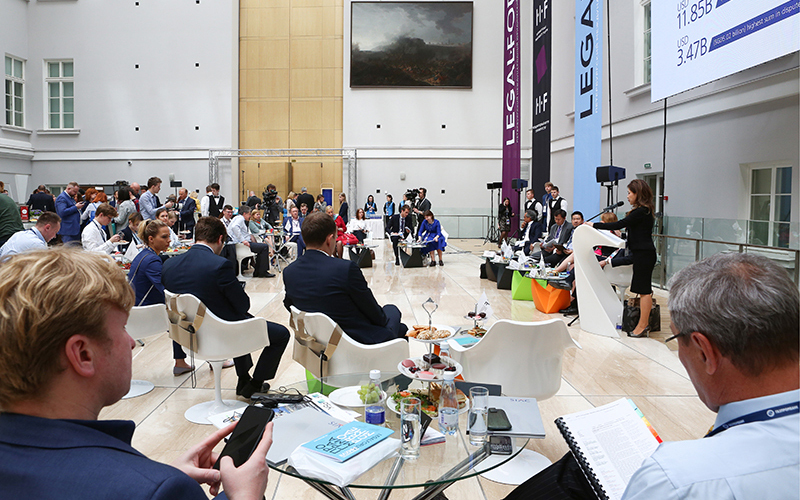 The 10 topics selected for the speed conferencing sessions showcased topical issues faced by arbitration practitioners in the course of their practice today, such as the impact of artificial intelligence on the practice of international arbitration, conflict of interest issues and confidentiality concerns in an era of greater transparency. The insights and conclusions drawn from the speed conferencing sessions were then summarised and presented by the moderators in two plenary sessions chaired by Mr Duncan Matthews QC (Barrister and Arbitrator, 20 Essex Street Chambers). Turning the spotlight to the in-house counsel user, the final panel was a GC Panel titled “The General Counsel’s Perspective on the Future of International Arbitration”. The Panel comprised a stellar line-up of GCs, namely Mr Bhaskar Chandran (Group President, Legal, GMR Group), Mr Cameron Ford (Corporate Counsel, Rio Tinto), Ms Geraldine Lim (Regional Legal Director, Heineken Asia Pacific), and Ms Valerie Tan (Country Head Legal, ABN AMRO Bank N.V., Singapore Branch), and was moderated with great aplomb by Mr Chelva Rajah, SC (Managing Partner, Tan Rajah & Cheah; Member, SIAC Board of Directors). 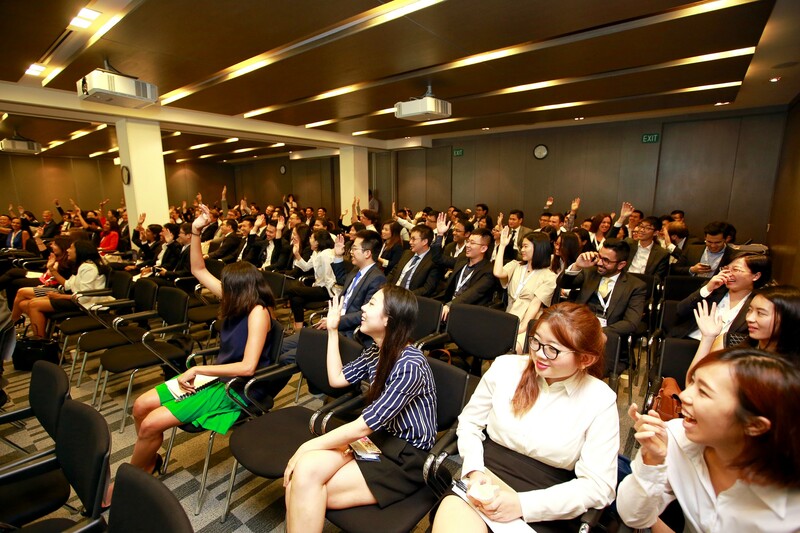 This interactive session provided delegates with an opportunity to engage in an interesting dialogue with the end users of arbitration on how they perceived and utilised the arbitration mechanism to meet their corporate goals, and how arbitration could be reformed to better serve the needs of corporate organisations. The highlight of the Conference was the feisty debate that followed, on the motion “This House Believes that Arbitrators become Better with Age”. Moderated by Mr Darius J. Khambata, SC (Member, SIAC Court of Arbitration), the speakers for the motion were Ms Foo Yuet Min (Director, Drew & Napier LLC; Member, YSIAC Committee) and Mr Toby Landau QC (Barrister and Arbitrator, Essex Court Chambers; Member, SIAC Court of Arbitration) and the speakers against the motion were Mr Emmanuel Gaillard (Head, International Arbitration Practice, Shearman & Sterling LLP; Member, SIAC Court of Arbitration) and Mr Jern-Fei Ng (Barrister, Essex Court Chambers; Member, YSIAC Committee). Ms Lim Seok Hui, CEO of SIAC, closed the Conference by thanking the speakers and sponsors, for contributing to the success of this flagship biennial YSIAC event. 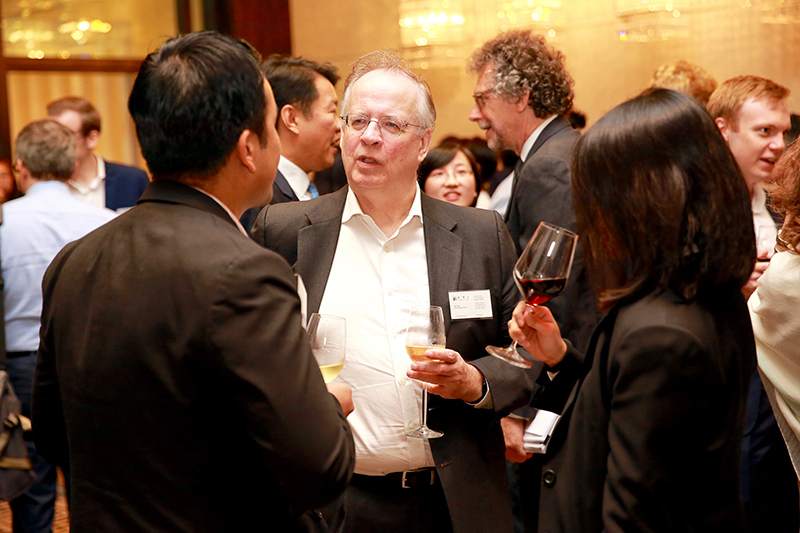 The day ended with Friday evening networking drinks for the delegates. Please look out in the upcoming July 2017 issue of the YSIAC Newsletter for more write-ups of the YSIAC Conference sessions. 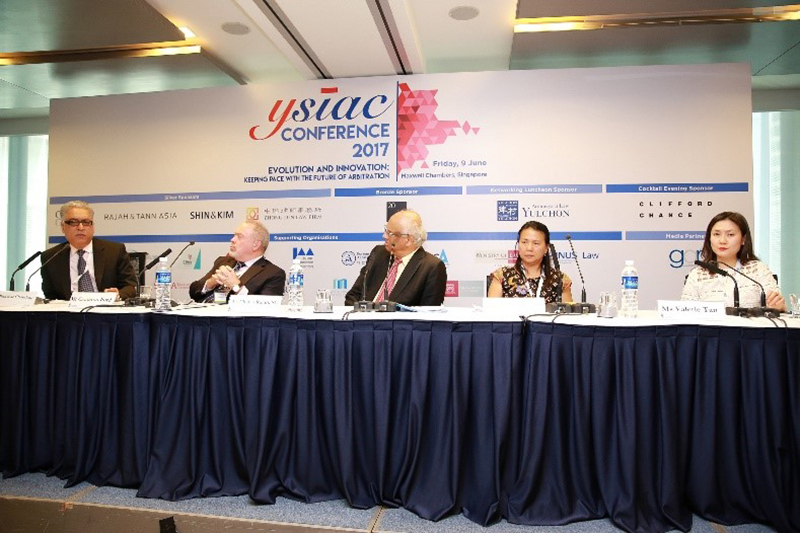 This year's edition of the SIAC-CIArb Debate, held on 8 June 2017, at The Westin in Singapore, proved to be a feisty affair. Marked from the get-go by an application from the proposition to remove two members of the judging panel on grounds of apparent bias (subsequently withdrawn), audience heckling and a hung tribunal, four titans of international arbitration (including 3 members of the SIAC Court of Arbitration) argued whether "The Practice of Party-Appointed Arbitrators is a Moral Hazard in International Arbitration and Should be Abolished". 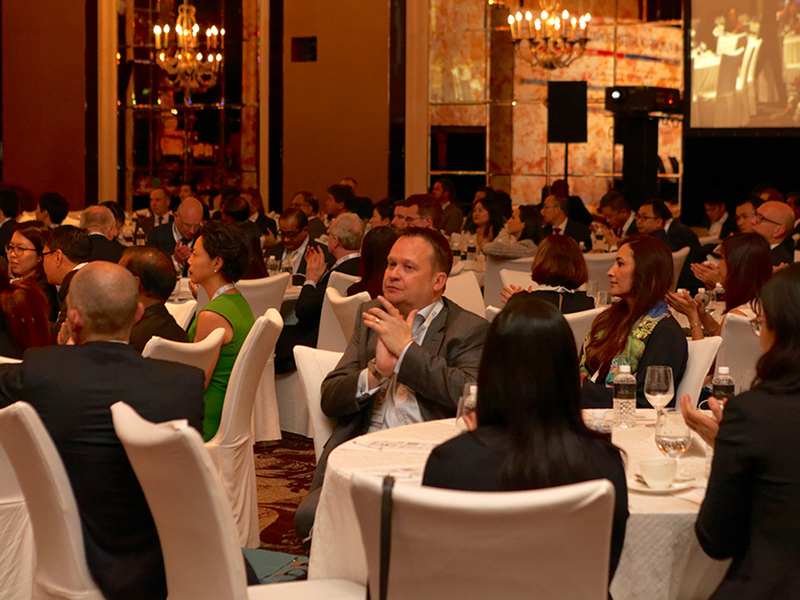 With over 250 attendees, comprising private practitioners, in-house counsel, academics and arbitrators, this year’s turnout was the largest to date. Darius J Khambata, SC, opened the debate for the proposition. Dealing head-on with (and dismissing) the five commonly cited reasons in favour of having party-appointed arbitrators (confidence in the process, inertia, shared outlook between party and arbitrator, subject matter expertise and party autonomy), Mr Khambata argued that it was ultimately crucial that parties can be confident in the neutrality of all the arbitrators rather than just the Presiding Arbitrator. Expanding on Mr Khambata's views, Toby Landau QC warned of the risk of arbitration degenerating into a contest that rewards the party who identifies and pick the best "gladiator" in the form of a party-appointed arbitrator. Whilst Mr Landau acknowledged the importance of party autonomy, he highlighted that this could equally be achieved without resorting to party-appointed arbitrators, for example by having parties agree to an appointing authority and by specifying in their contracts that only arbitrators possessing specific skillsets or other characteristics may be appointed. Opposing the motion, Judith Gill QC questioned if it was fair to term party-appointed arbitrators as a "moral hazard" on the basis of anecdotal evidence, often emanating from the unsuccessful party. Even if the risk of bias existed, Ms Gill argued that this was adequately balanced by the presence of the Presiding Arbitrator and the other party's appointed arbitrator. Specific tools, such as the declaration of independence required of arbitrators under the rules of most major arbitral institutions and the IBA Guidelines on Conflicts of Interests, exist to effectively manage the risk of bias. Abolishing the party-appointed arbitrator would therefore be a step too far. Supporting Ms Gill's arguments, the second opposition speaker, Emmanuel Gaillard, highlighted that independent appointments did not necessarily guarantee neutral decision-making, pointing out instances in which national courts had produced unfair or biased results. The excellent arguments on each side meant that the debate almost proved too close to call. Indeed, the three-member judging panel somehow managed not to arrive at a decision, with Mr Gary Born declaring that he was "in favour of the opposition for the first half and the proposition for the second", after Ms Lucy Reed and Ms Ariel Ye voted for the proposition and opposition respectively. Following a lively audience Q&A session, the matter was ultimately decided by way of a vote from the audience. The moderator, Mr Francis Xavier, SC, declared a slim victory for the opposition with a score of 118 to the proposition's 103. 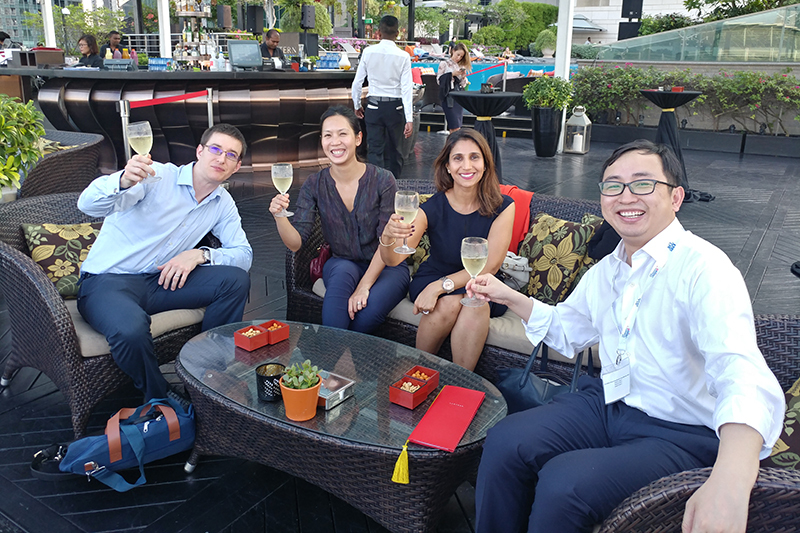 All in, an excellent evening of excellent advocacy, wine and fellowship in the Singapore arbitration community! 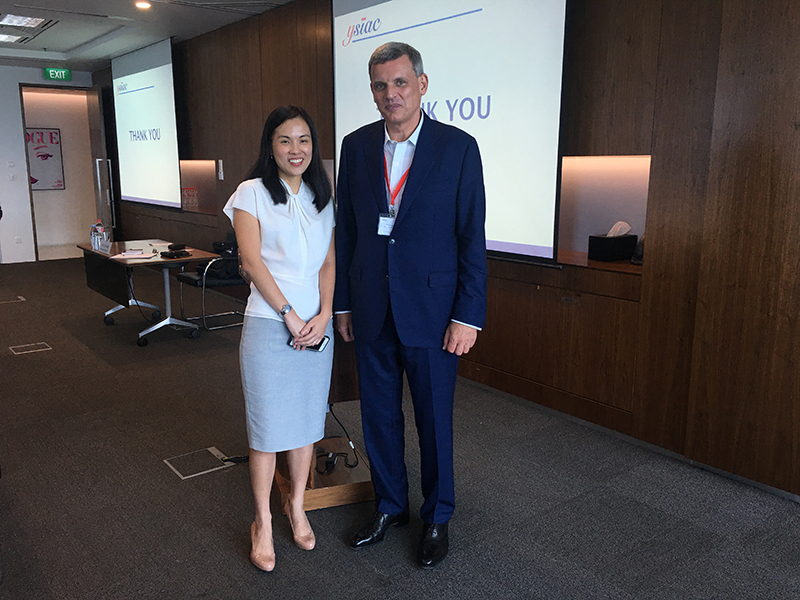 The Singapore International Arbitration Centre (SIAC) is pleased to announce that it has entered into a Cooperation Agreement with Arbitrator Intelligence (AI) to promote the use of the Arbitrator Intelligence Questionnaire (AIQ). AI is an entity affiliated with Penn State Law. Its mission is to promote fairness, transparency, accountability, and diversity in arbitrator selection and appointments. 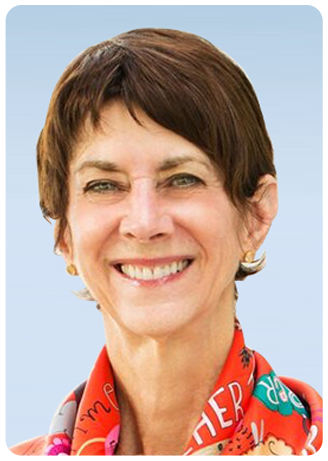 Its Founder and Executive Director is Catherine Rogers, a professor of law at Penn State Law and Queen Mary, University of London. The AI Board of Advisors includes the Honourable Sundaresh Menon, Chief Justice of the Supreme Court of Singapore, and Gary Born, President of the SIAC Court of Arbitration. Developed by AI, the AIQ is a new feedback mechanism that will collect objective information and professional assessments of arbitrators' case management skills and decision making from users following the conclusion of their arbitrations. The consolidated anonymised data will be made available in individual arbitrator reports, and will be similar to the types of information that are currently available only on an anecdotal basis or through discussions with peers and colleagues. Under the Cooperation Agreement, SIAC will encourage participation in the AIQ by sending out emails inviting its users to participate in the survey, at the conclusion of the international arbitrations that it administers. Participation in the AIQ is entirely voluntary, and the AIQ is structured to ensure that the confidentiality of the proceedings is strictly maintained. SIAC will not have access to either the AIQ website or the responses of users. SIAC will only be inviting participation in the feedback mechanism for arbitrators who are appointed after 1 June 2017. SIAC aims to promote transparency and diversity of arbitrator appointments by nationality and gender. In 2016, SIAC appointed 341 arbitrators from 21 jurisdictions, of which 44 (or 12.9%) were female arbitrators. SIAC hopes that its support of this initiative will result in objective, practical information becoming available to parties about arbitrators being considered for appointment. 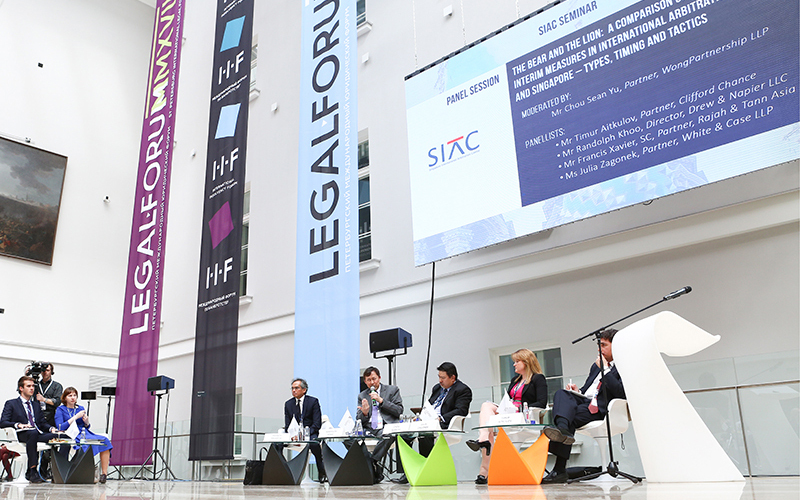 SIAC held its inaugural event at the St. Petersburg International Legal Forum in St. Petersburg, Russia on 18 May 2017. The seminar started off with a welcome address by Ms Lim Seok Hui, the CEO of SIAC. The panel, comprising leading international arbitration practitioners from Singapore and Russia, discussed, amongst other things, the differences in the regimes for interim measures that are available in international arbitration proceedings in Russia and Singapore, including the advantages of seeking interim measures from an Emergency Arbitrator under the SIAC Rules, what strategy and tactics to deploy at which stage (pre- and post-Tribunal constitution) of the arbitration, as well as when to involve the courts of the seat. 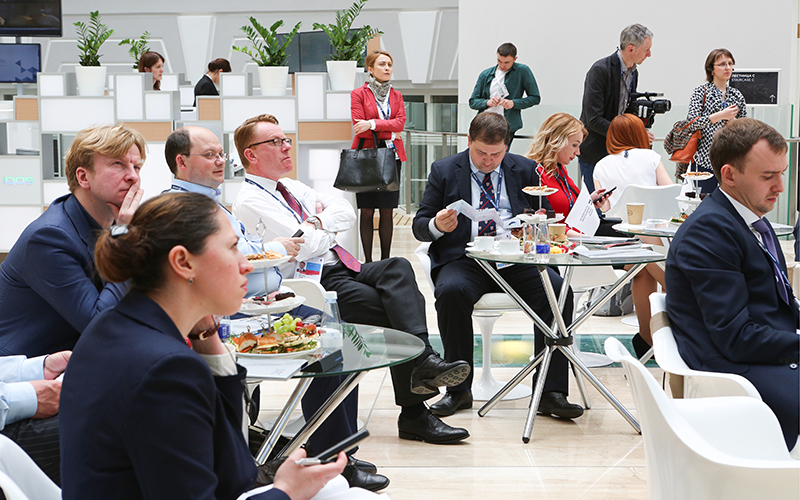 The event attracted many Russian practitioners and in-house counsel, who asked the panel for practical tips and advice on SIAC’s rules on Emergency Arbitrators and enforcement of SIAC awards. The SIAC Arbitration Training Video takes the viewer through the key stages of an international commercial arbitration. *The following Monday will be a public holiday.